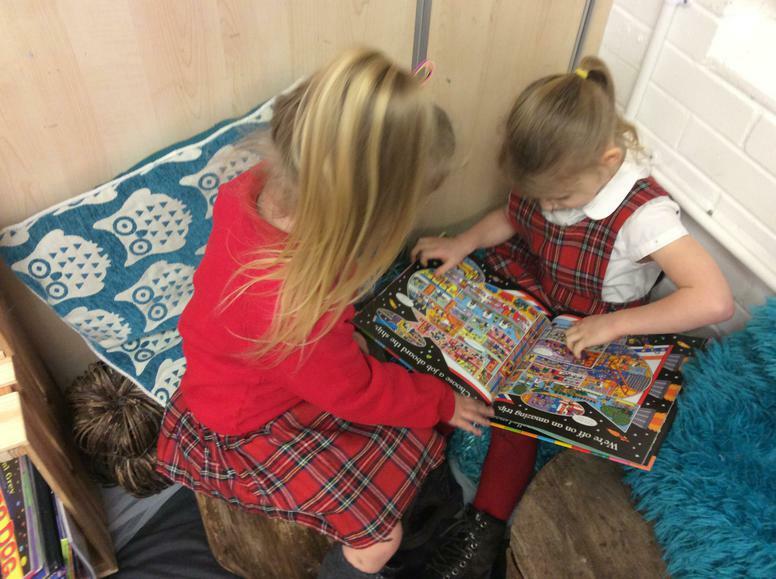 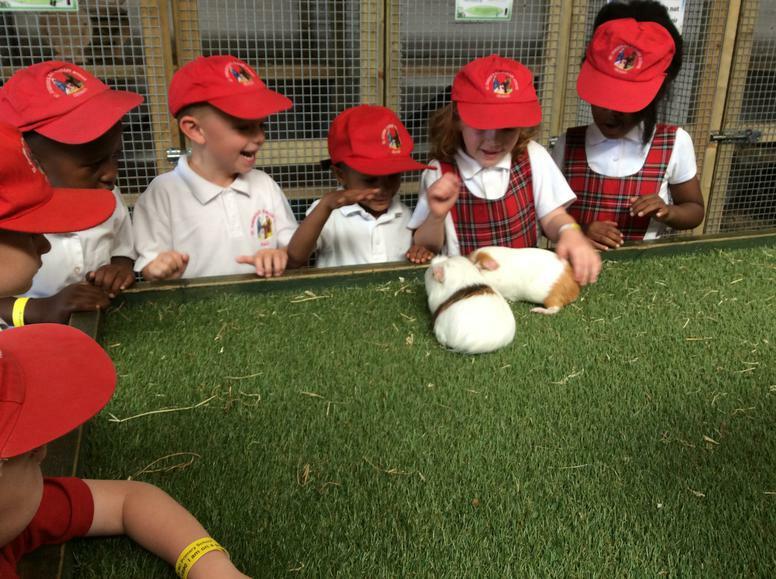 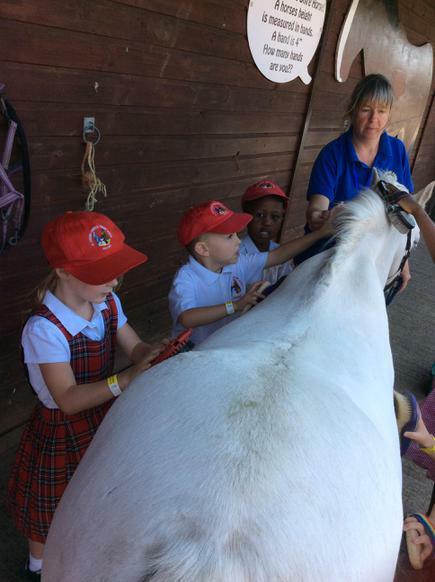 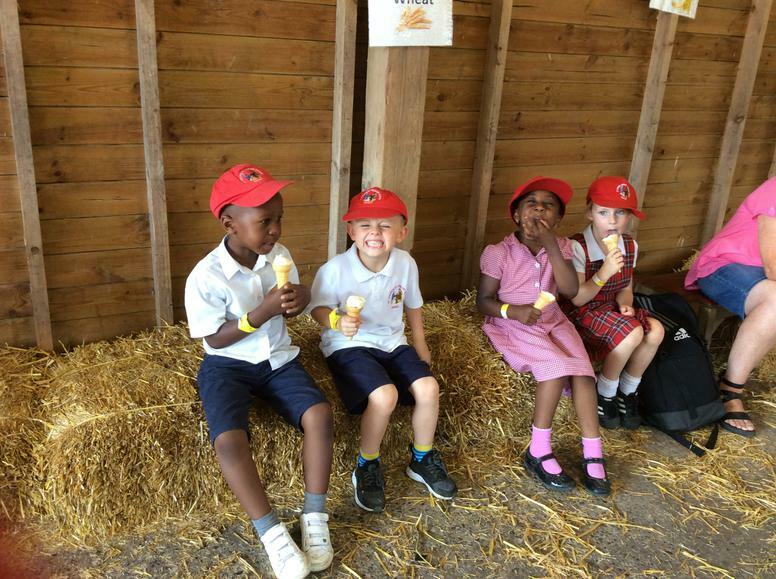 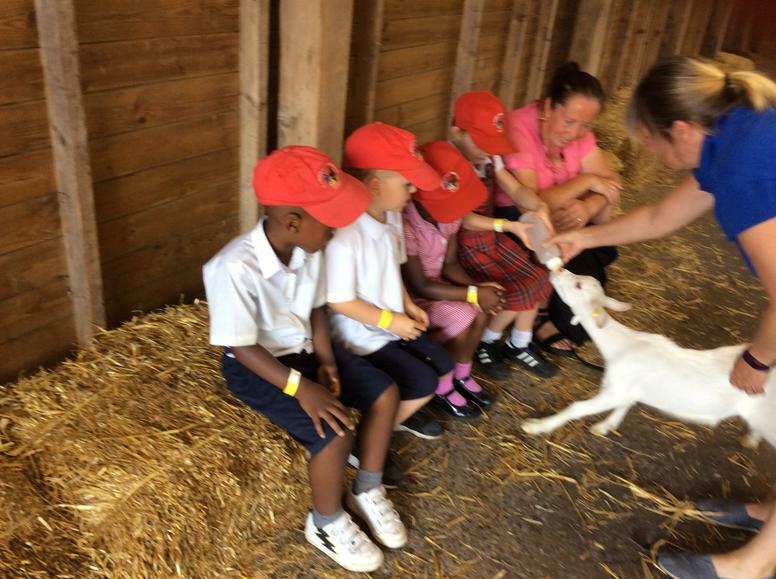 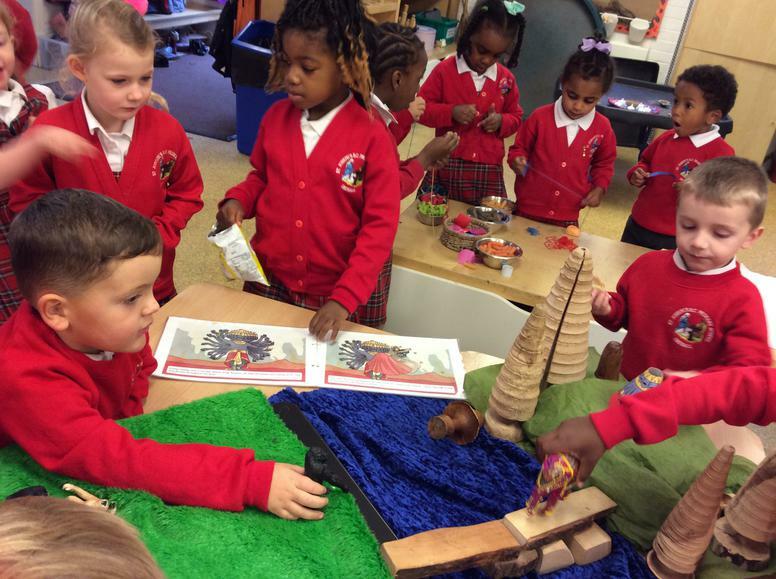 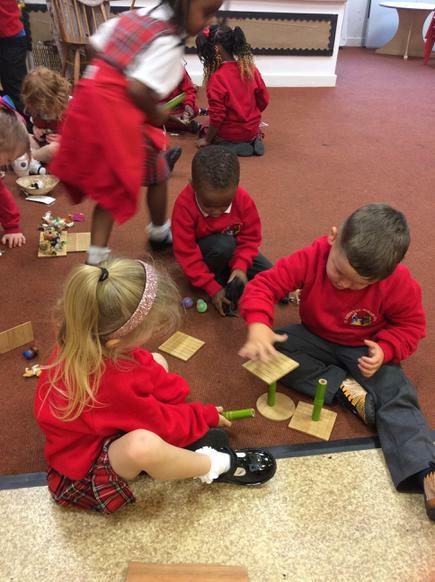 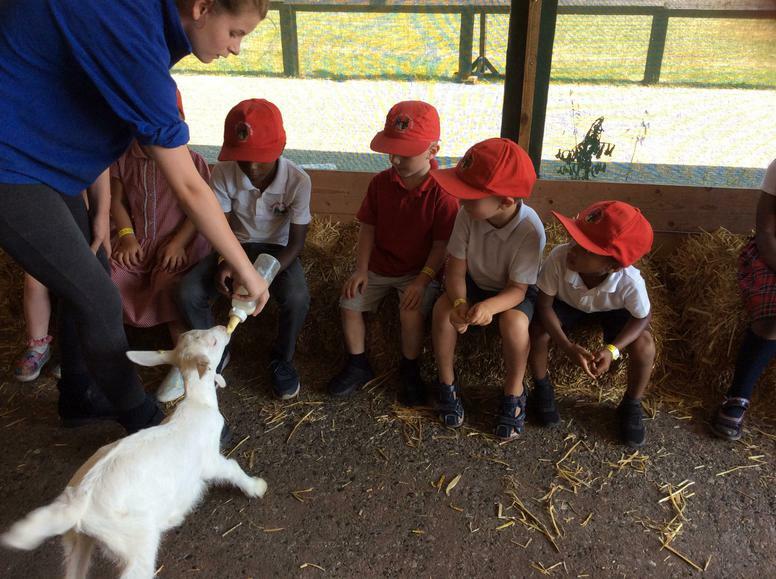 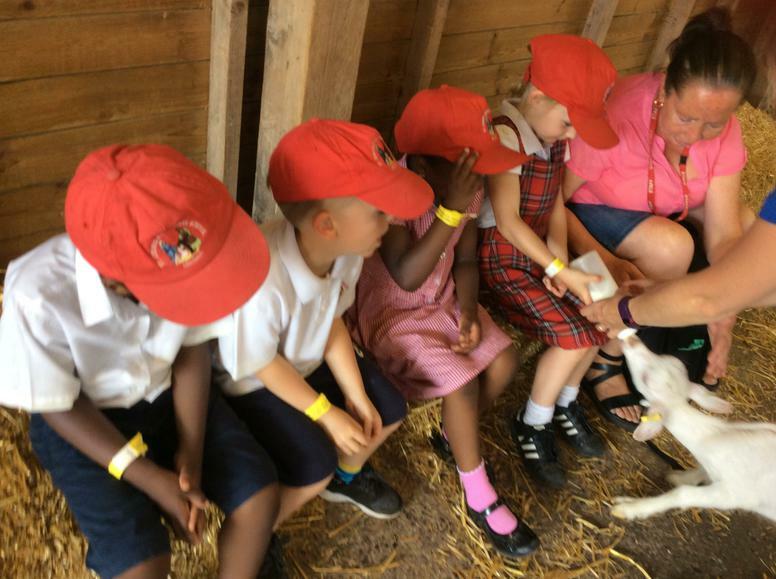 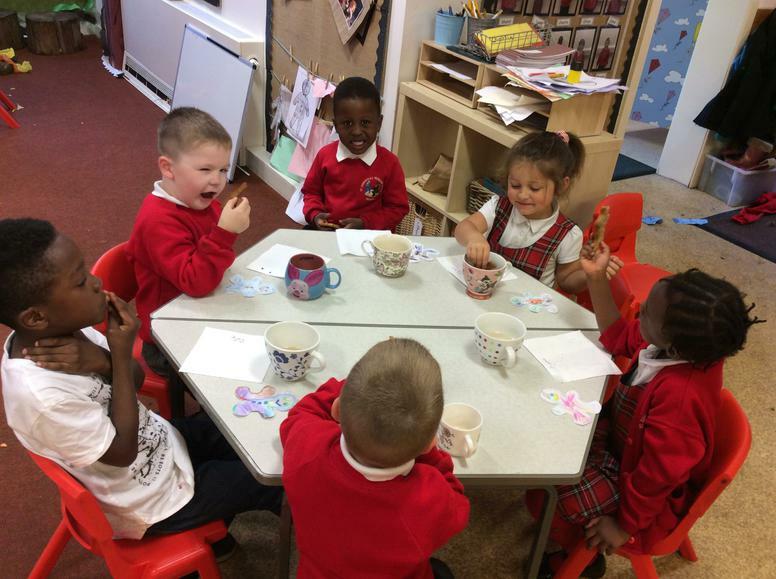 In the Foundation Stage at St. Joseph's, the children are taught to share and care about others reflecting the Catholic values in our mission statement. 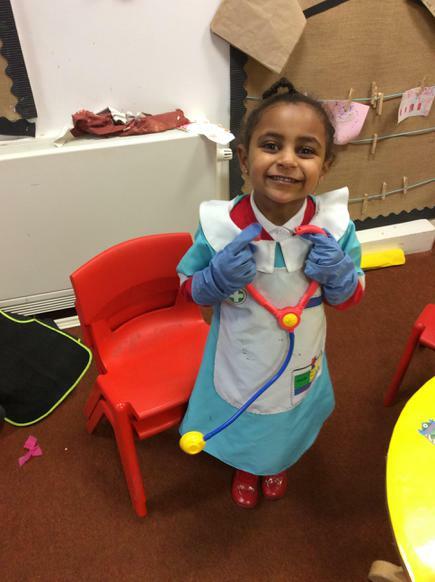 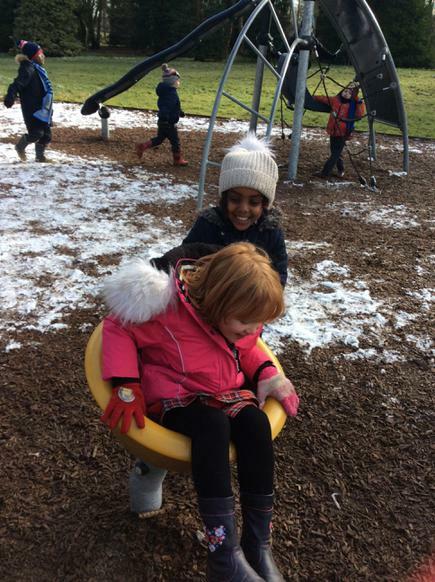 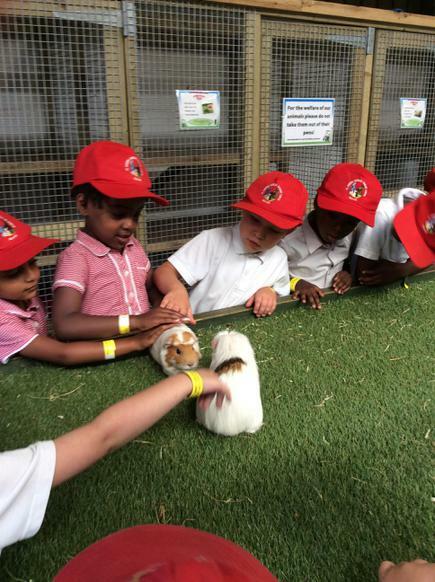 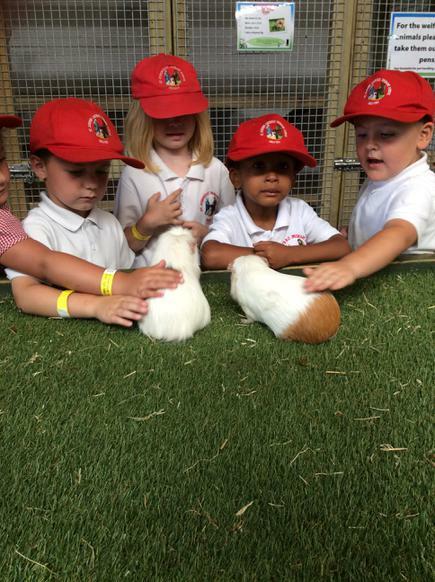 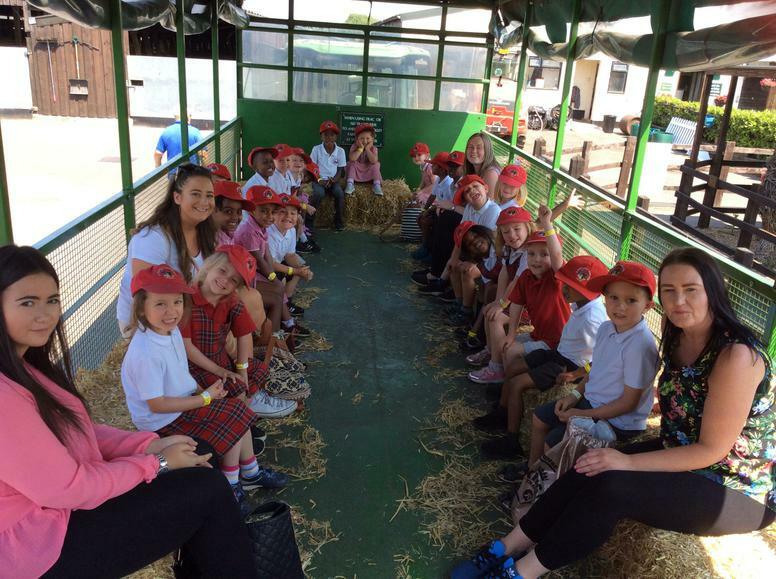 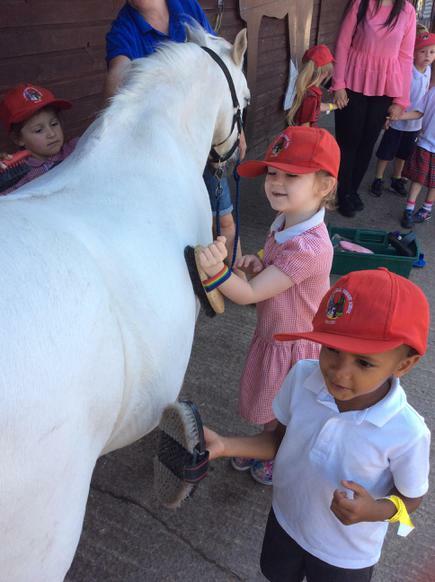 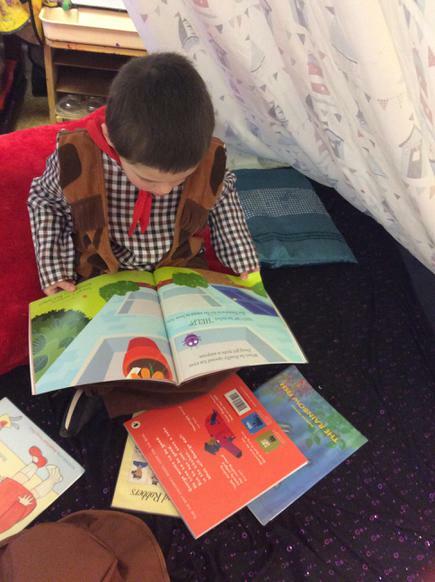 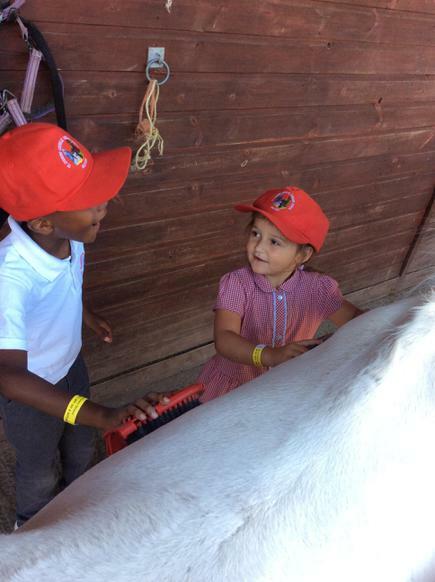 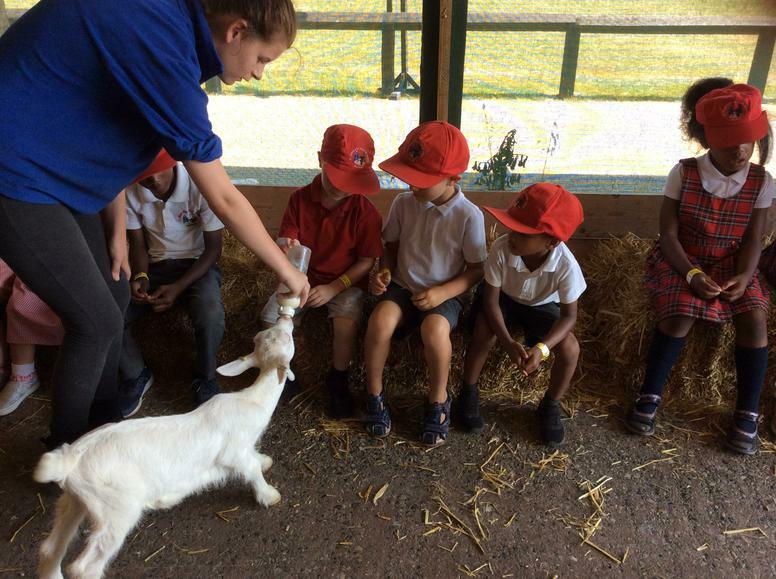 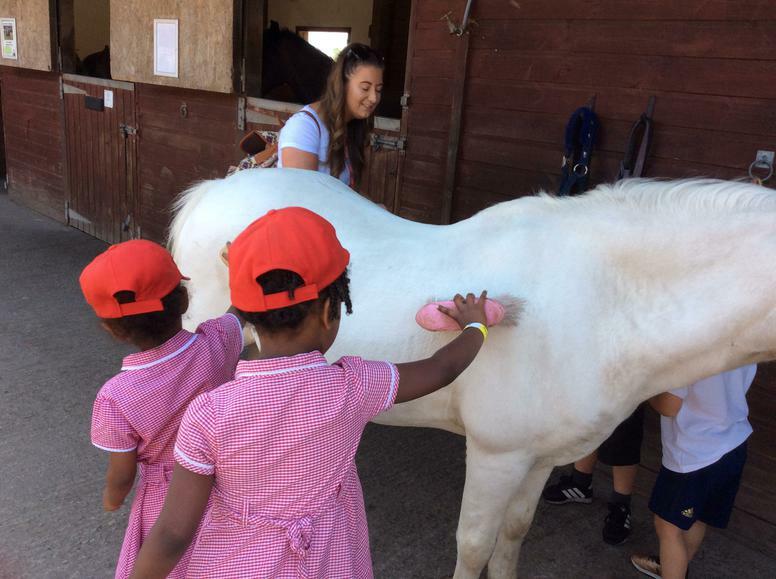 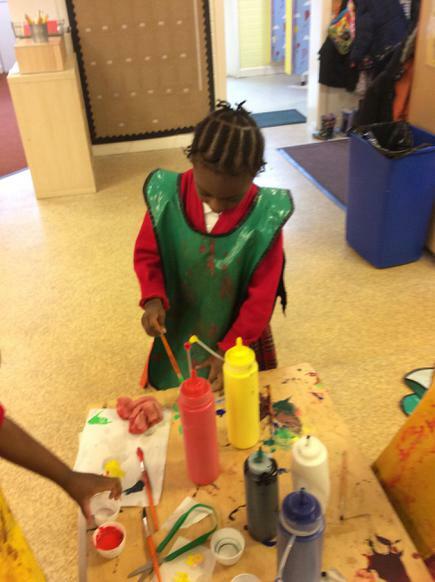 Our dedicated Early Years team provide a happy, caring secure environment where your child will flourish. 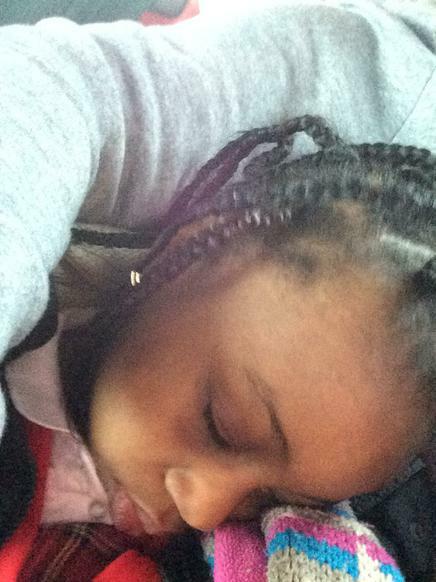 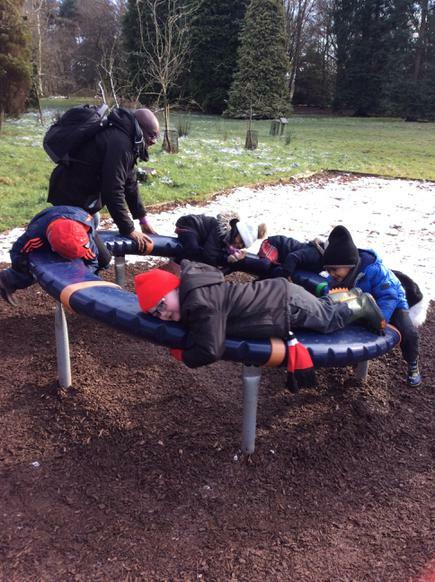 Then finally play in the park before a long coach ride back to school. 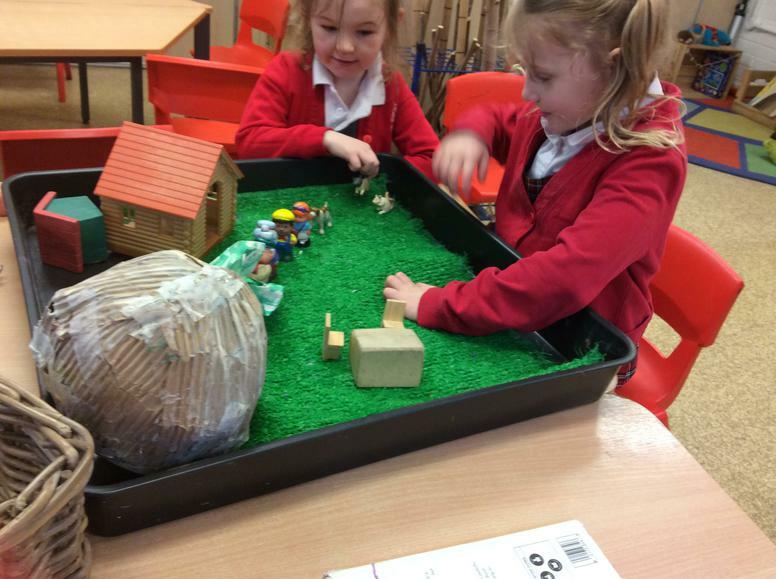 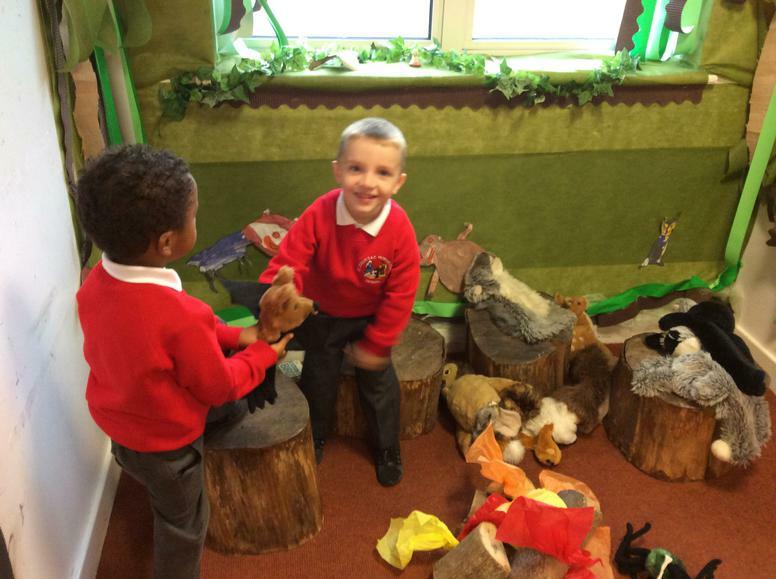 This term we will be learning about DINOSAURS, we are all very excited! 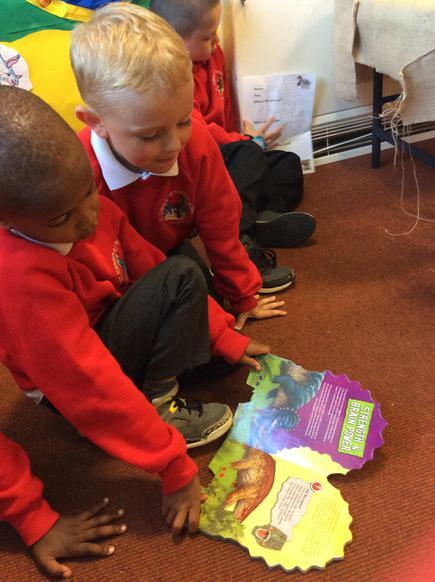 When your at home why don't you see if you can find out any new facts about these dinosaurs? 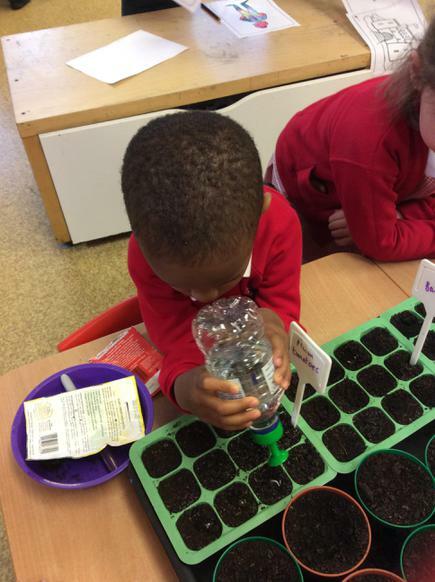 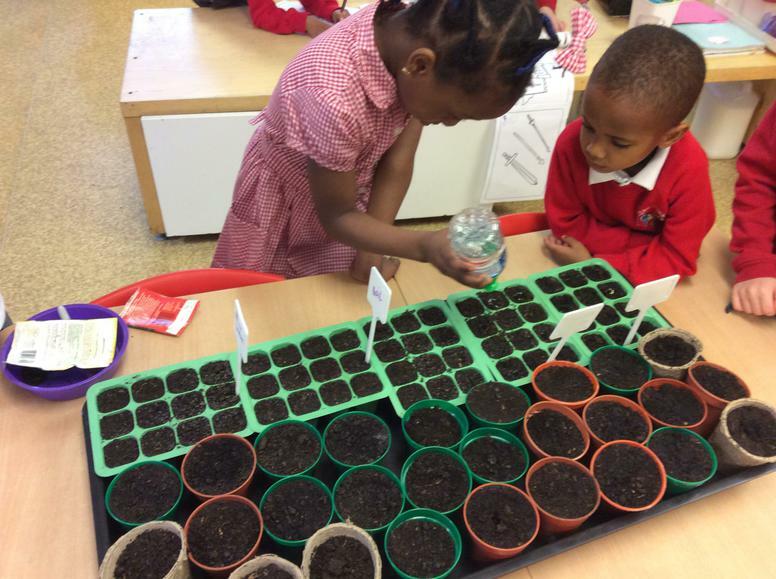 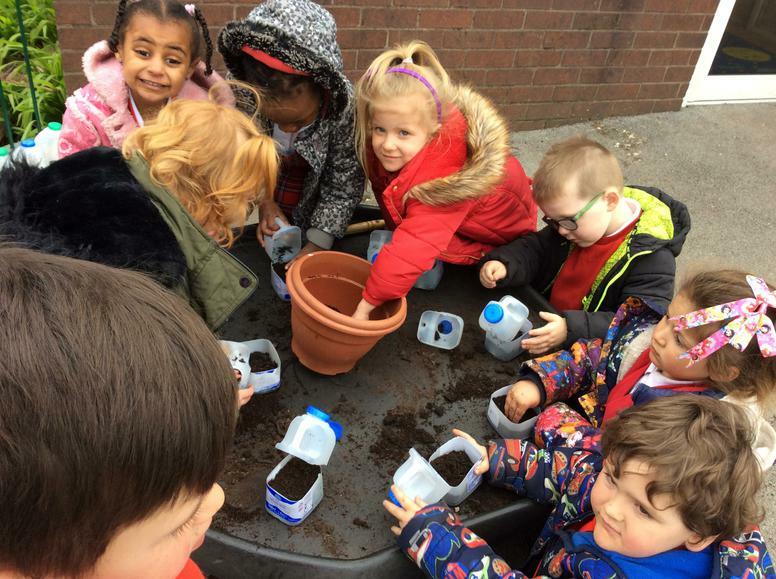 We are going to study the plants as they growing; testing growing conditions, labelling them, measuring the rate in which they grow and lots more. 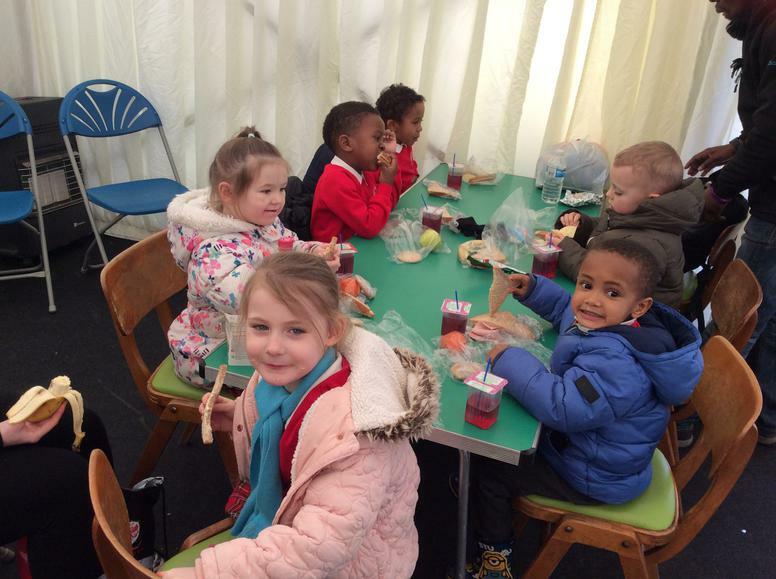 To celebrate St Georges day Reception decided to have a picnic. 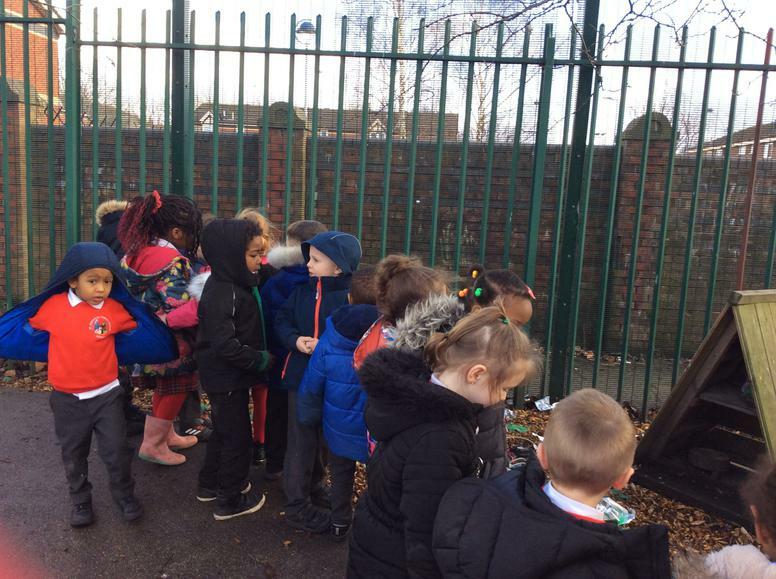 In the morning we made sandwiches and packed up the picnic baskets ready for the afternoon (we had our finger's crossed in the hope it would not rain!). 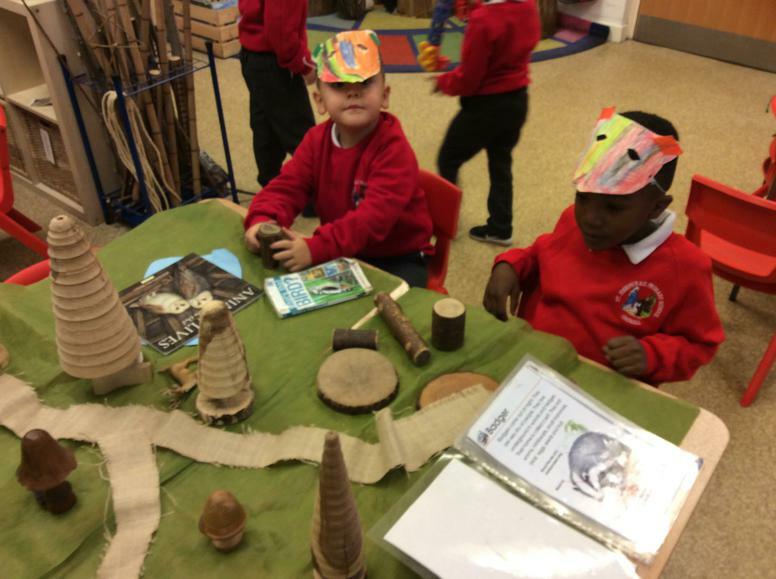 Luckily it stayed dry, so we put on our coats and bought with us the crowns, shields, and dragon heads we had made in the morning. 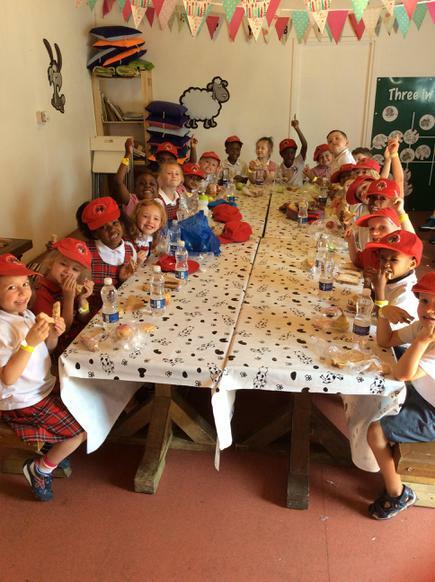 We had a wonderful picnic talking about St George and how brave he must have been to fight a dragon. 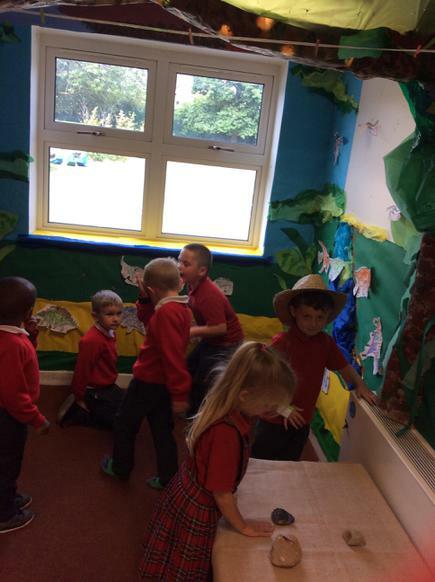 After we acted out our own versions of the story. 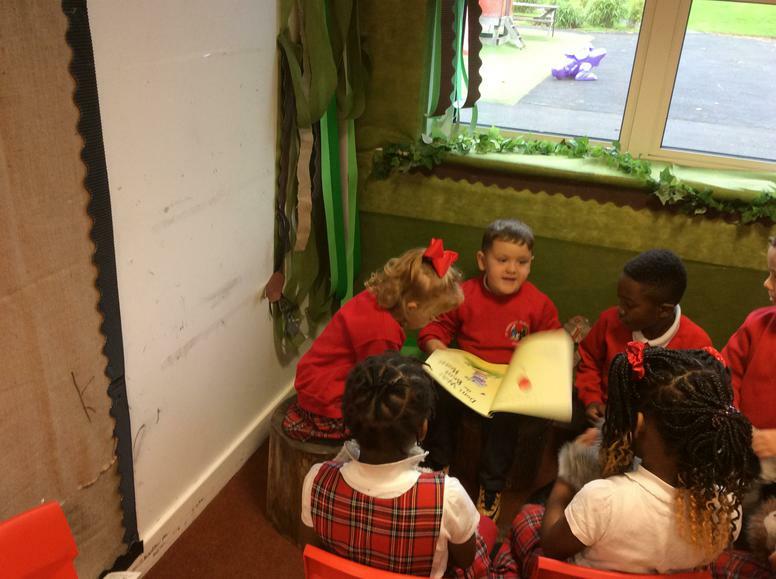 When we arrived back in class we had one more St George's Day treat, a child from year 5 came and read us a story about St George that they had written. 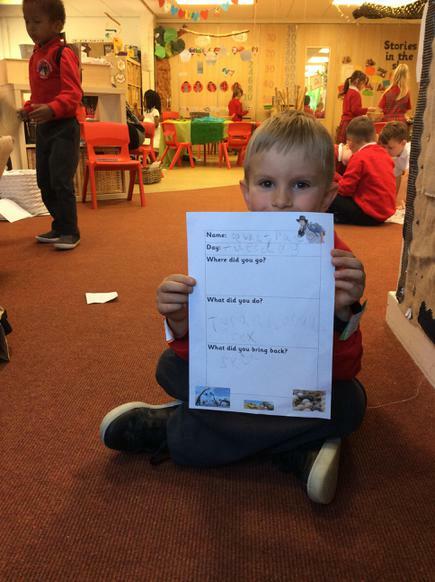 It was fantastic and inspired us to write some of our own the following day. 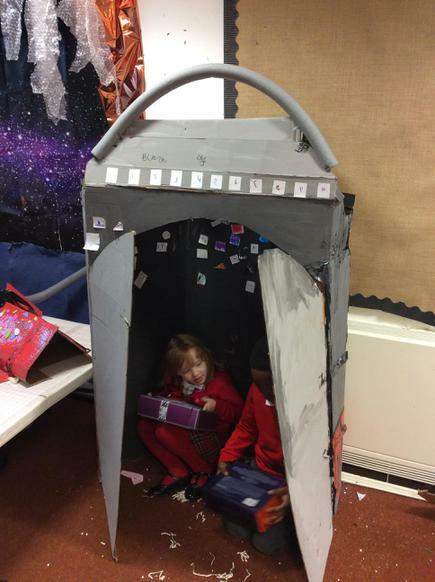 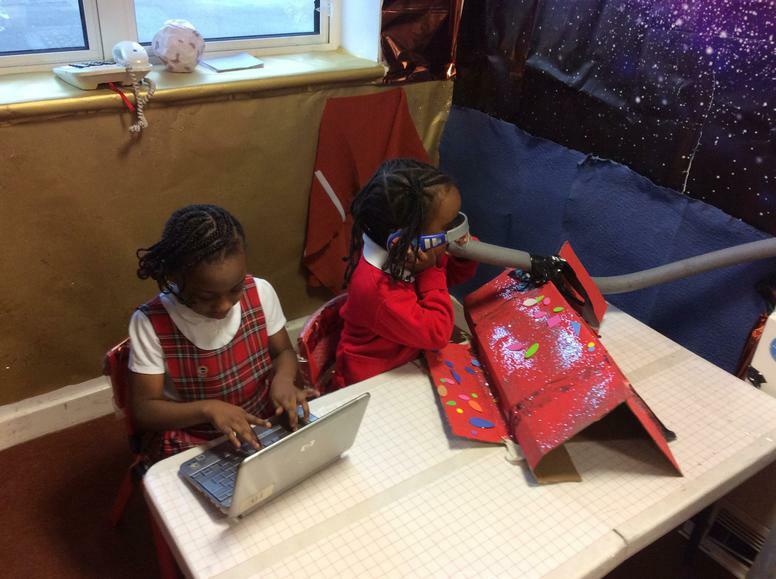 This term we are going to be learning about space. 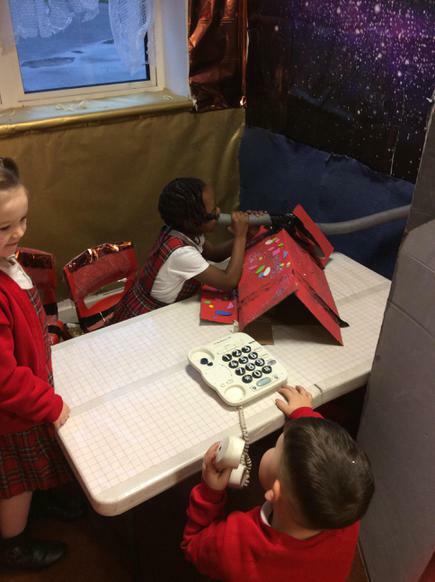 We can not wait to find out all about space, this will include learning the planet names, finding out about the sun and moon as well as learning lots of exciting facts. 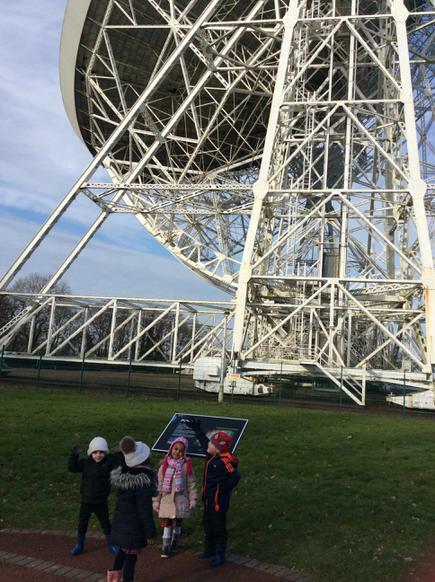 I have also planned an amazing trip to Jodrell Bank, more information about this will follow shortly! 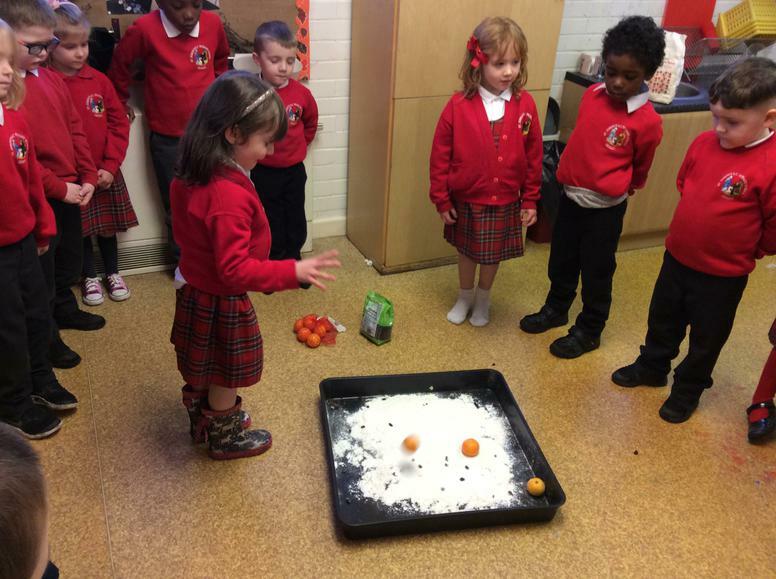 This week in the build up to Easter we have decided to carry out some experiments on eggs.In our first experiment we want to find out what would make the best jacket for Humpty Dumpty to stop him from cracking. 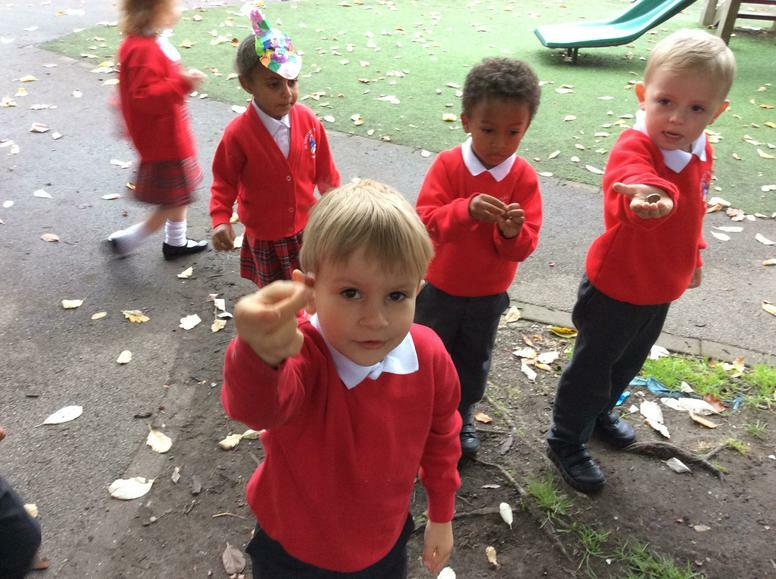 we voted on which one we thought would protect him the best. 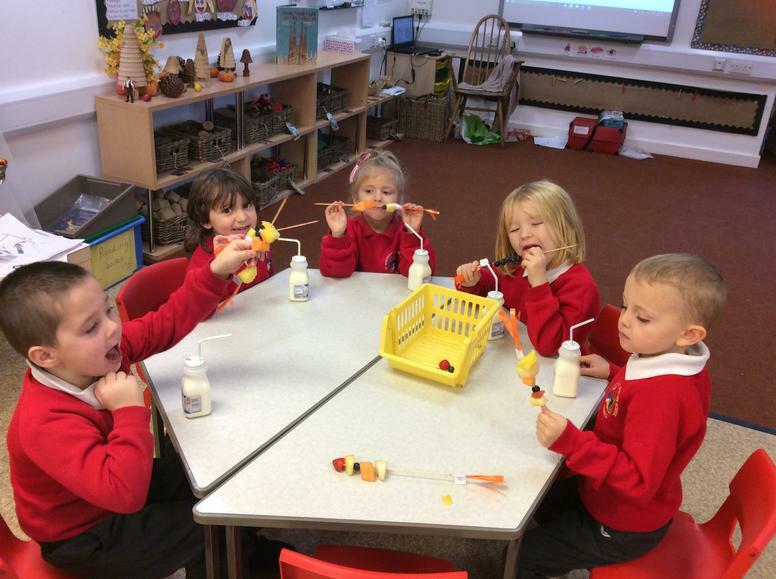 We put four hard-boiled eggs in different types of liquid. 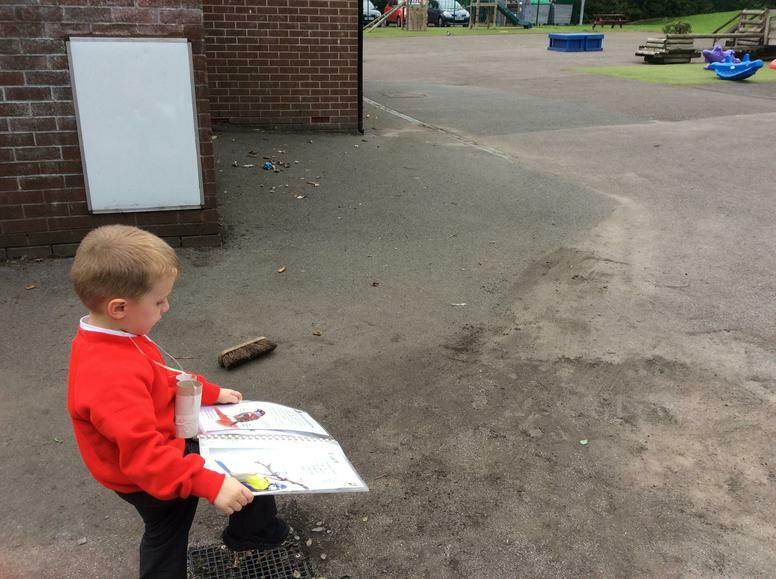 We then made predictions about what we thought might happen. 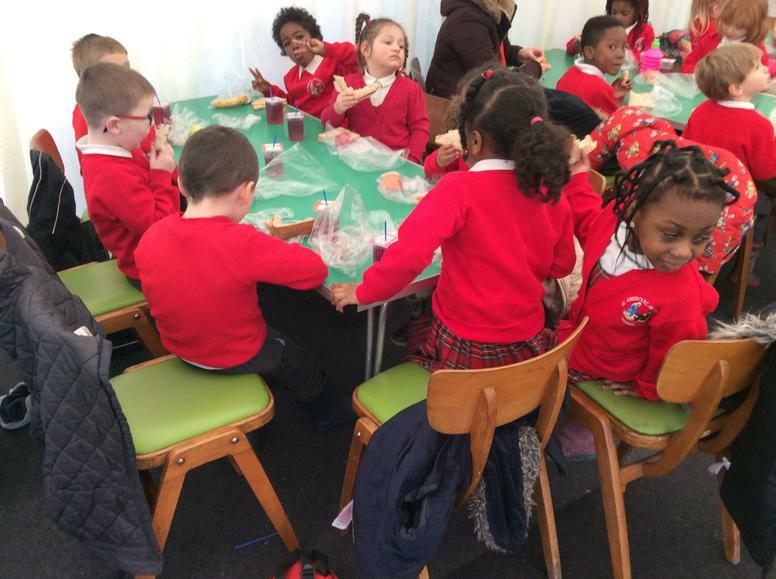 We had a wonderful time on the 16th March celebrating St Patrick's Day. 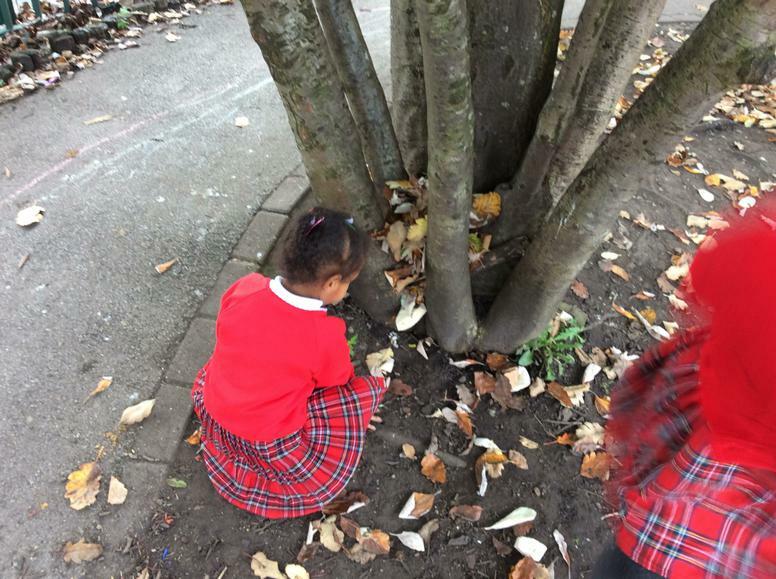 We also learnt about Leprechauns and how they find gold at the end of the rainbow. 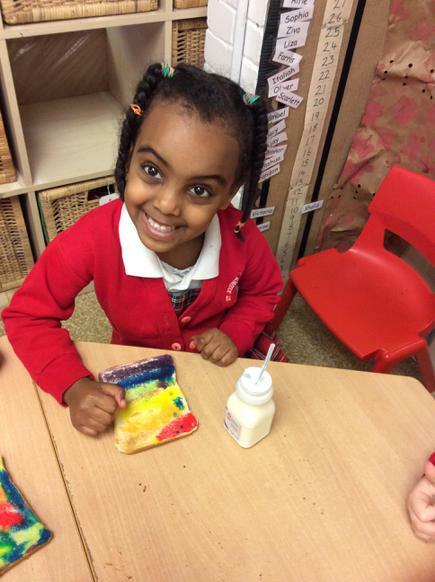 We decided to make our own special rainbow toast at snack time. 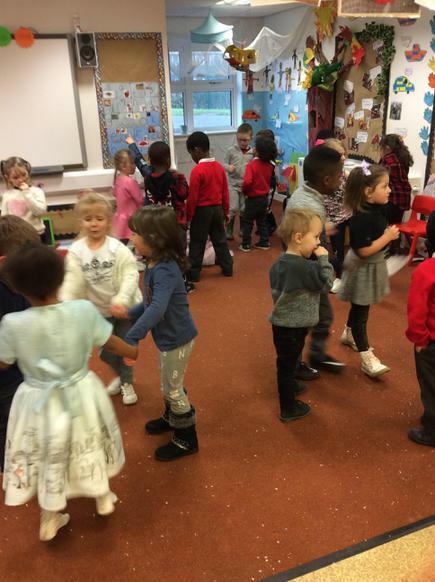 After snack Mrs Crompton took us to the hall with the Nursery and taught us some Irish Dancing. 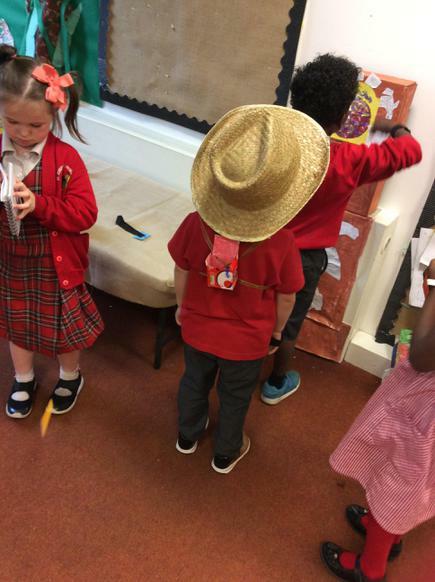 After reading 3 Jon Klassen Books about hats we decided to try on lots of different hats. 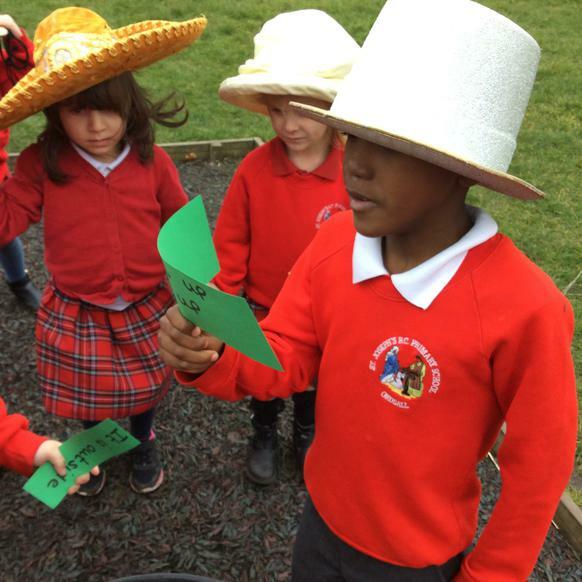 We wrote some sentences about our favourite hats. 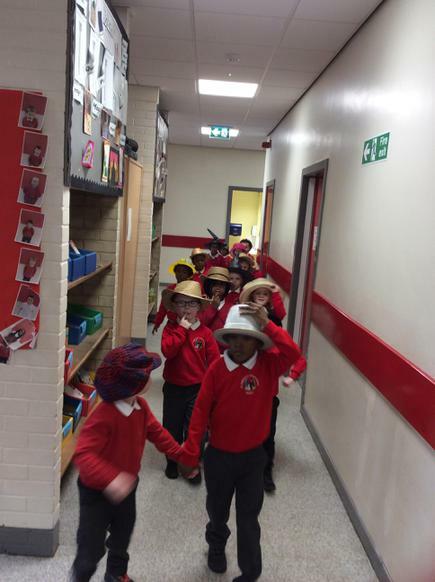 After reading them, we decided to put on our hats and go in search of the missing hat. 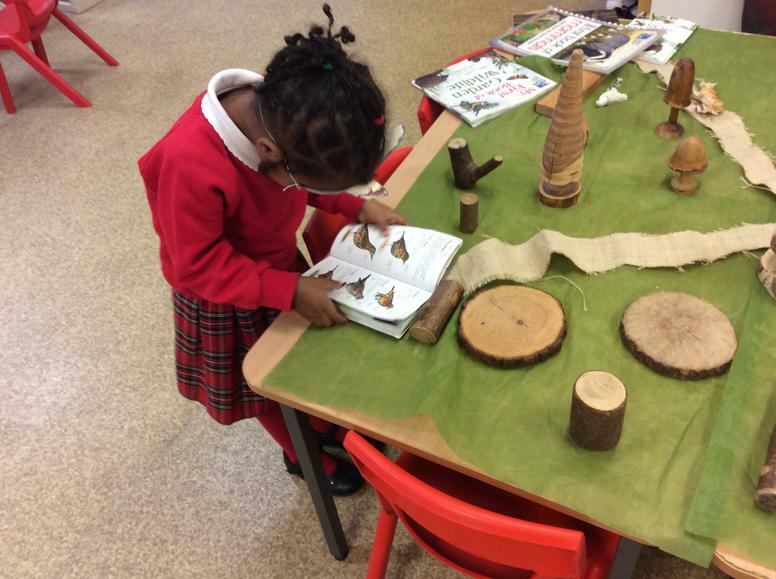 We found different clues all over school, which we took in turns to read. 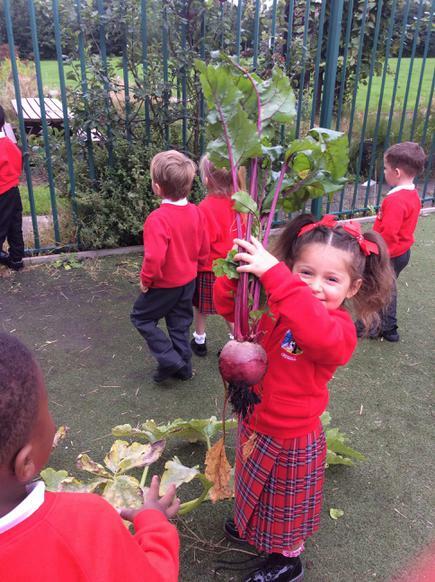 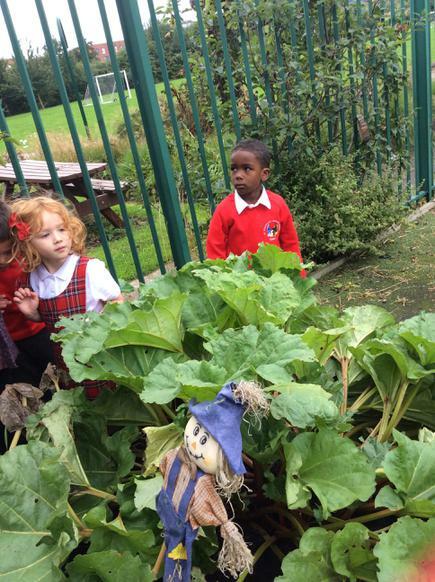 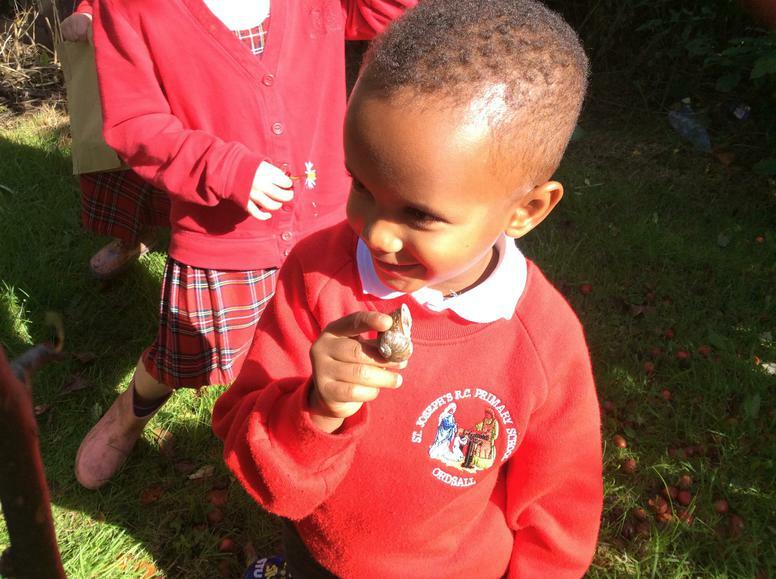 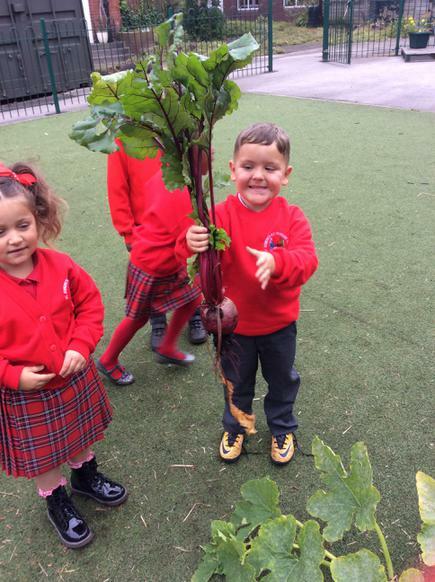 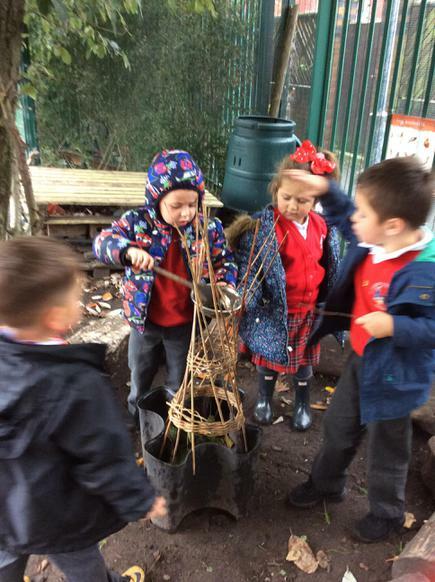 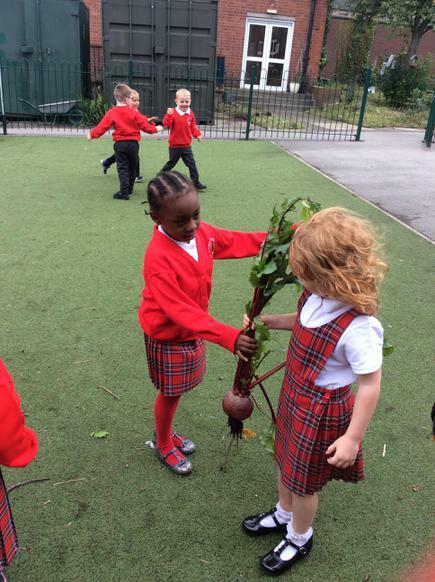 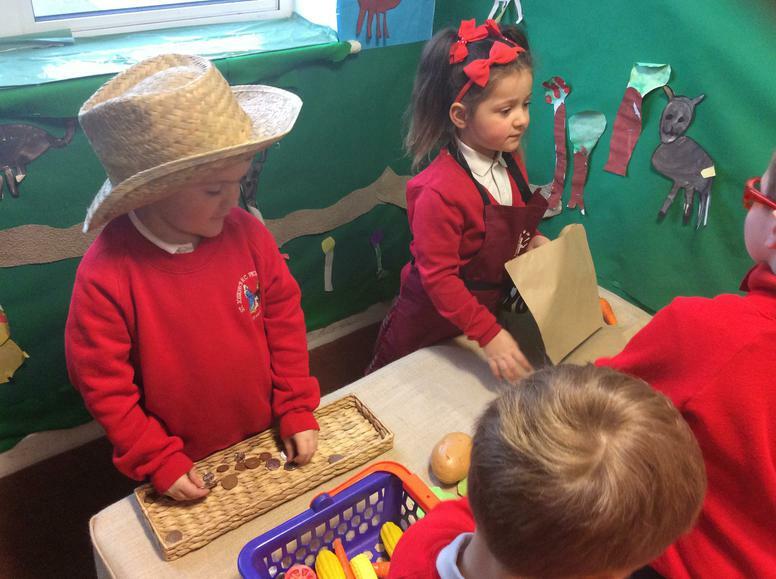 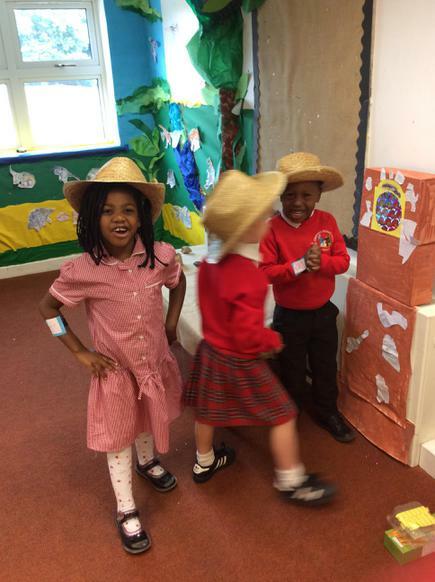 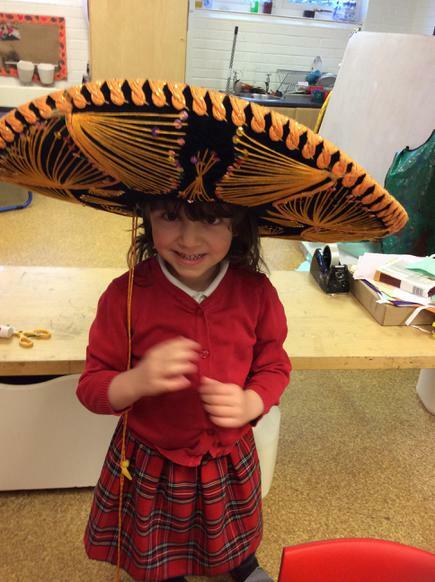 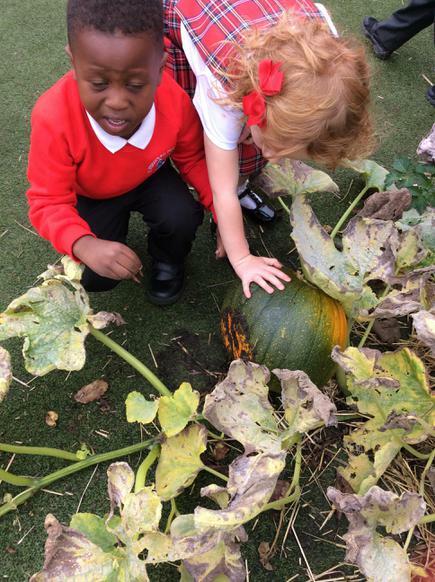 Eventually we found the hat in the Nursery garden. 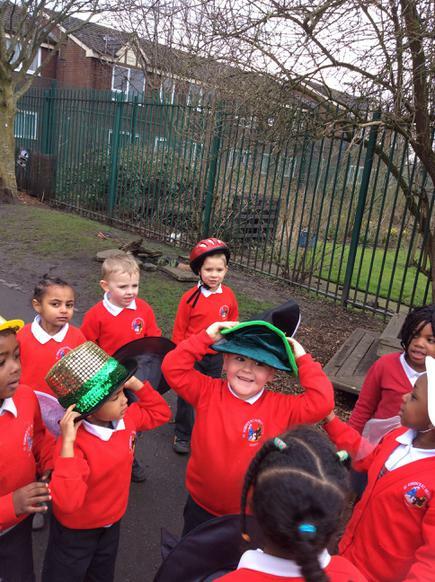 We had lots of theories about what happen to the hat but in the end we decided it must have been a Leprechaun as he stole the green Irish hat and its nearly St Patricks Day! 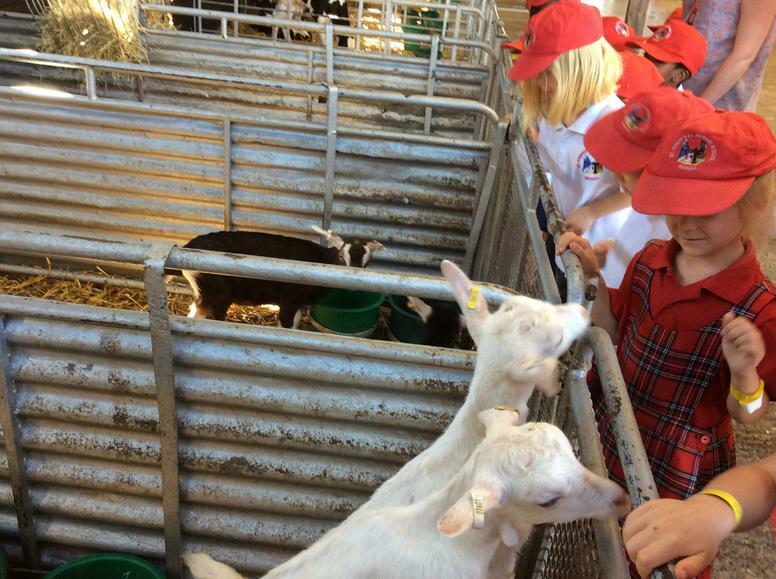 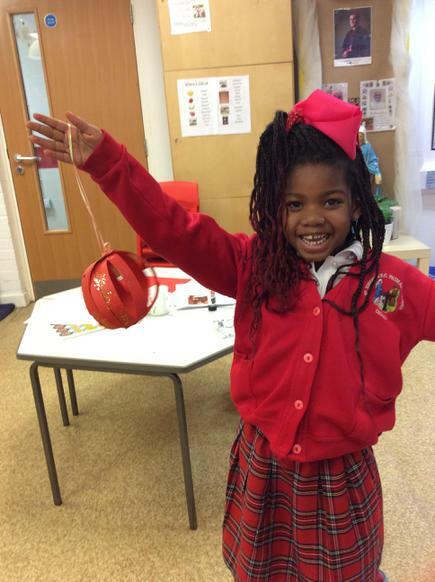 In St Josephs we always enjoy celebrating Chinese New Year and this year was no exception. 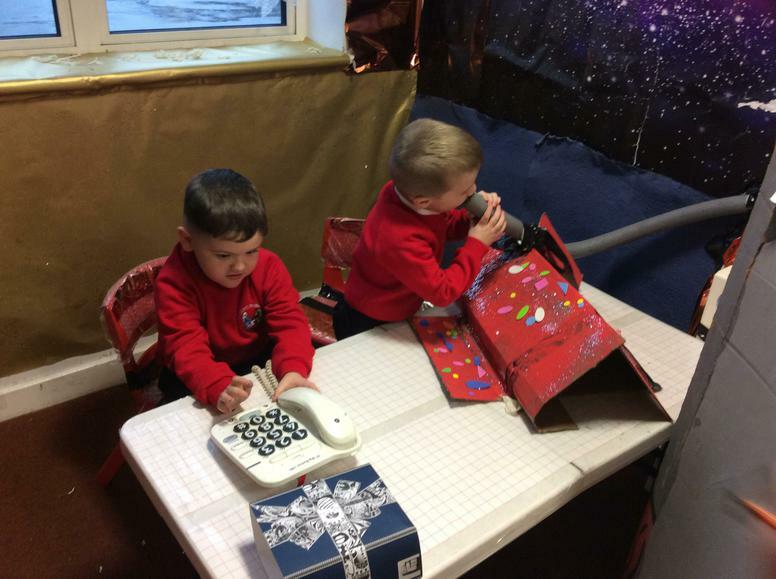 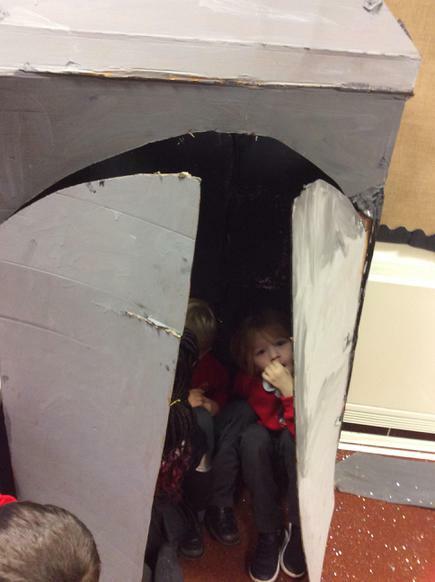 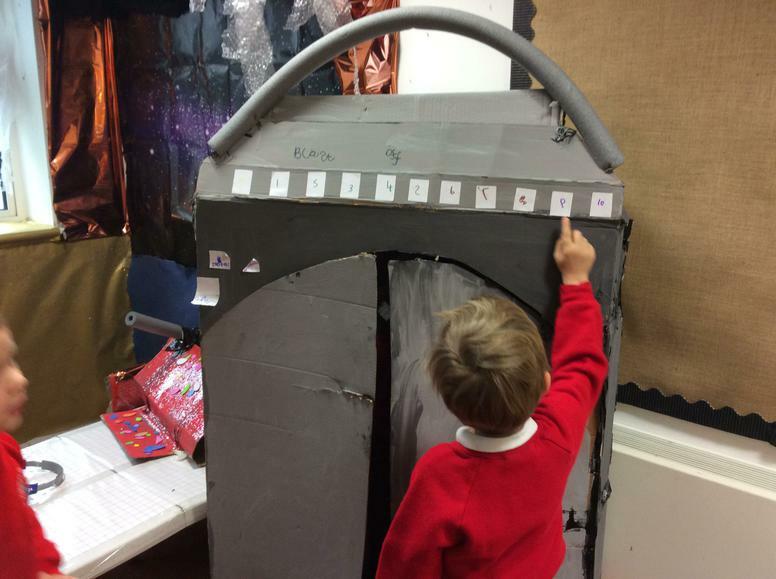 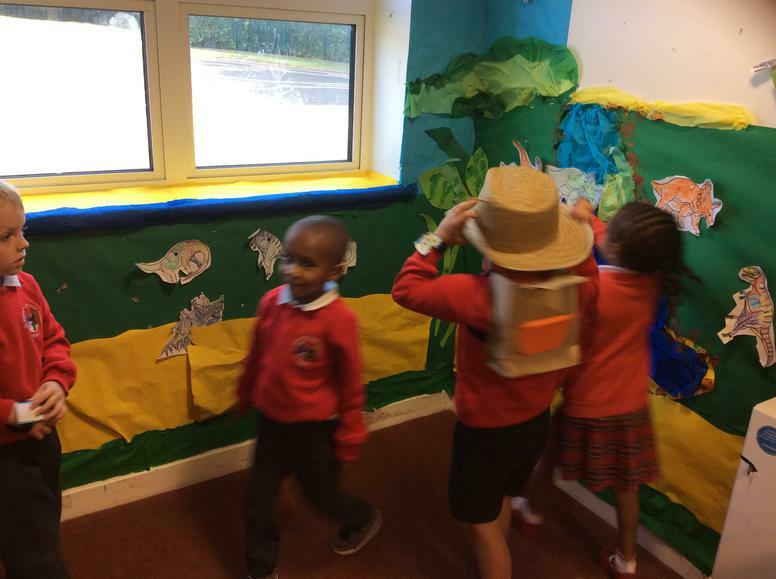 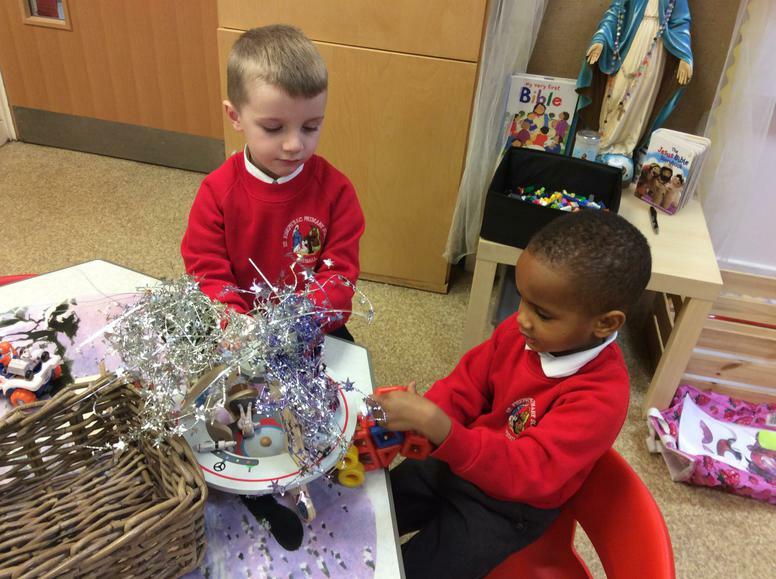 In Reception we prepared the classroom by decorating it with lantern made (with only a little support from Mrs Armes) by cutting strips of paper and carefully attaching them with split pins. 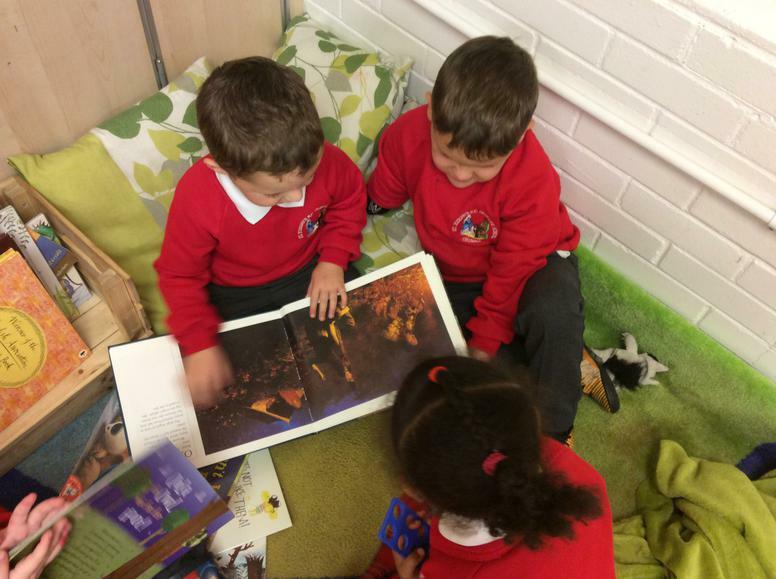 We then read a story about a magical Chinese paint brush. 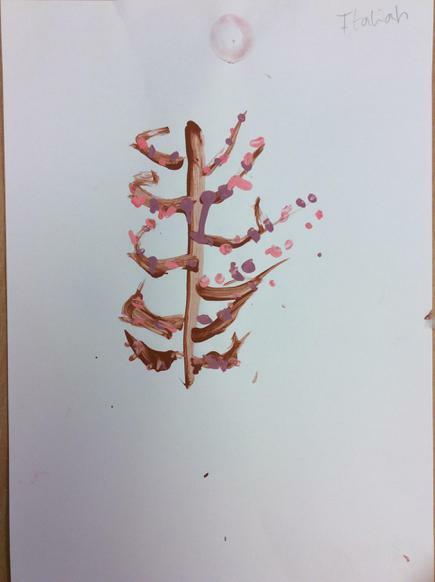 This inspired us to learn about traditional Chinese Blossom Paintings. 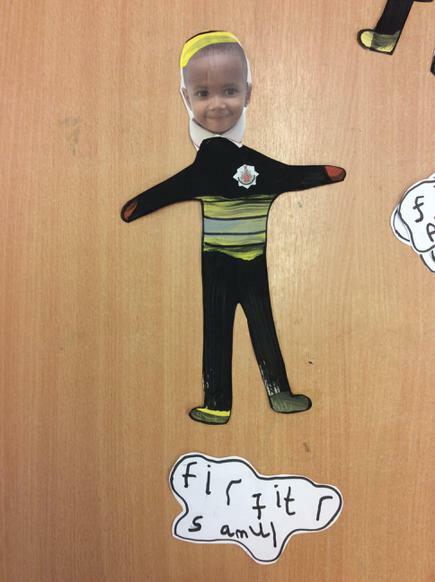 After looking at examples of these on the computer we decided to create our own. 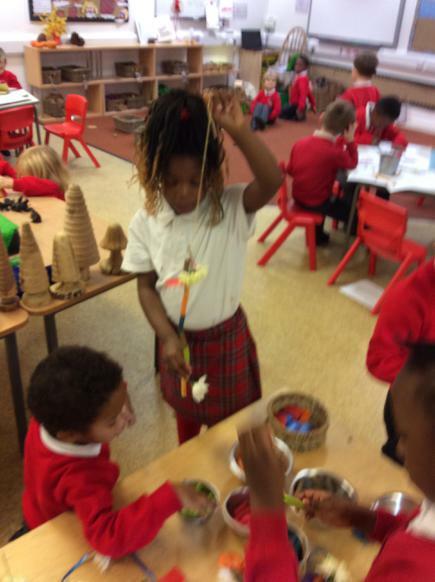 During Maths we decided to continue our learning about capacity by ordering bowls of rice, this was really fun especially when we tried to fill the bowls using chop sticks! 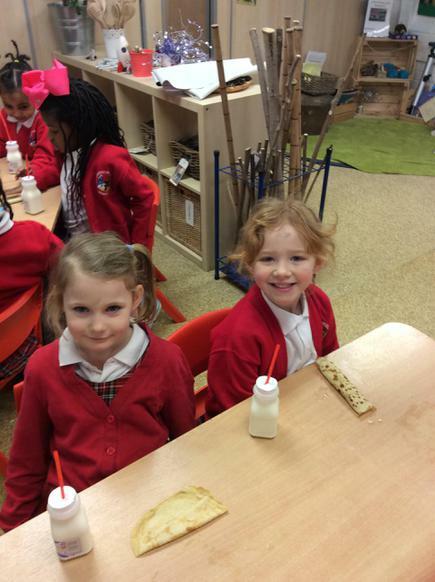 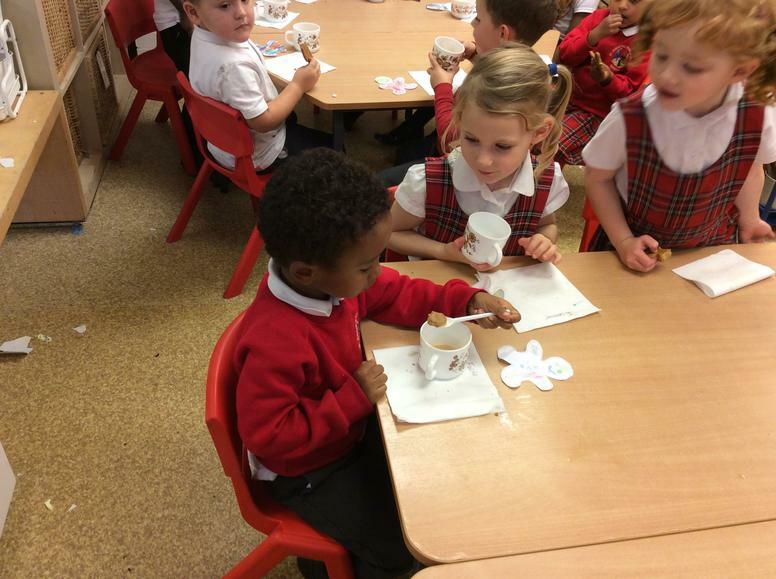 We finished our learning by joining with Nursery for a Chinese feast. 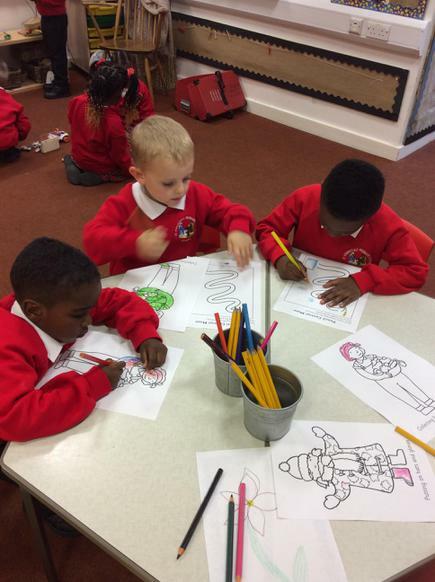 On Tuesday we learnt about Shove Tuesday and why as Christians we celebrate this day. 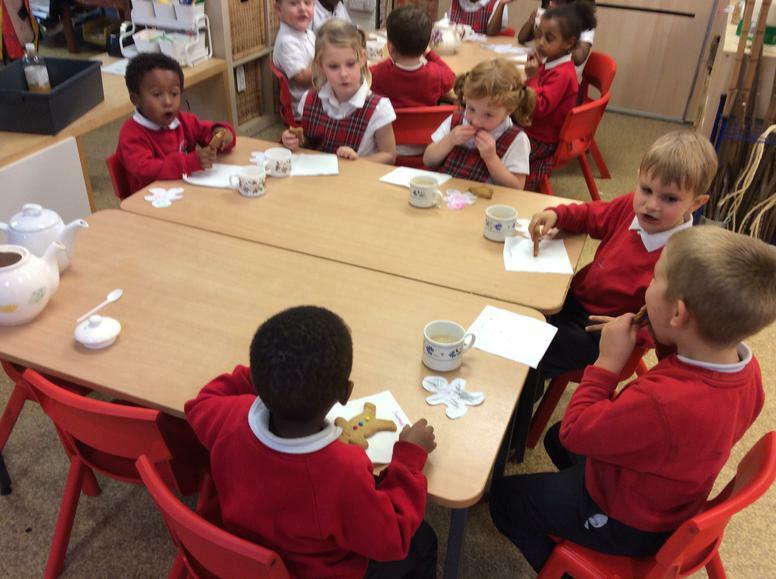 After spending the morning making pancakes we sat down and made our Lenten Promises, have a look for these in the classroom. 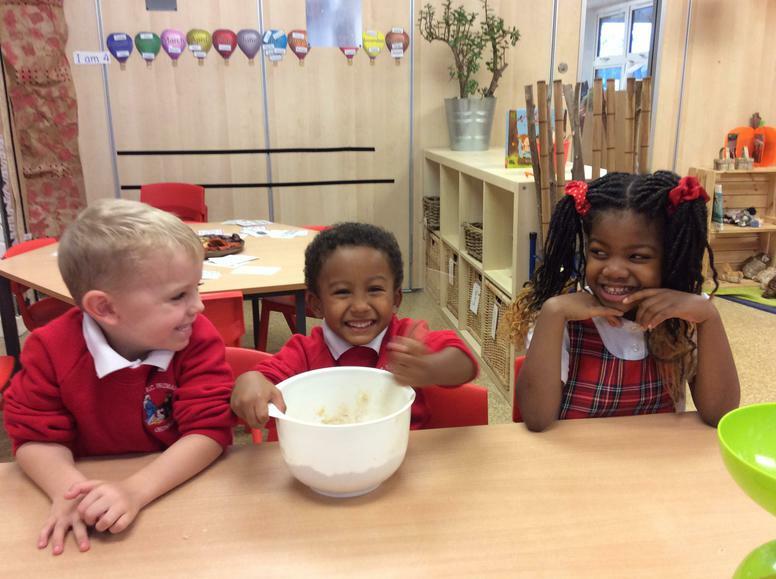 In the afternoon we went in small groups to the kitchen and all tried flipping our own pancakes before eating them, they were delicious! 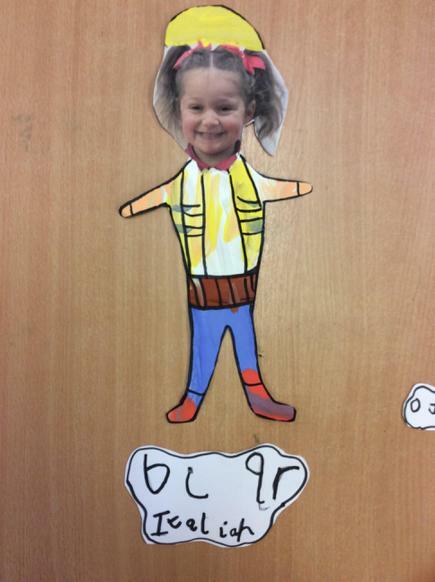 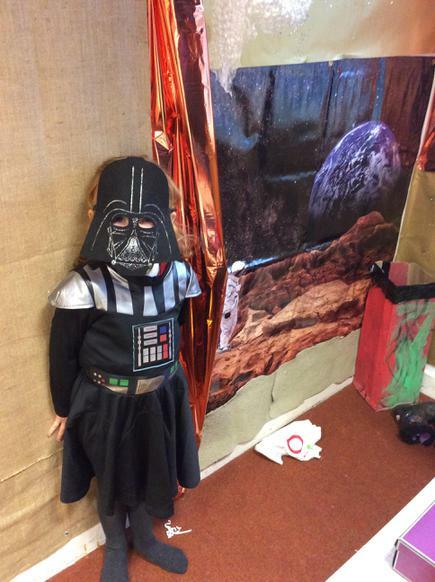 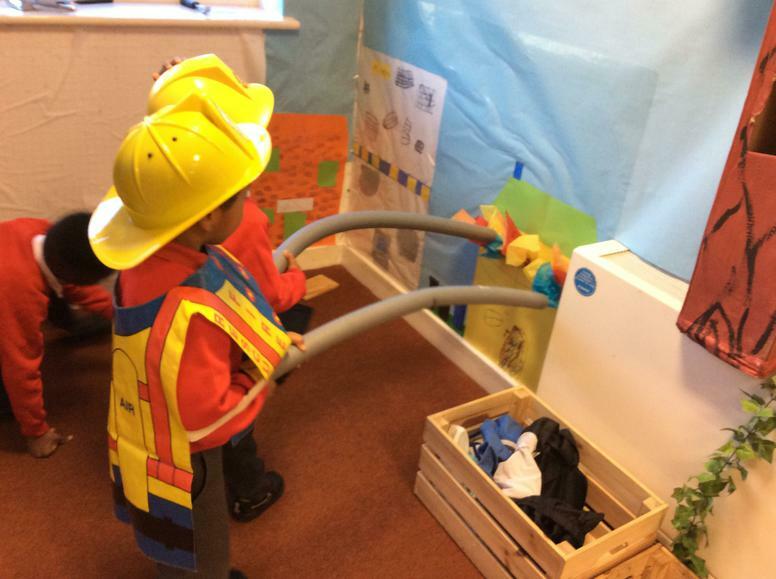 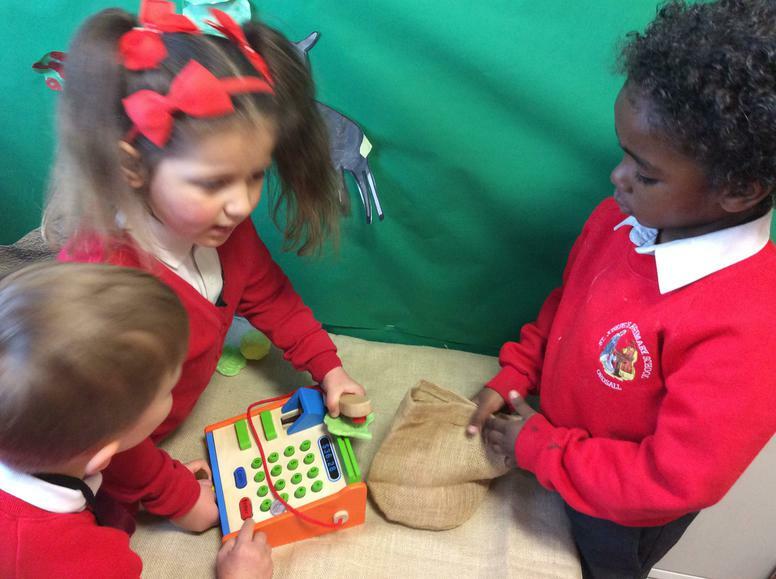 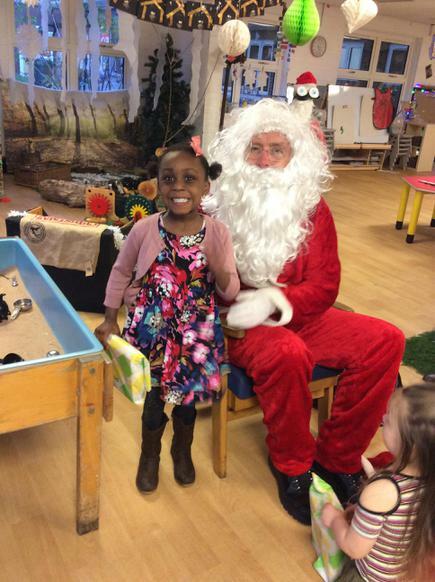 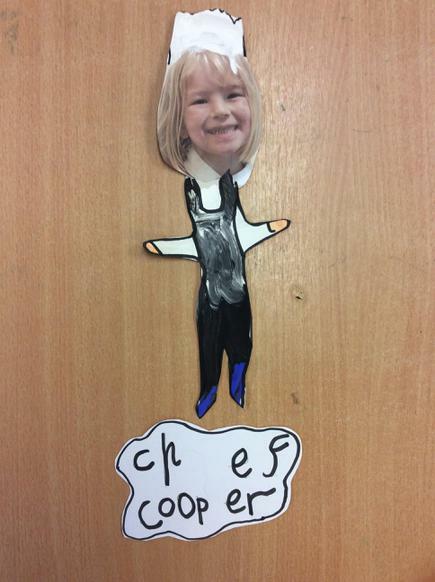 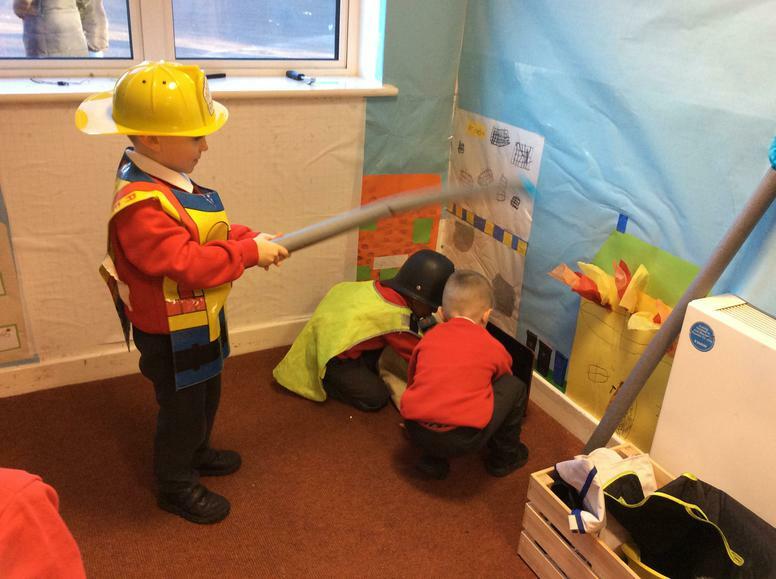 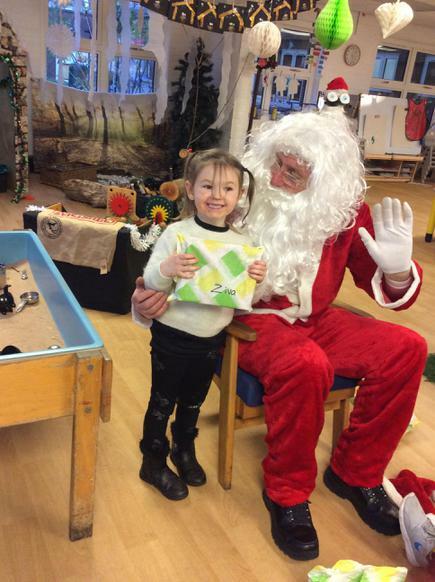 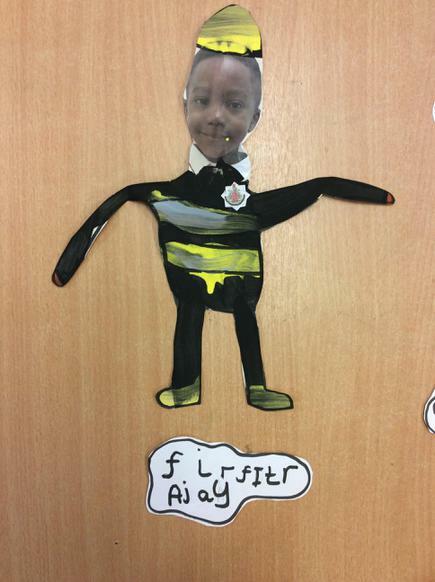 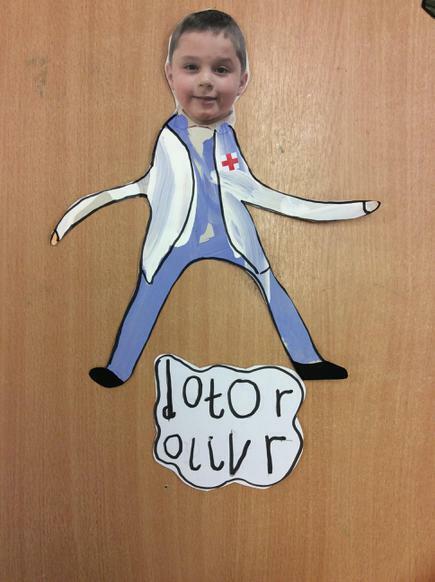 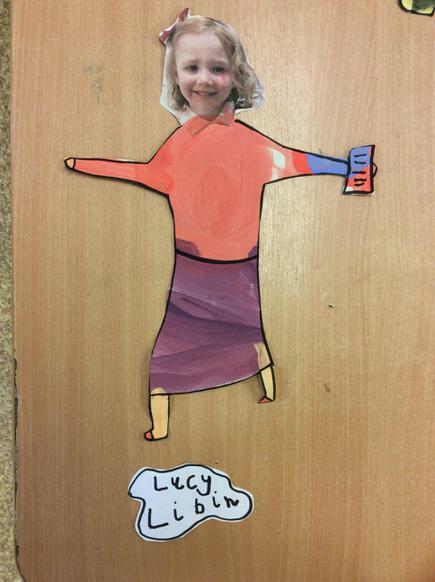 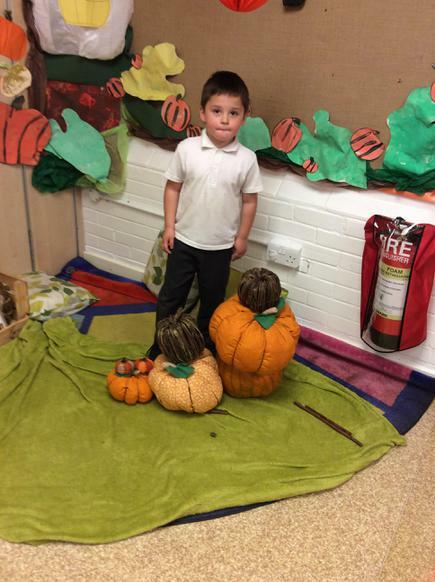 There have been some strange goings on in Reception over the last few weeks. 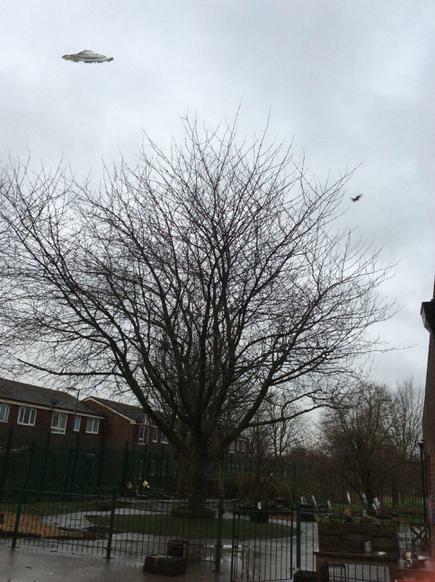 It all began with Mr Knight giving us some pictures from the CCTV camera of something unusual in the sky in Ordsall. 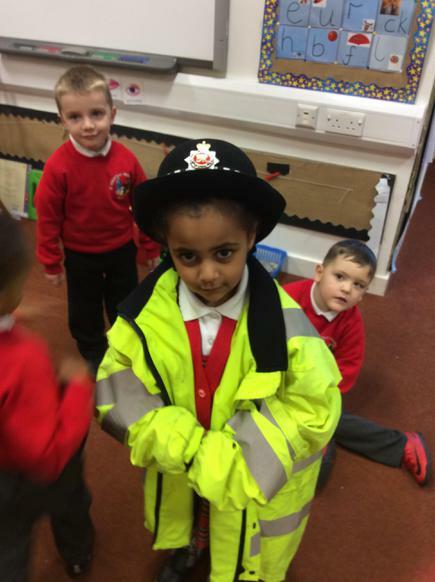 We said we would look in to it for him. 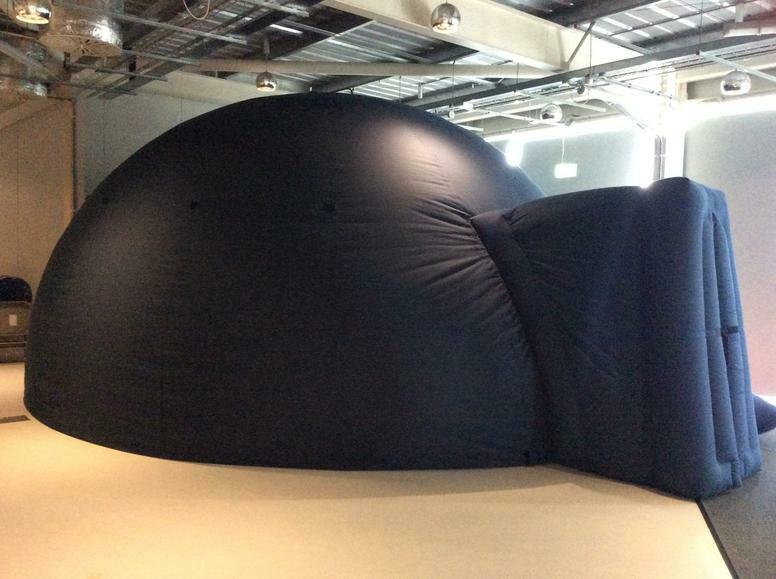 After some discussions, we decided it looked like an Alien spacecraft. 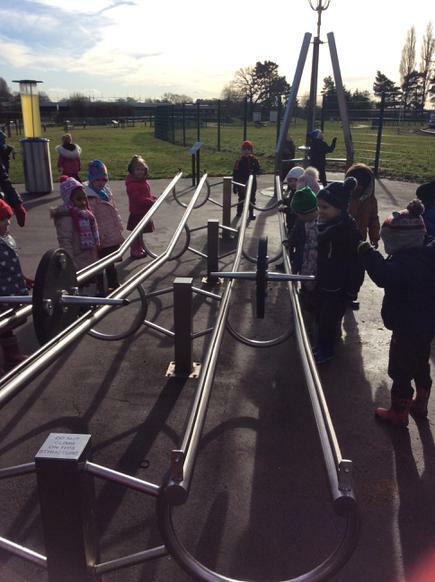 Then after lunch when we went outside, we noticed something very strange, the playground was covered in green goo and what looked like parts of a space ship. 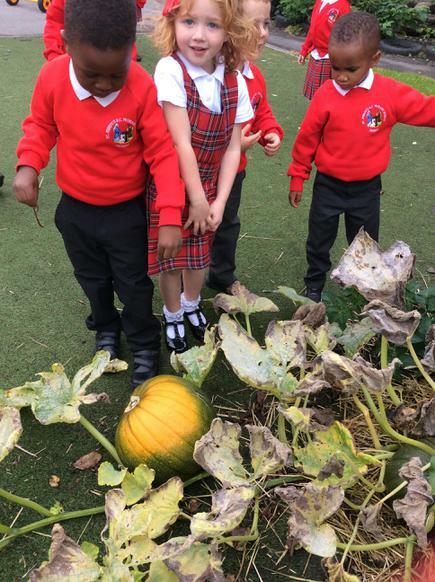 We decided it would be better not to touch it and put up signs warning other people. 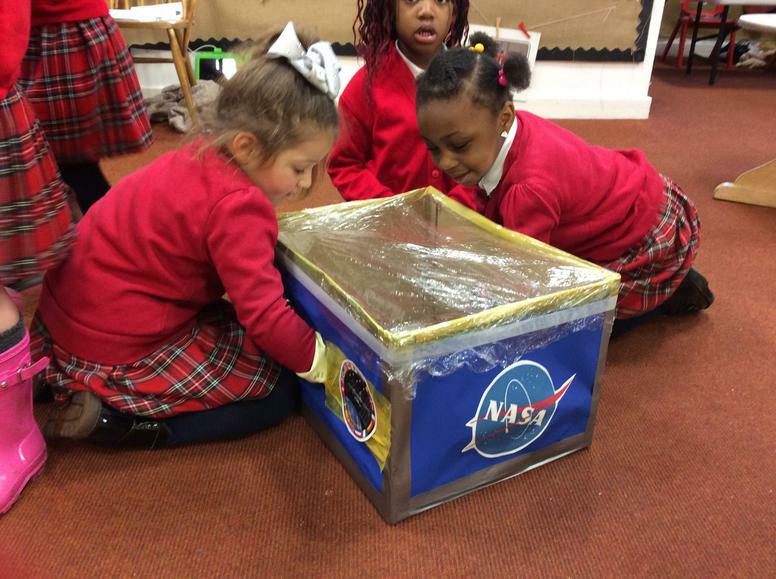 Thank goodness we made that decision because the next day we received a letter from NASA along with an observation tank, they wanted us to write down any information we could about what we had found to help them with their investigation. 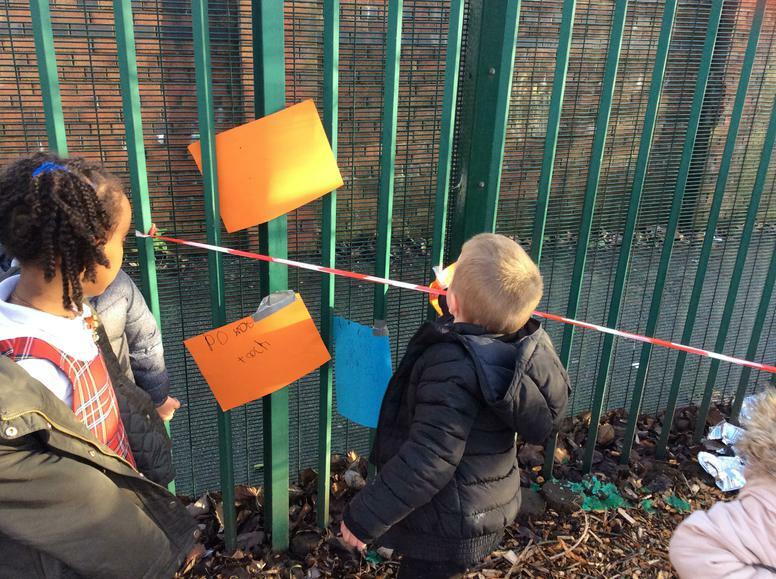 We carefully recorded all the information we could and returned it to NASA, we are currently waiting for them to process the data. 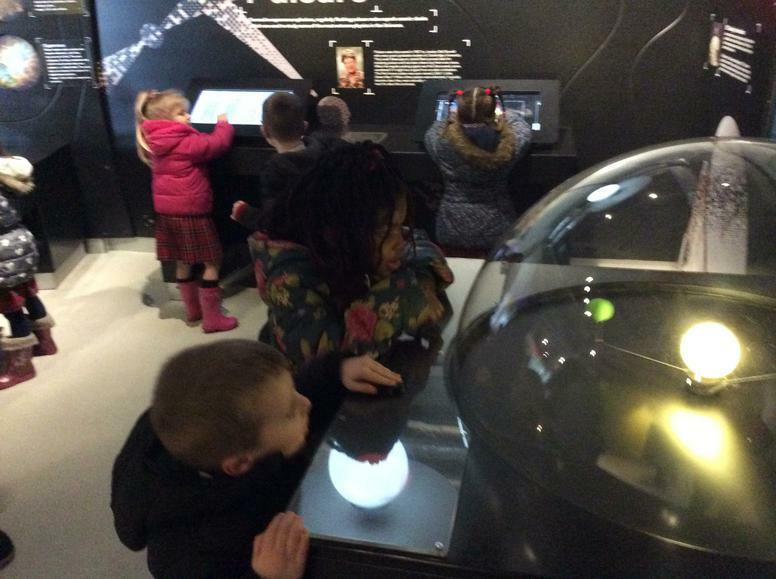 After an exciting term learning all about Space we took a trip to the Jodrell Bank Discovery Centre, home to the world famous Lovell Telescope. 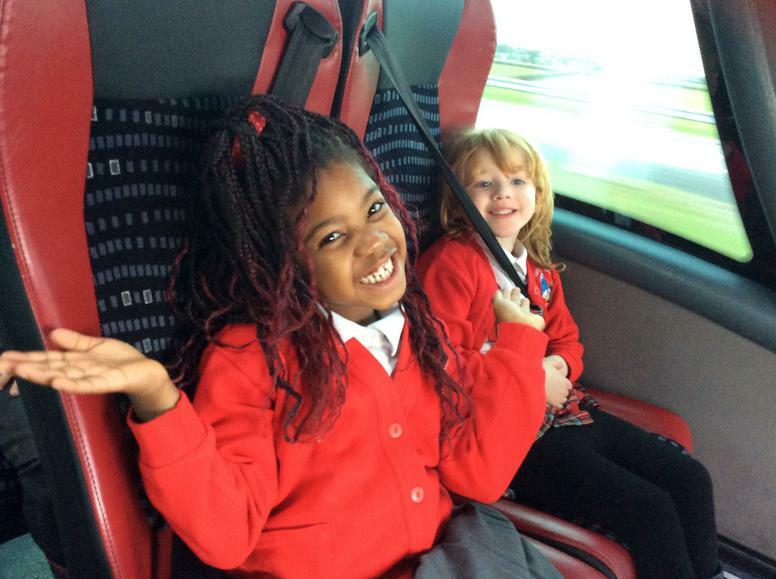 We have been counting down the days until our trip for the last two weeks so as you can imagine we were VERY excited! 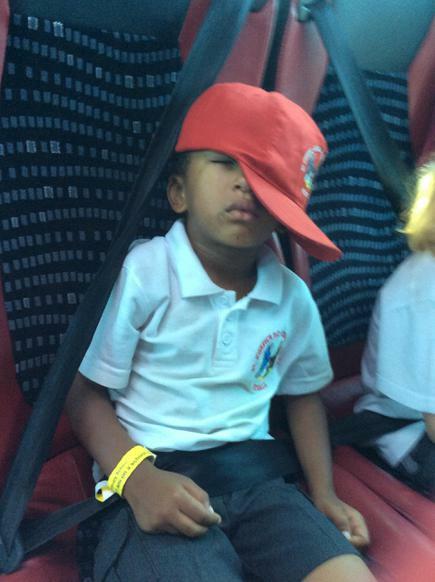 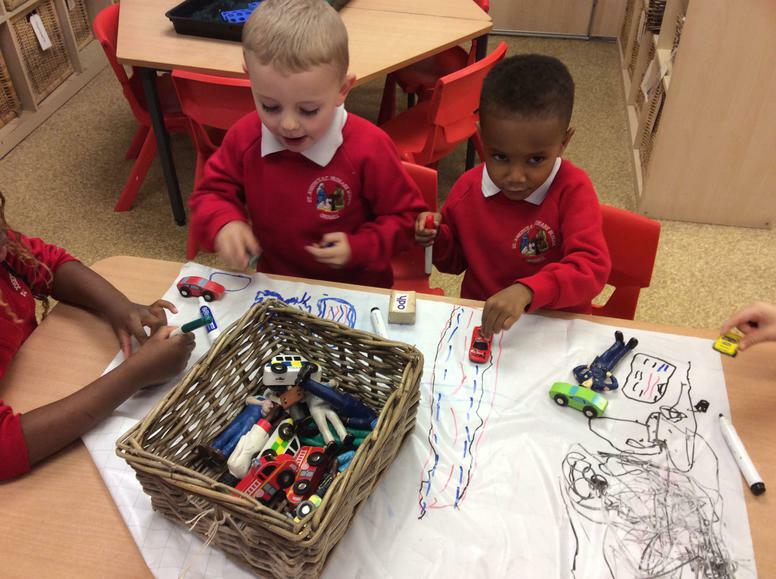 Our day began with a long Coach journey, but we made it fun by counting how many different types of animals and vehicles we could see. 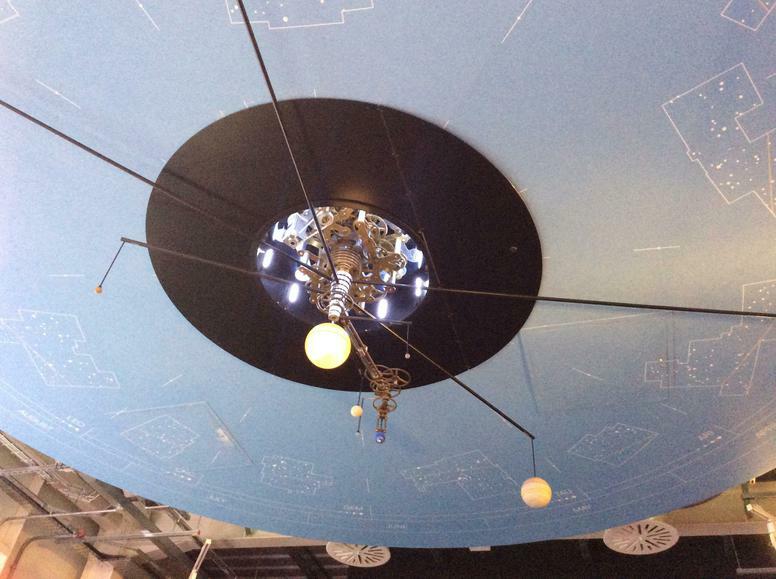 When we got there we went to look at the clockwork Orrery, we were fascinated with looking at all the planets, watching them orbit the sun. 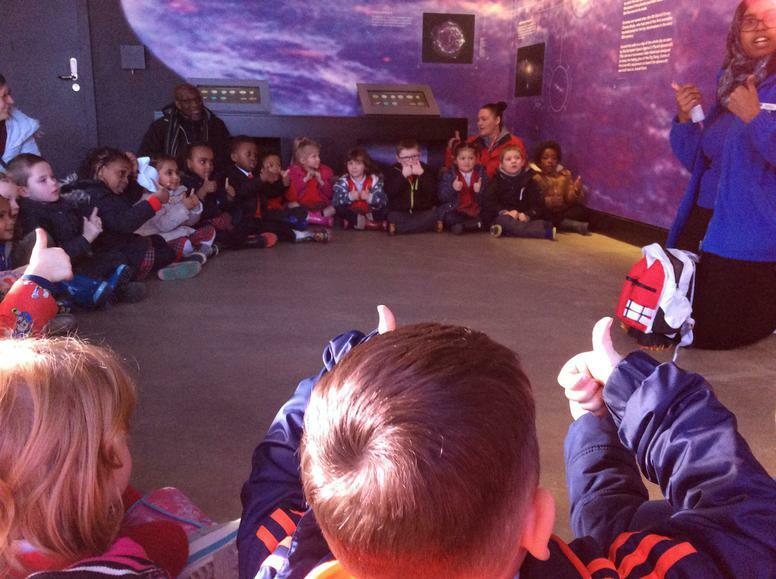 Sofia, one of the ladies who works at Jodrell Bank, spoke to us all about what we would need for a trip in to Space. 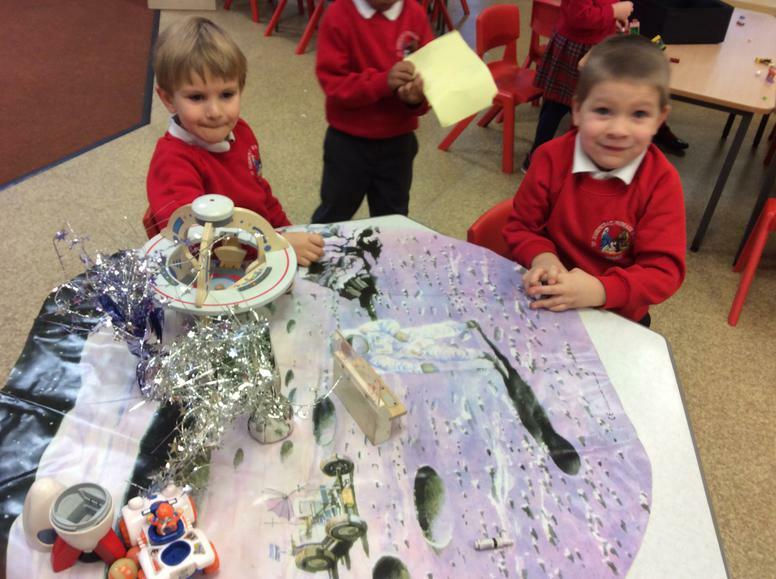 She was very impressed with our knowledge of astronauts including Neil Armstrong, Buzz Aldrin and Michael Collins not forgetting of course Tim Peake. 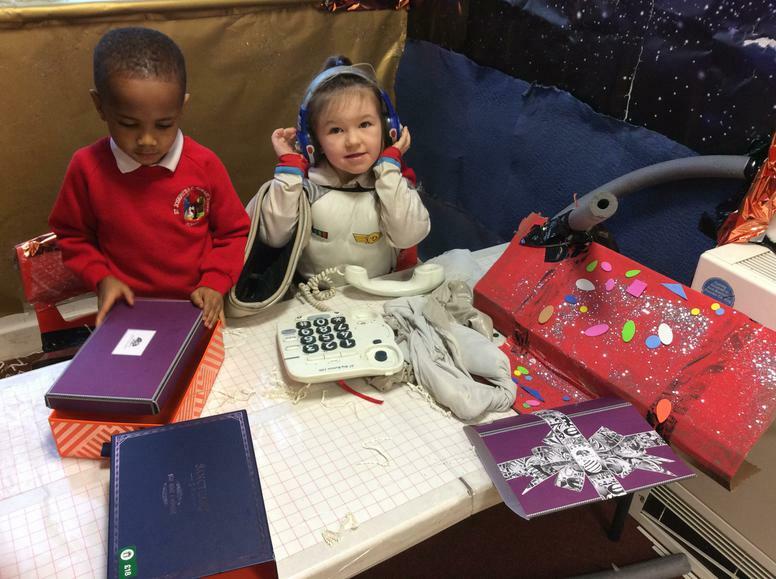 We packed our space packs and she took us on a journey through space stopping and talking about the different planets that orbit the sun. 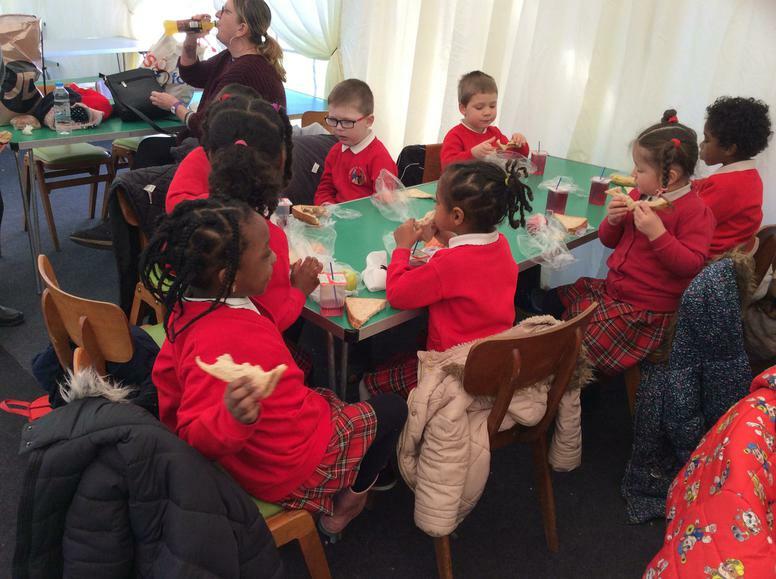 After all that learning we were extremely hungry so we decided to eat our lunch. 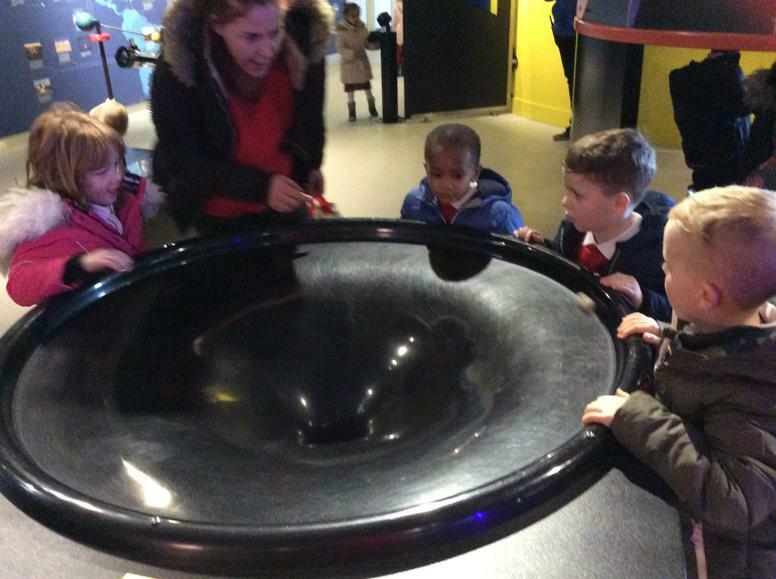 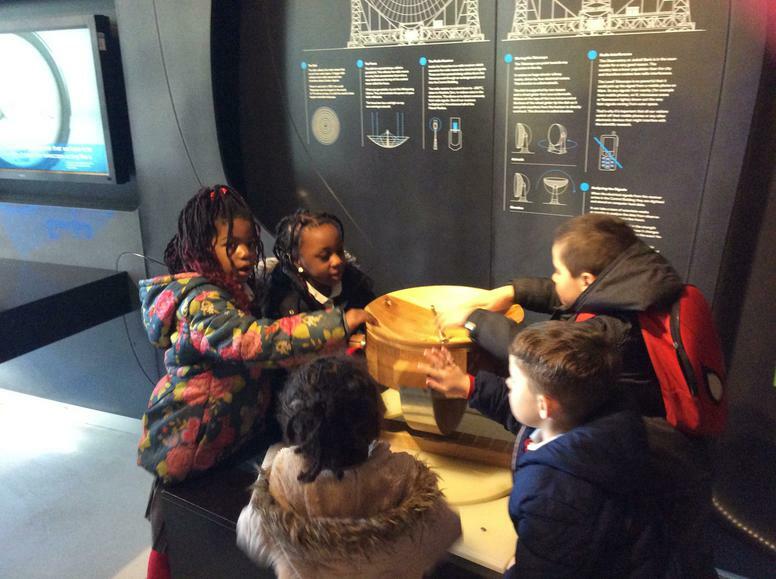 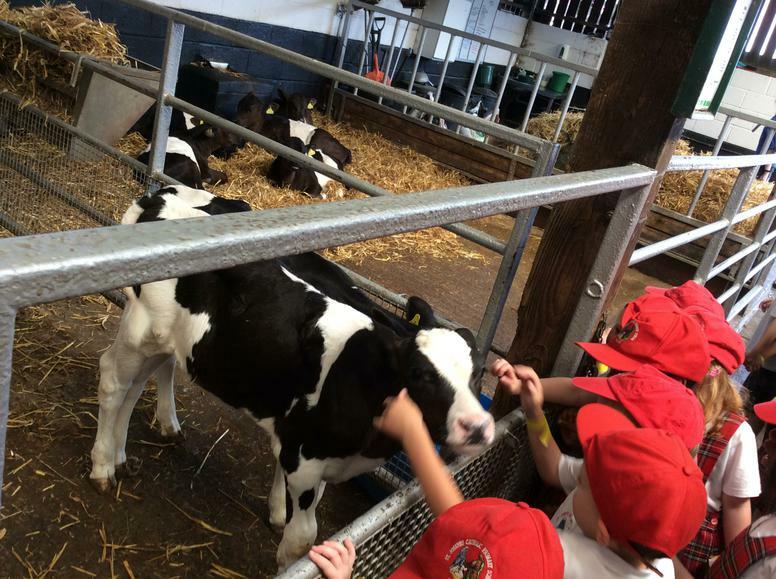 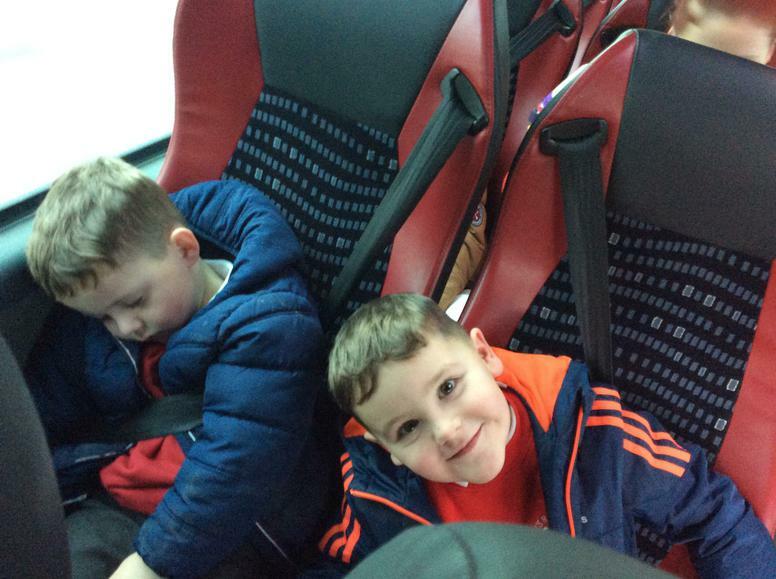 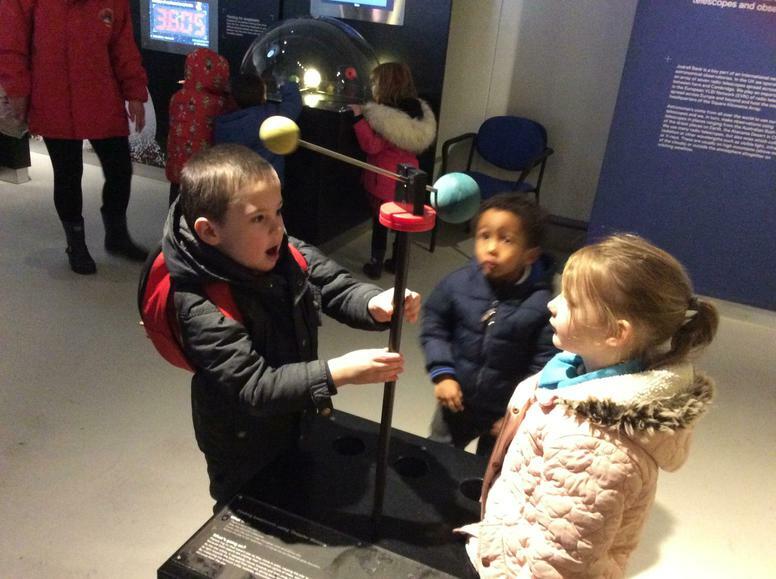 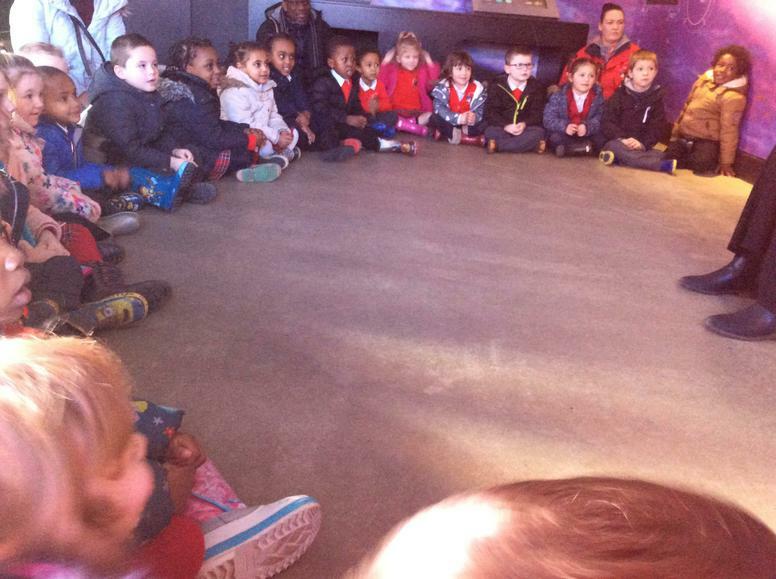 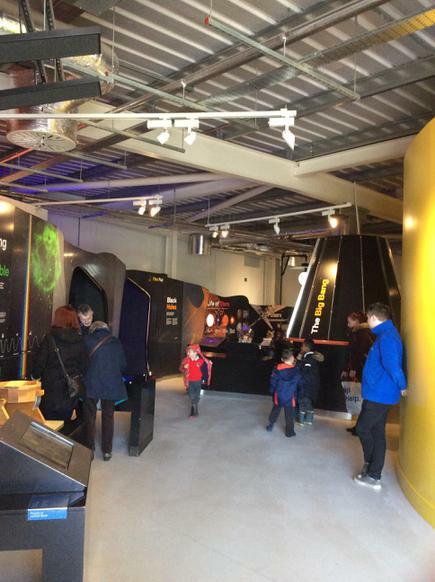 Next we went to the discovery centre and explored the entire exhibition, we really enjoyed listening to the big bang. 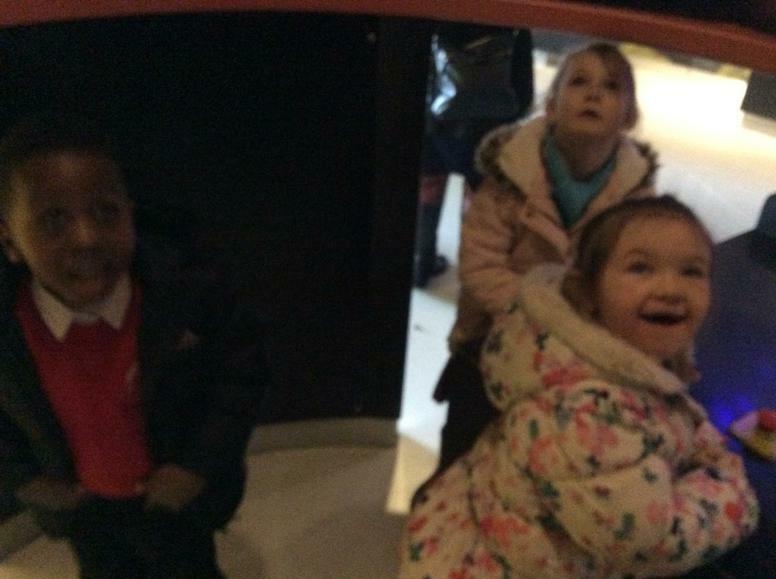 Then for the part we had all been looking forward to the Planetarium! 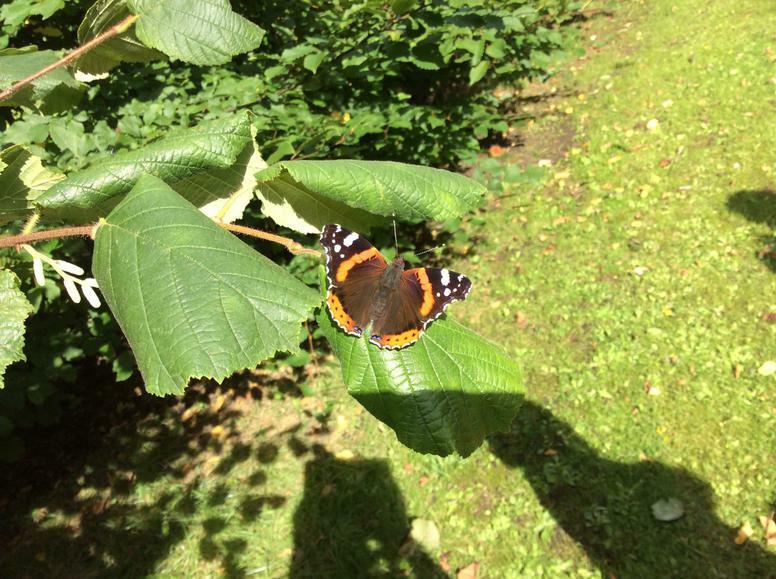 It was amazing; we began by watching the sunset and waiting for all the stars to appear. 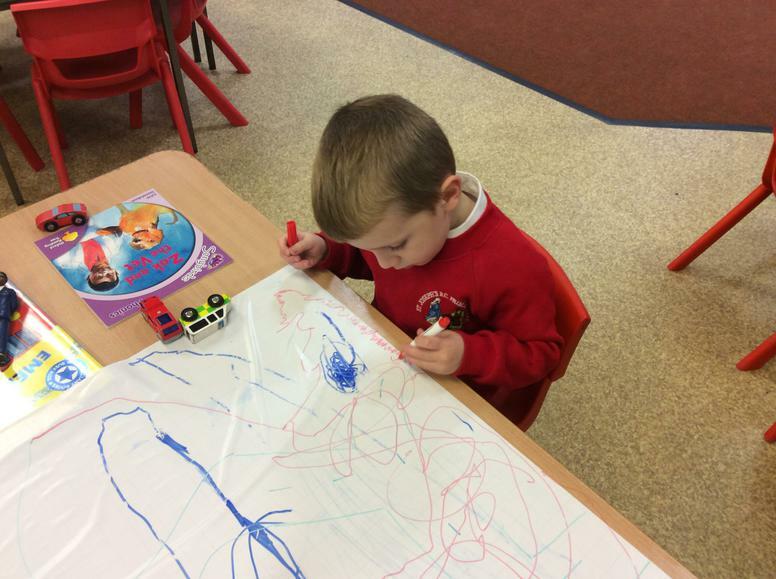 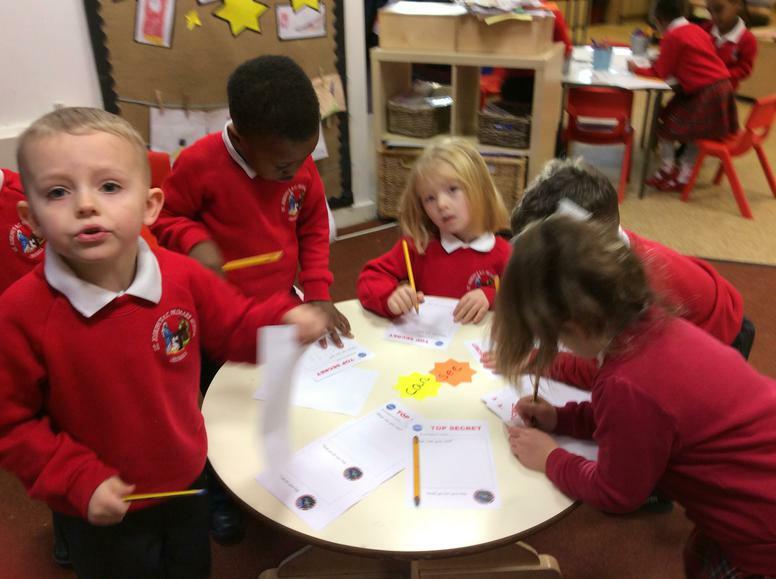 We spoke about different constellation, some of which we could even tell the teacher about! 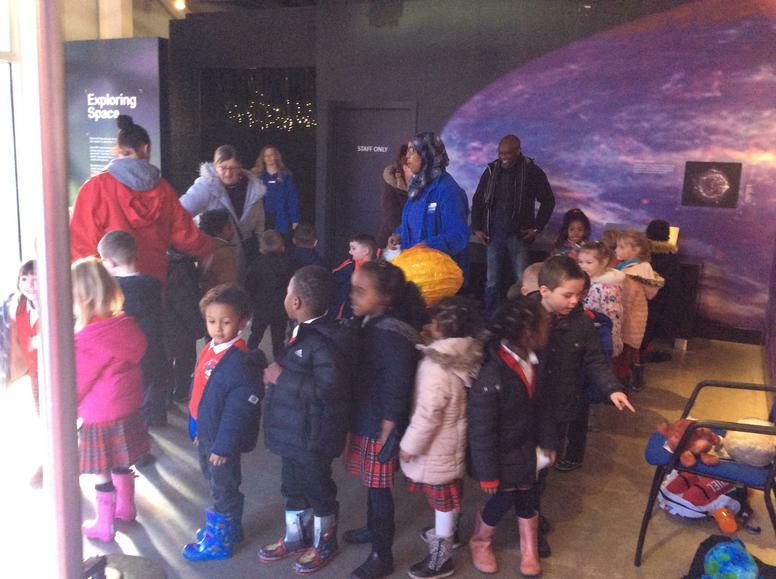 We then went on to look at some planets and finally the moon. 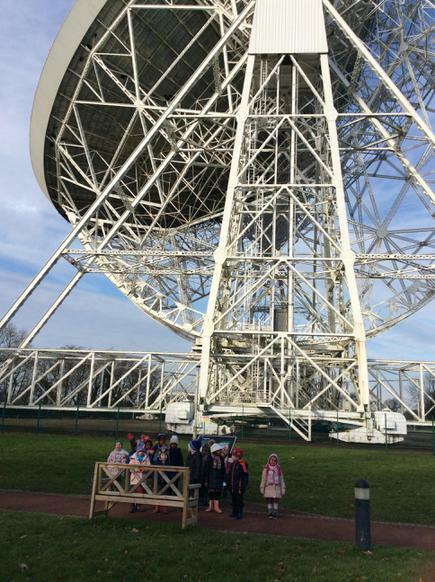 Next we went for a big walk around the Lovell Telescope it was HUGE! 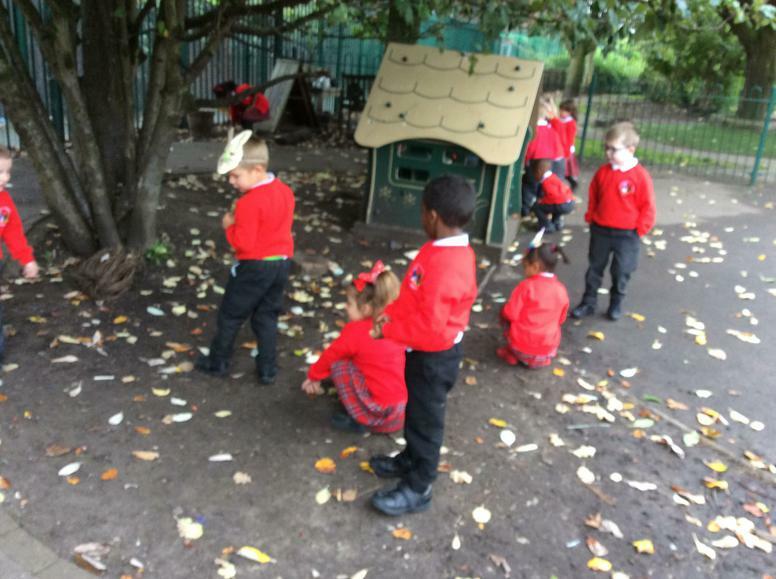 Finally, we explored the gardens and played in the park before our long journey home. 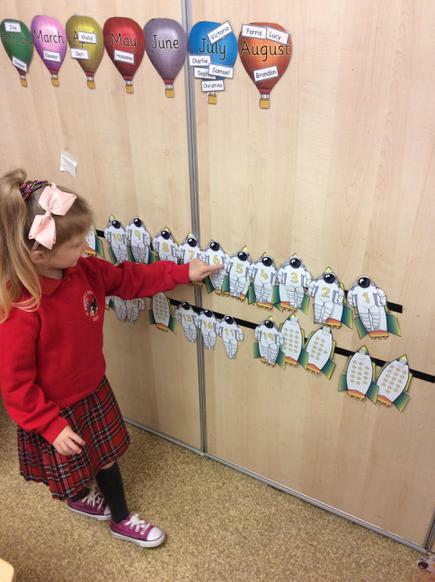 The children have had a fantastic time making up a song about underpants on a washing line. 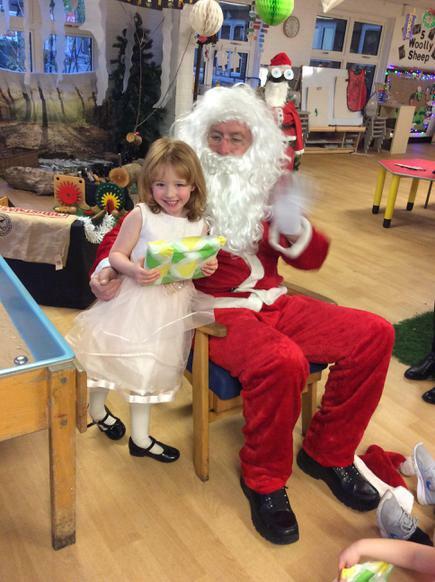 We have sent a copy home for the children to sing with you, we hope you enjoy it. 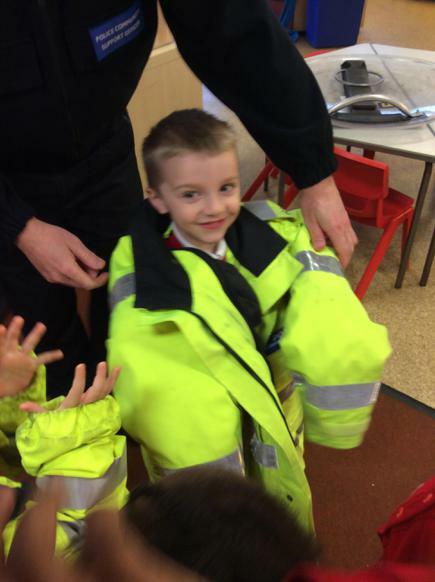 To extend your children maybe 2 Aliens could take away 2 pairs of pants. 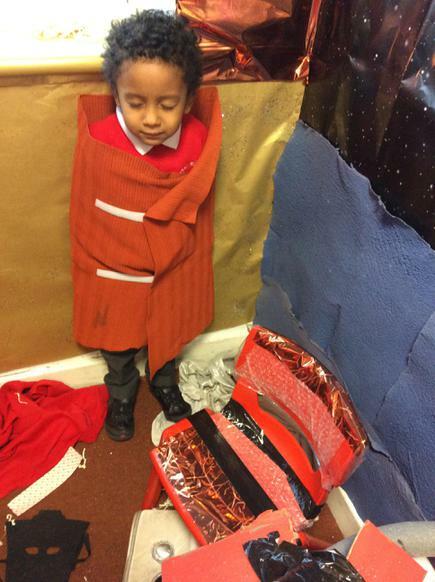 After weeks of rehearsal the day of the Nativity finally arrived. 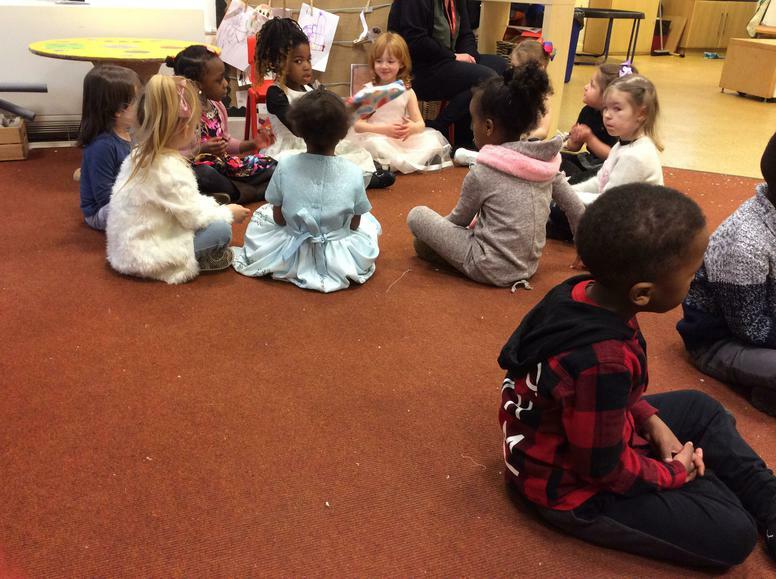 In the morning the children got changed in to their costumes as the hall filled with friends and family eagerly waiting for the show to begin. 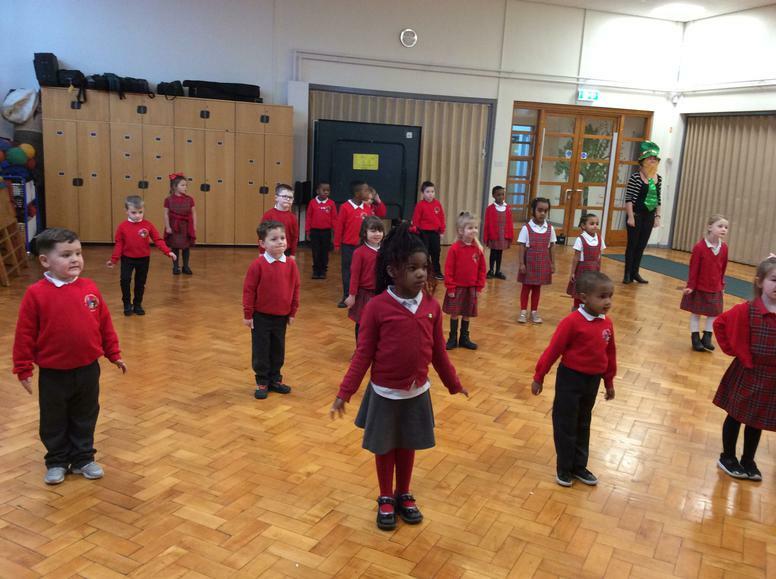 The children performed AMAZINGLY and we are all so proud of them. 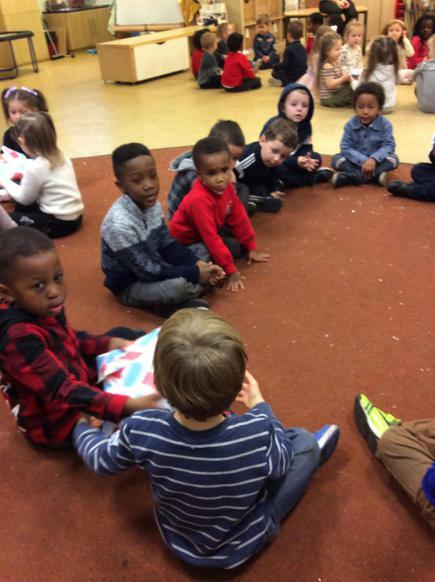 They sang beautifully and spoke in clear voices. 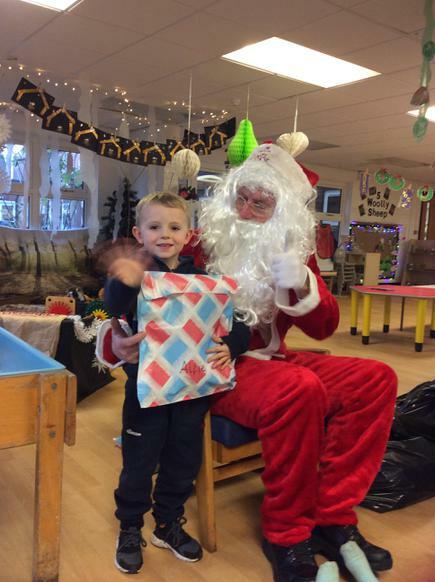 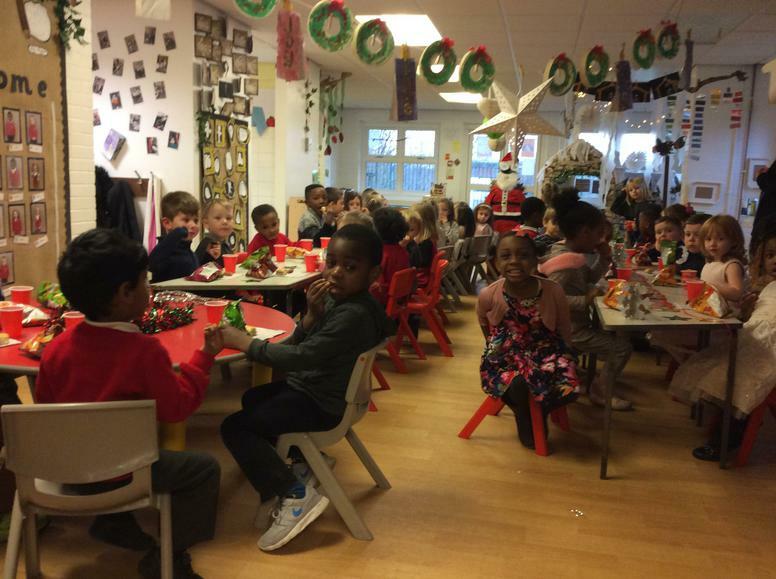 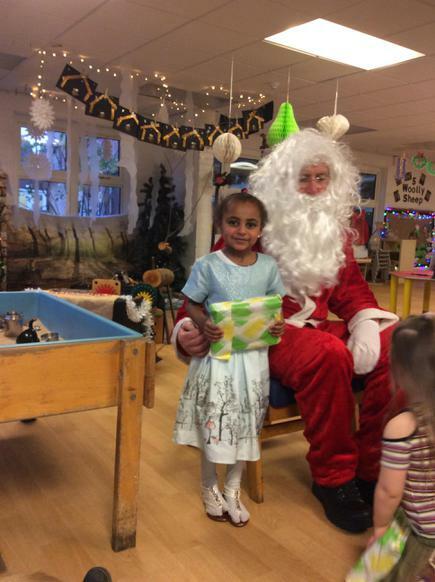 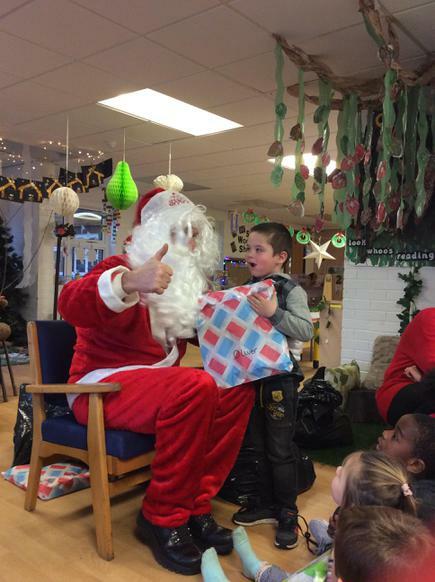 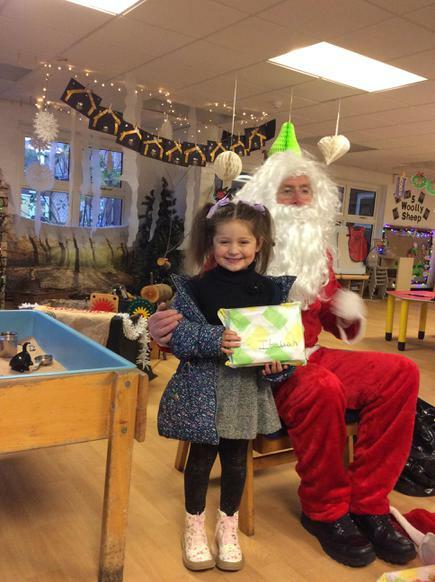 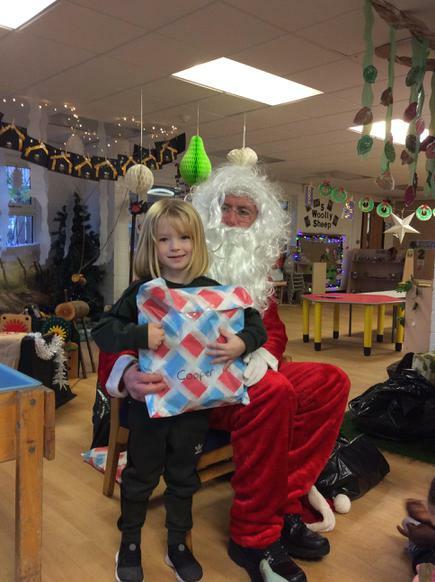 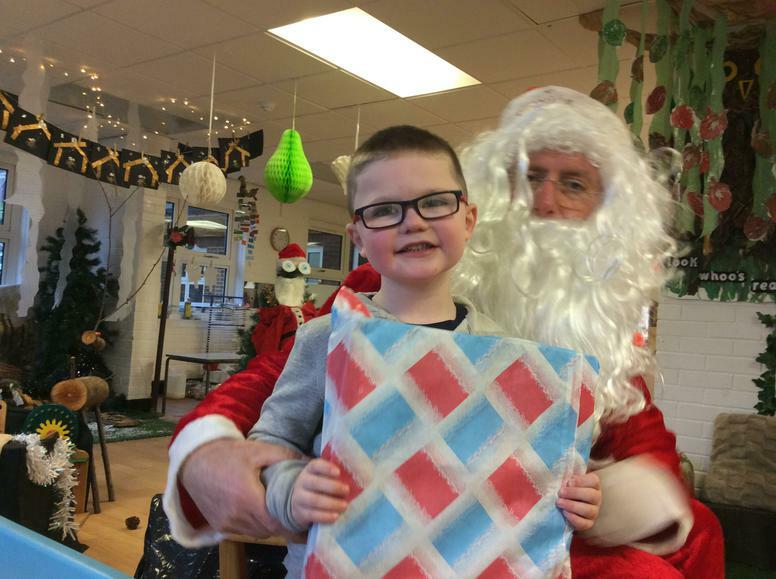 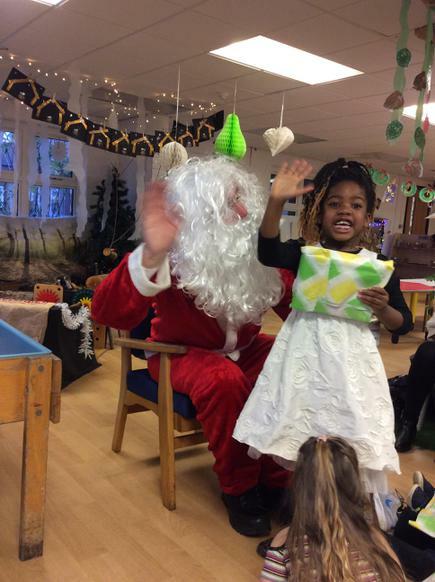 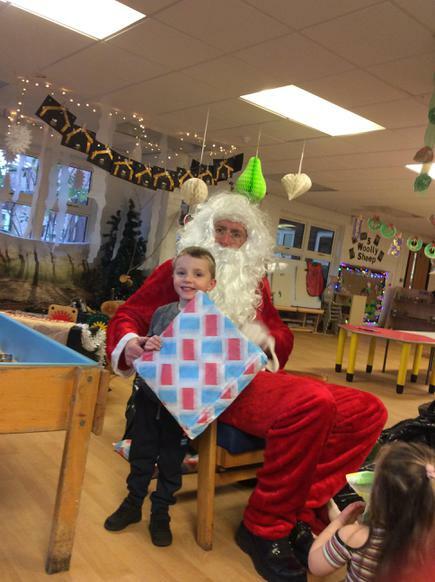 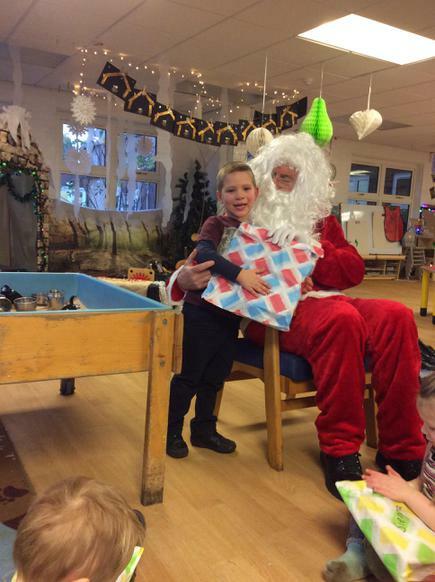 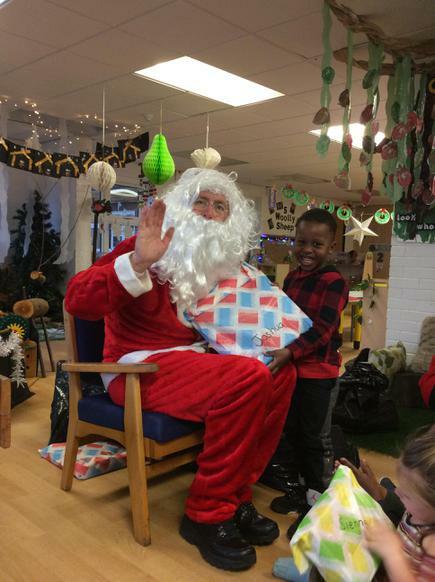 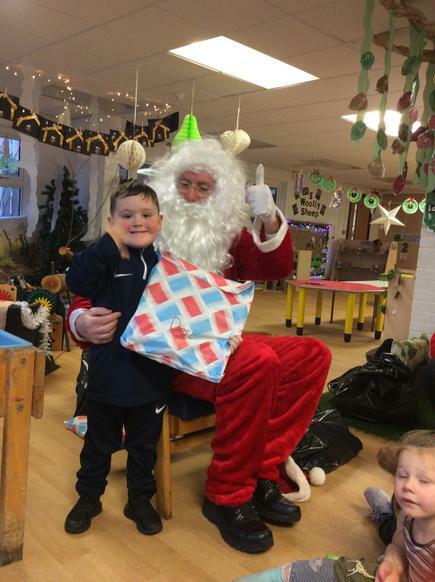 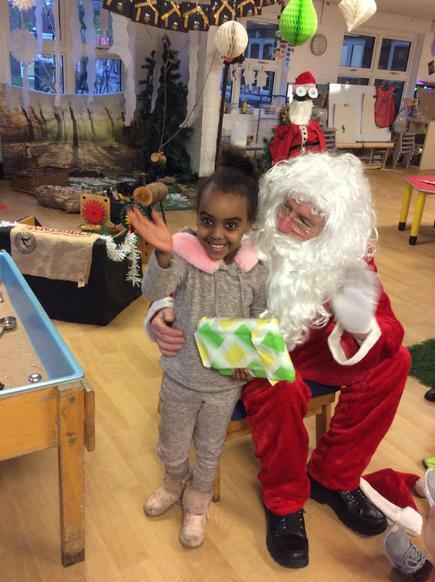 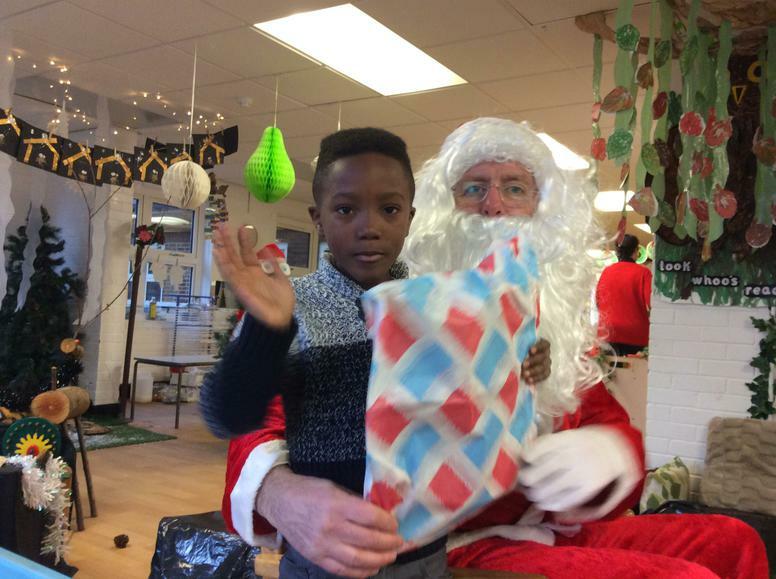 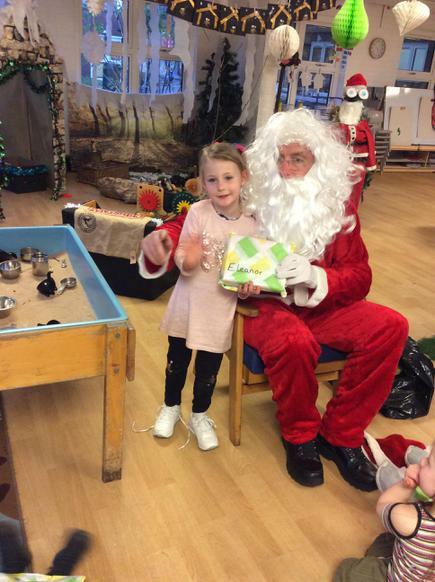 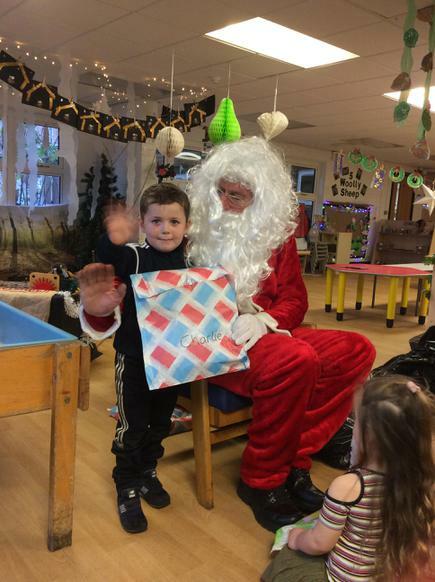 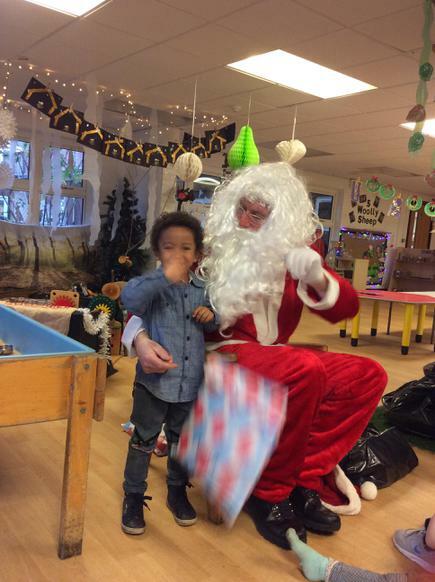 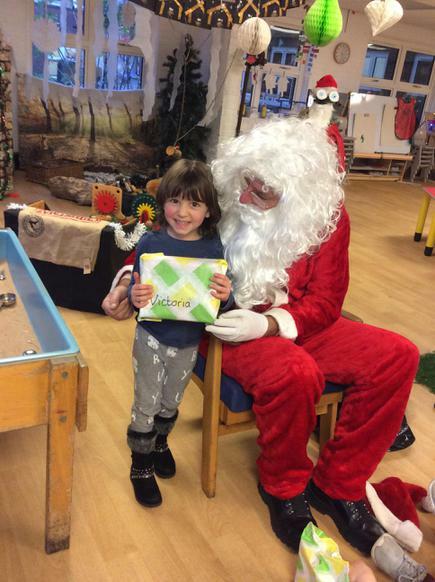 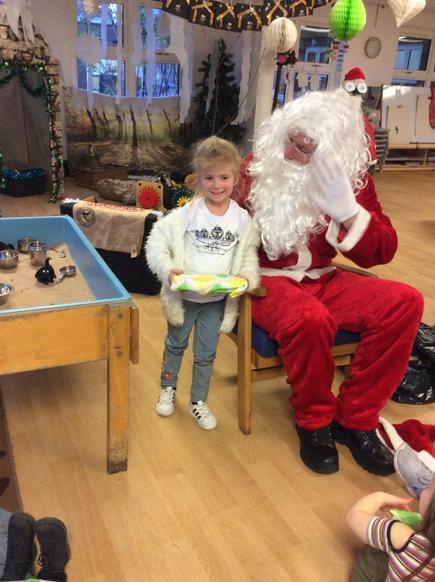 The children in Foundation Stage love a 'good boogie' so after all an exhausting morning performing the Nativity we had a Chritmas Party to celebrate. 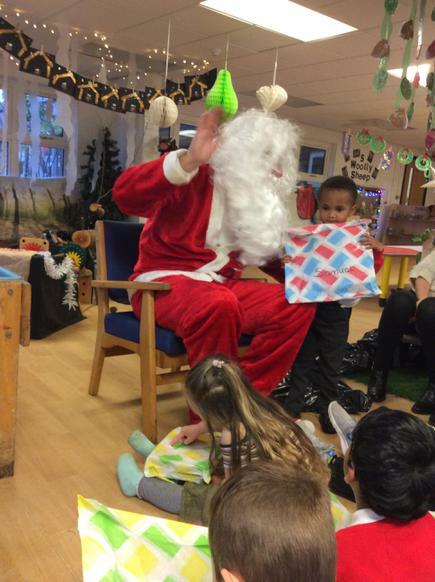 Can you guess who it was????? 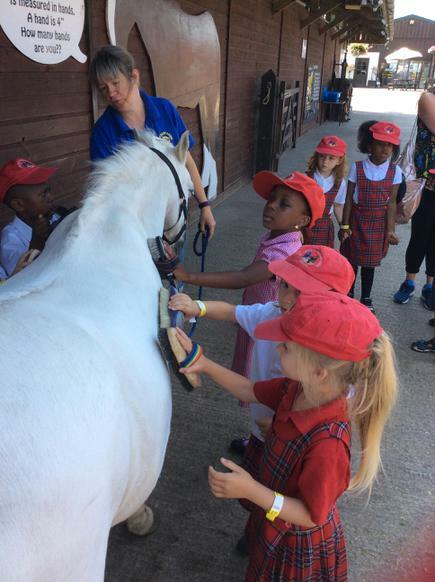 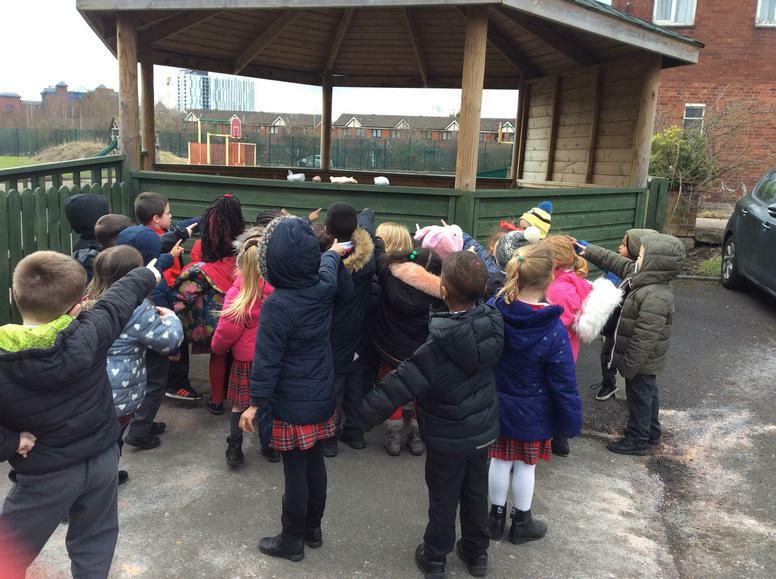 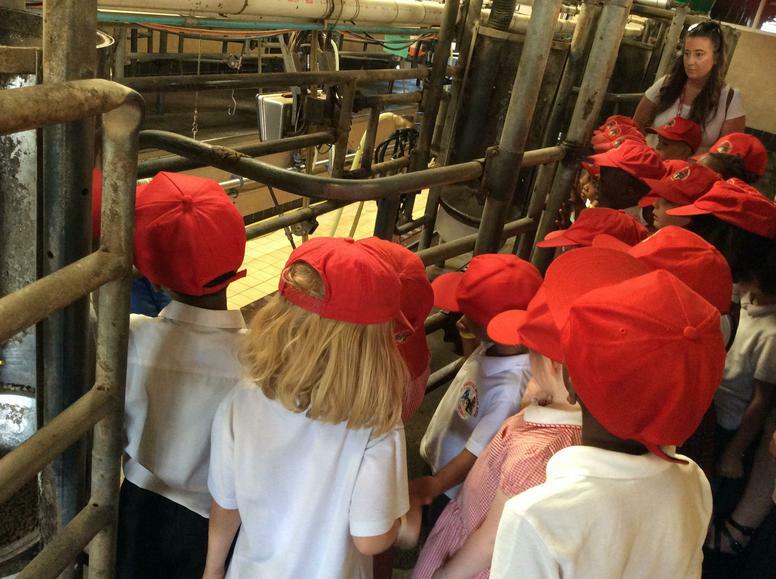 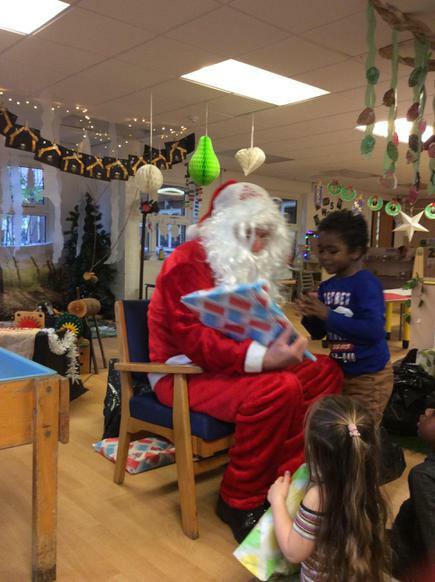 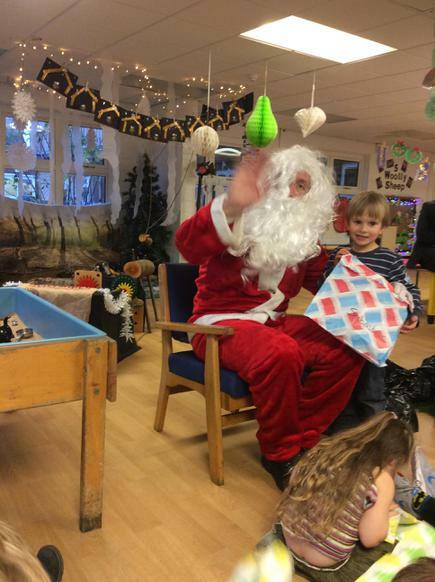 Some of our Reception children were lucky enough to be given the opportunity to sing along with Dodge, see if you can spot your friends. 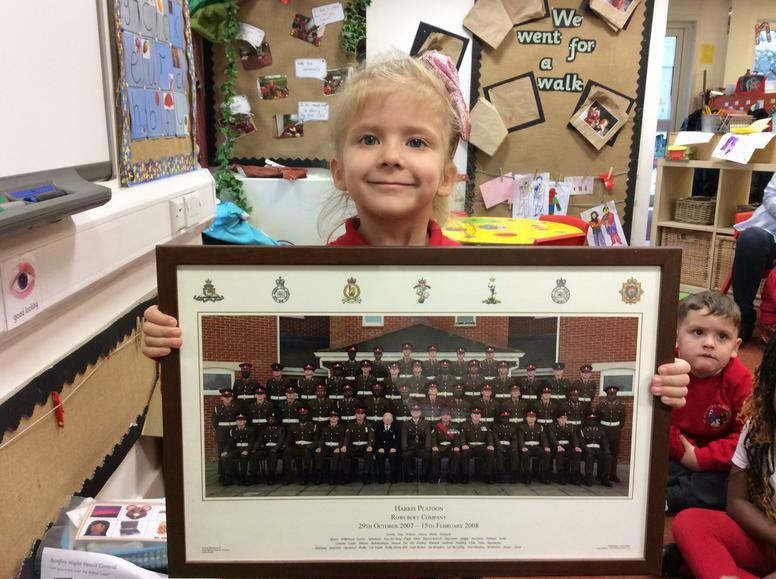 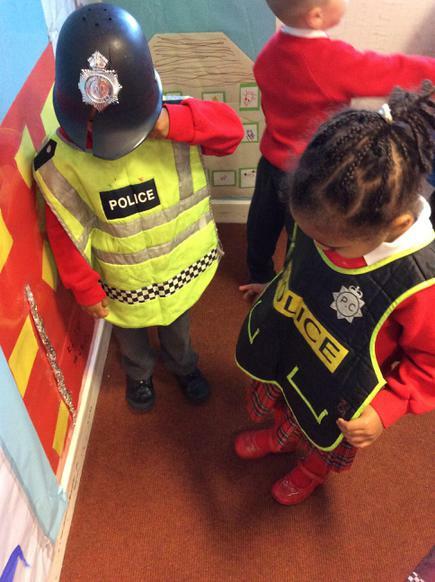 This term we are going to be learning all about the different people who help us in our community. 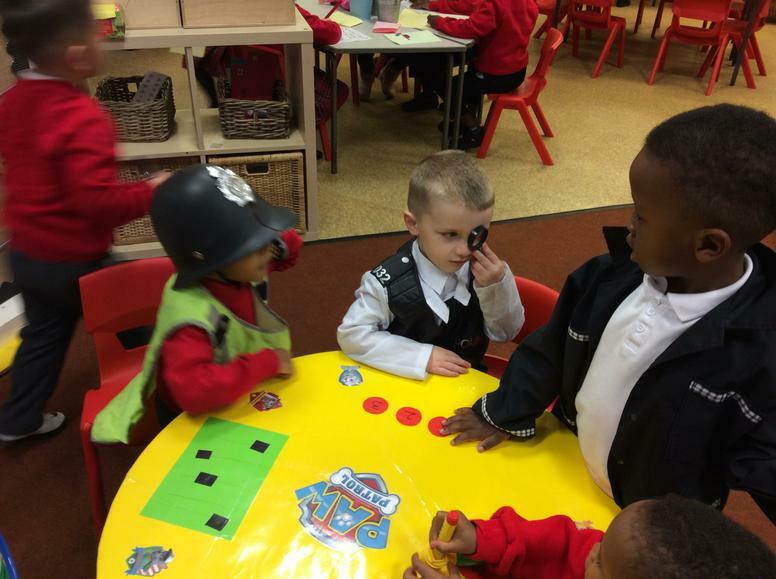 Doctors, Nurses, Dentists, Police, Fire Fighters, Postal Workers, Priests, Teachers, Vets, Refuse Collectors, Armed Forces to name a few. 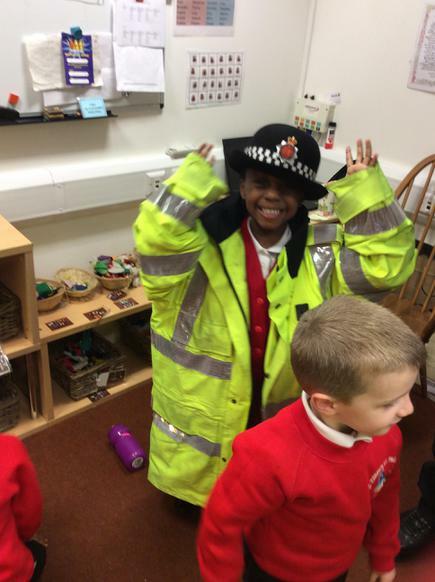 If you or any of your friends and family work in any of these roles we would love to hear from you. 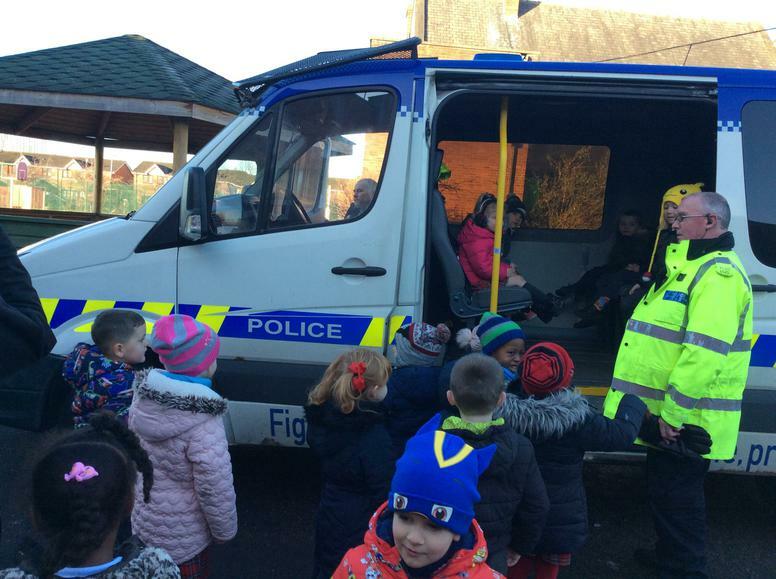 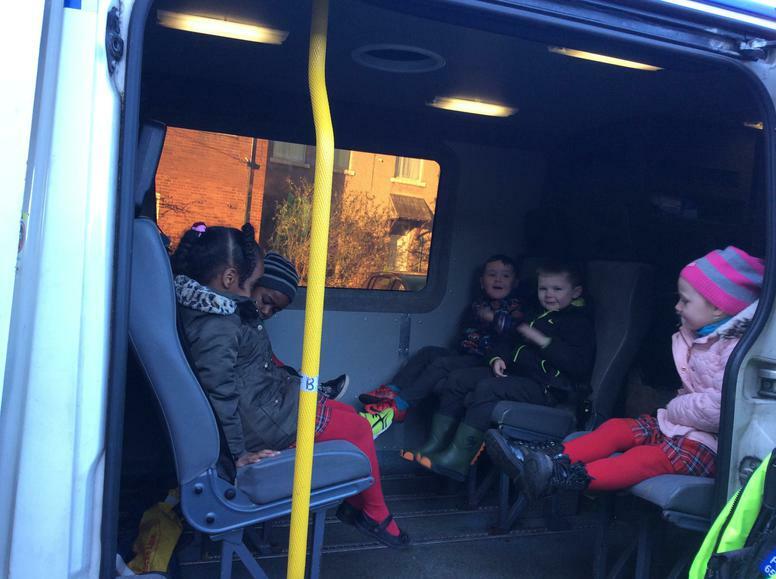 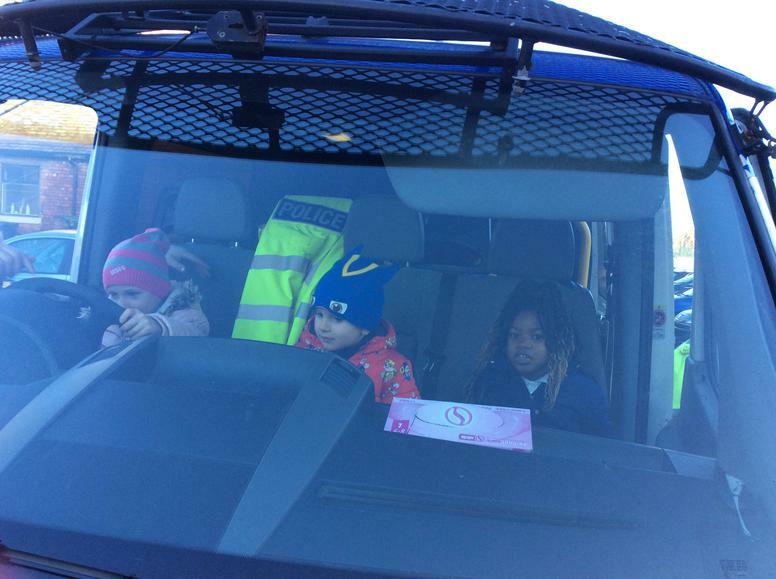 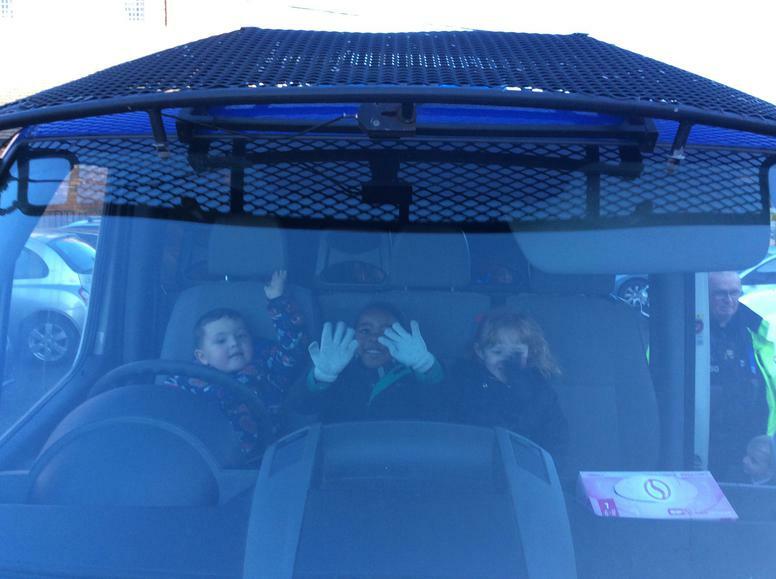 The children had a fabulous visit from PCSO Mark and Officer Nigel, we began the visit by looking in the Police Van, some of us even turned on the sirens! 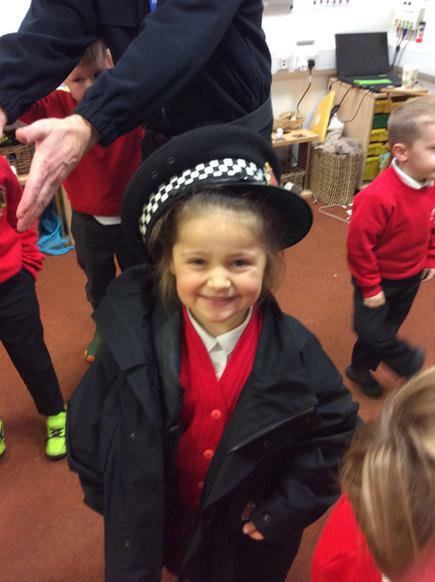 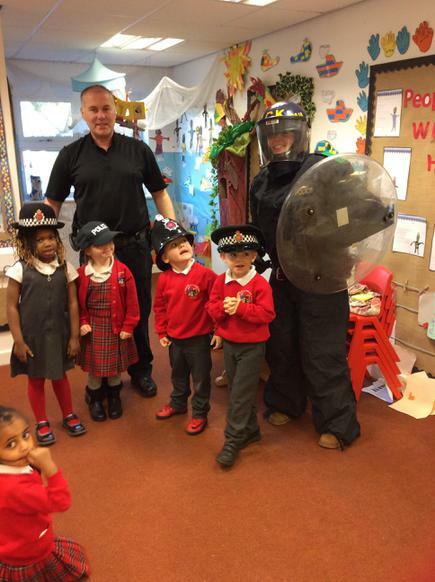 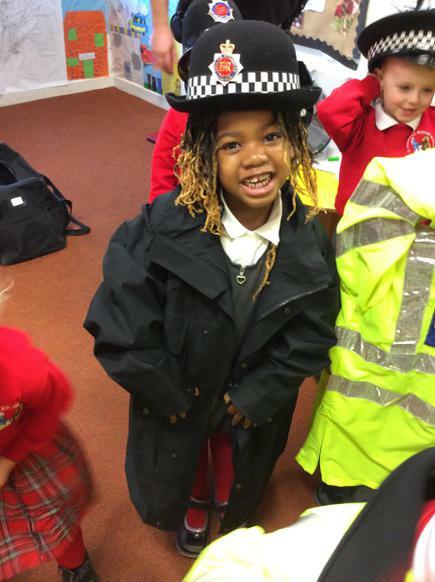 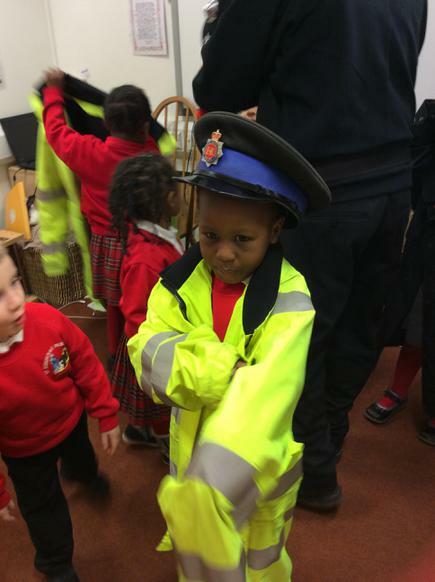 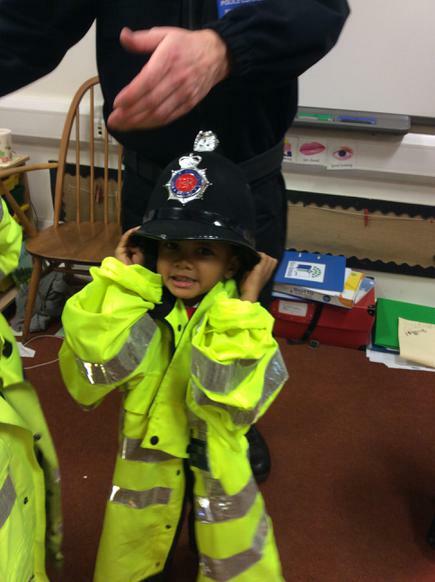 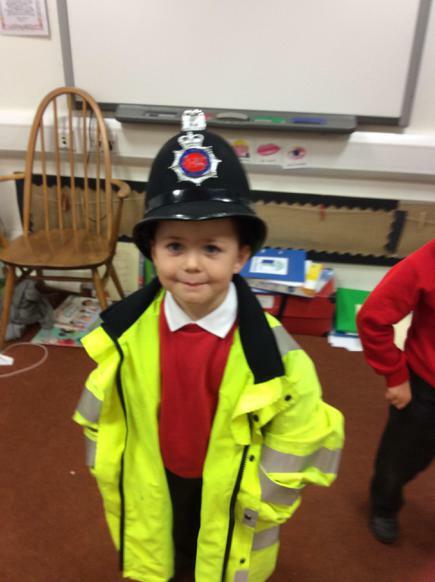 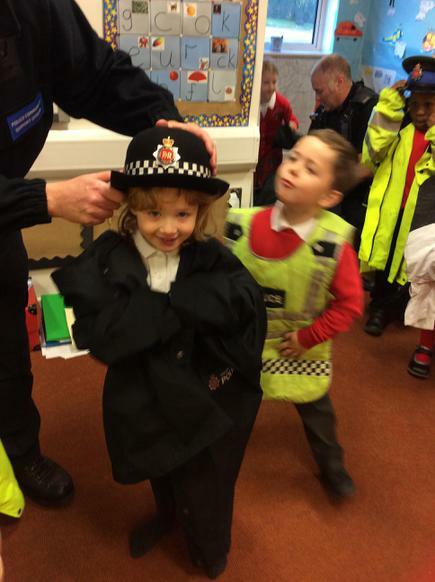 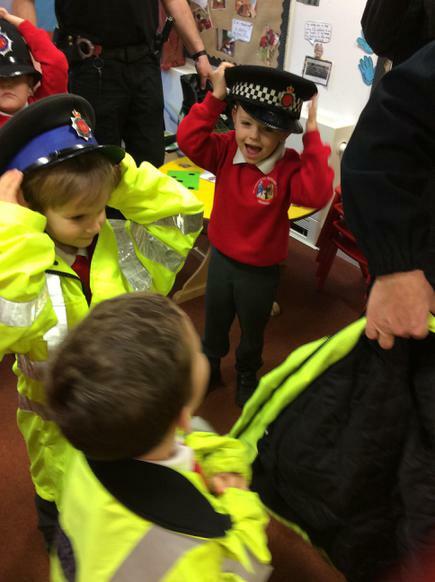 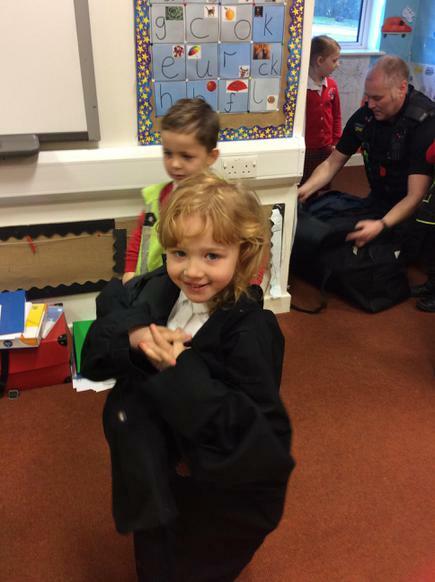 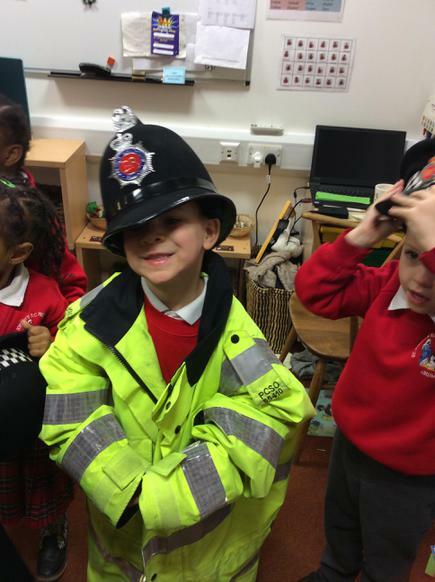 We then went back to class and Mark told us all about how the police help us in our communities, then we got to try on some of the equipment- Miss Woolman even joined in, can you spot her! 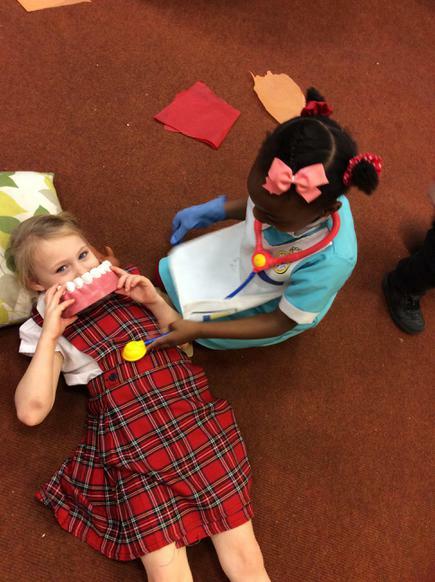 Today we had a visit from play Dental, a fantastic team to help teach the children all about how to look after their teeth. 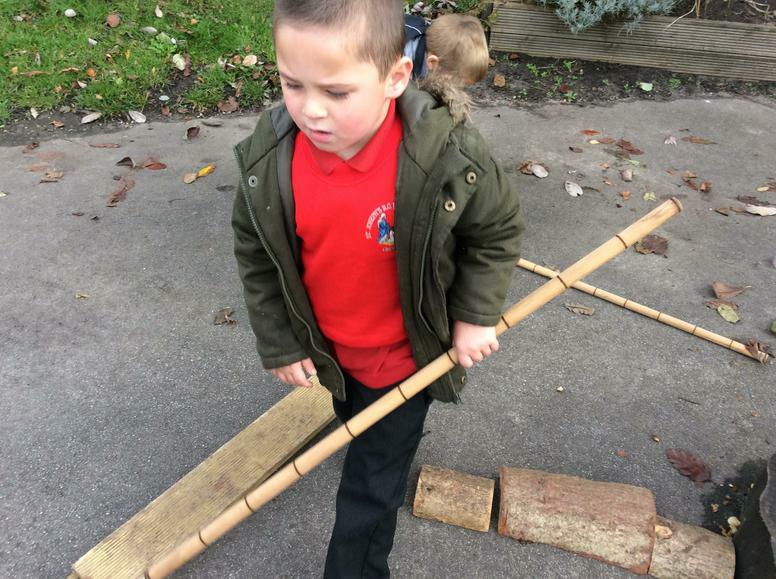 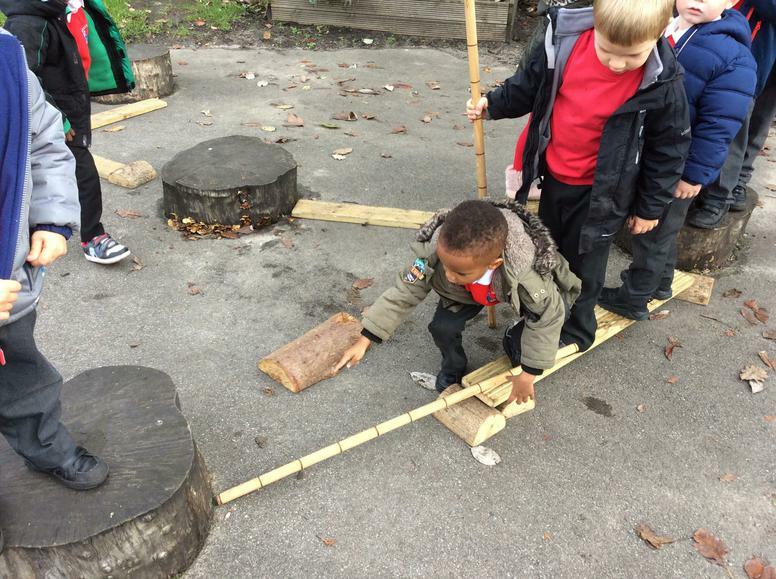 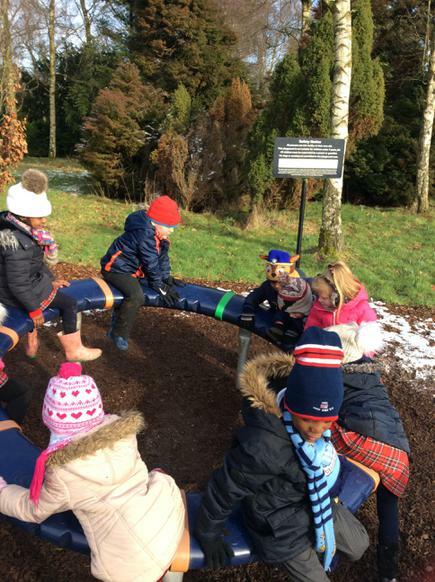 The children have really enjoyed playing ‘floor in lava’ where they must walk on planks to navigate around the playground. 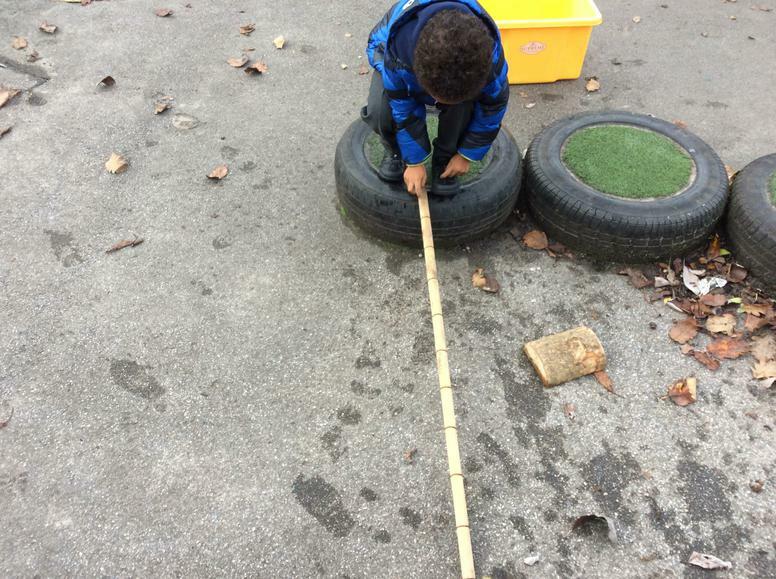 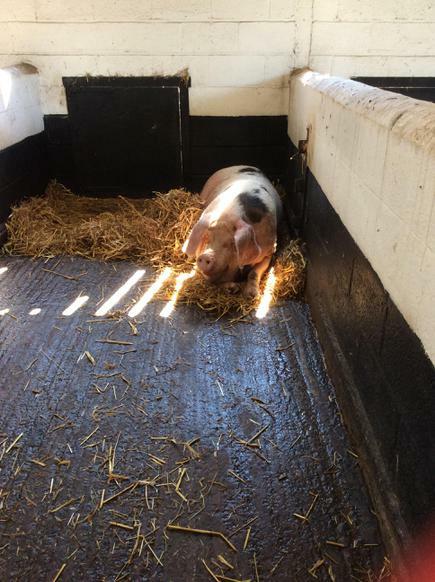 But there was a problem... the spaces were too big and the planks too short! 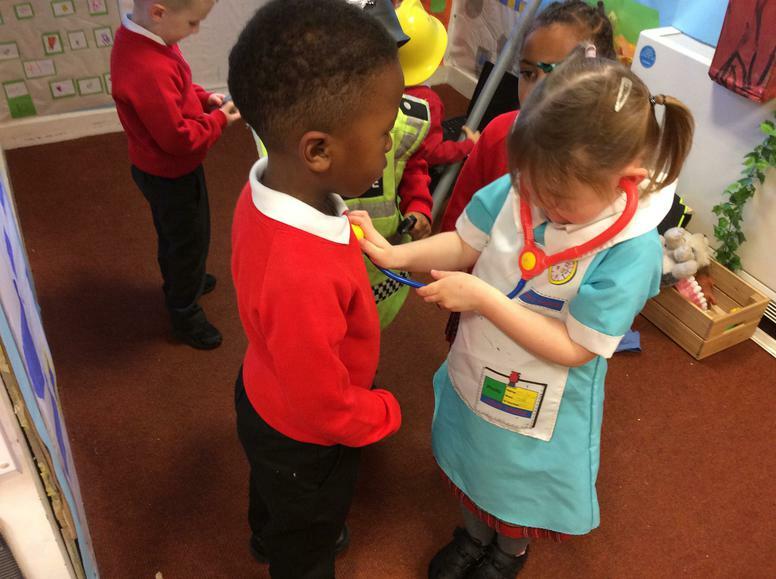 The children came up with a plan "we need to measure it"
" this is 10 we need a big one"
"This one is 6 I can jump that"
This year for Children in Need we invited children to come to school to dress up in spotty clothes, we had some fantastic outfits, well done everyone. 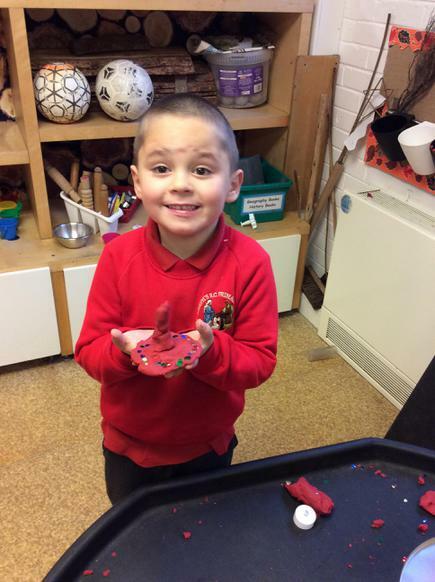 We made some spotty cakes for our snack and loved our visit from Austin the Ice Cream Man at lunch time. 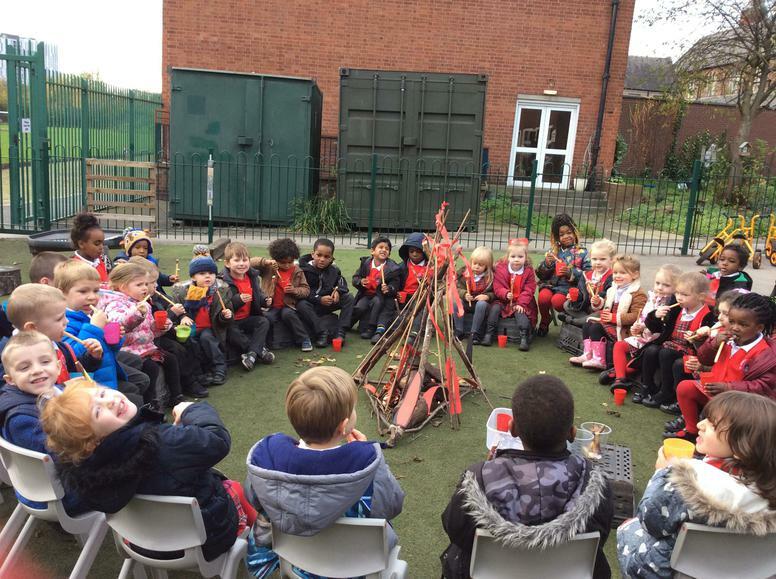 We made sparklers with popping candy and sprinkles then sat around the fire whilst drinking hot chocolate. 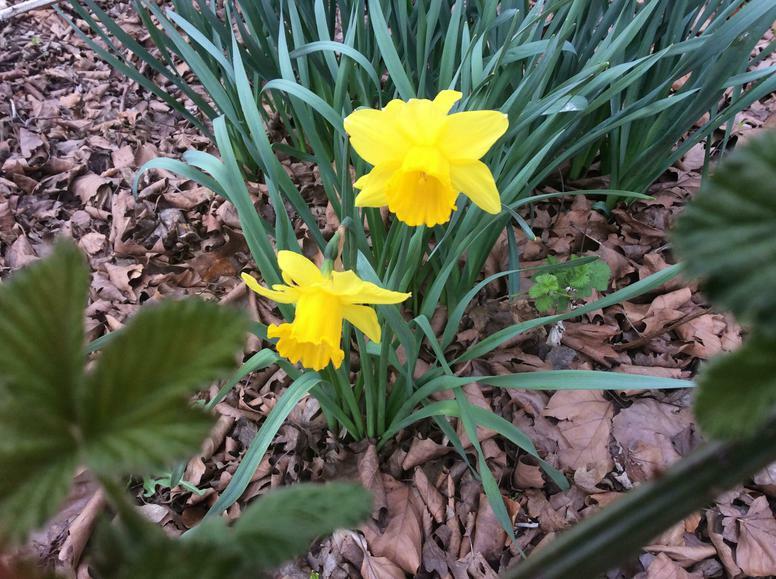 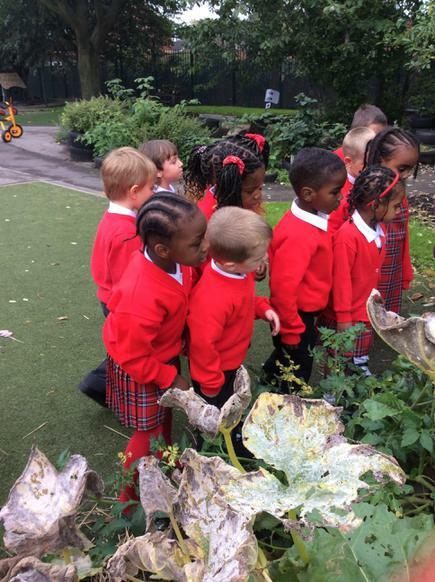 We will be going on lots of walks to observe the changes to our gardens over the coming weeks. 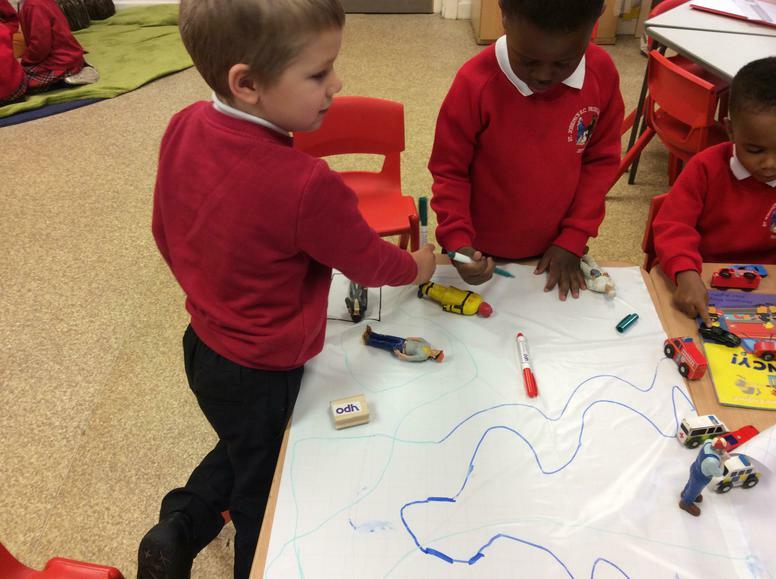 We will then use this to make books, create patterns, count, discuss how the changes makes us feel, create pictures, inspire our imagination and many more exciting activities. 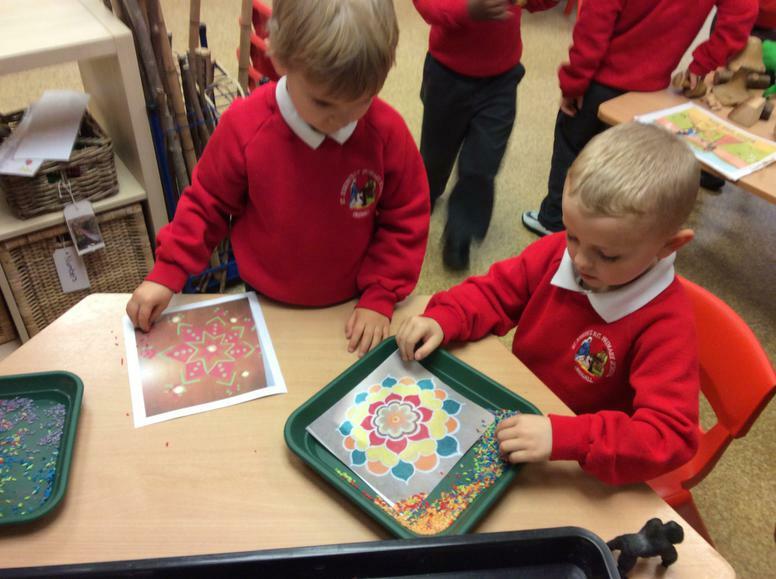 In school we have been learning about a different religion, Hinduism so we decided to join the Nursery in celebrating Diwali. 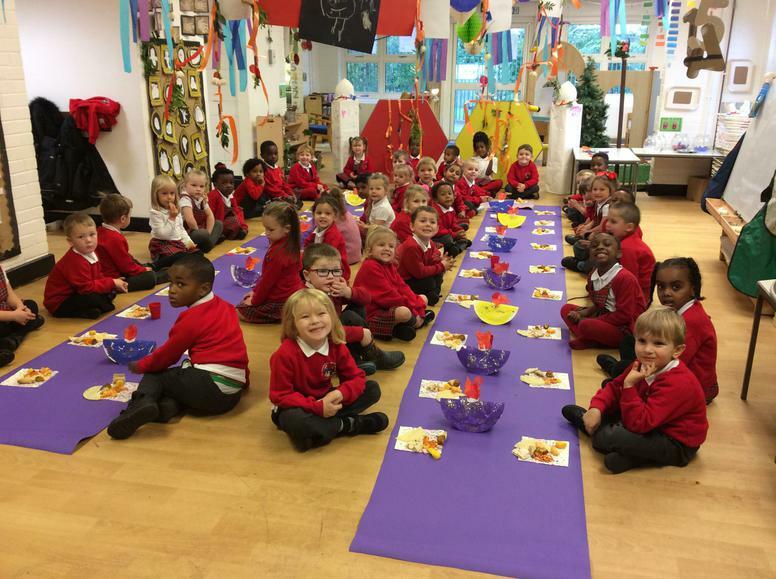 On Friday we joined with the Nursery to have a Diwali celebration where we tried different Indian food and shared our learning from the week. 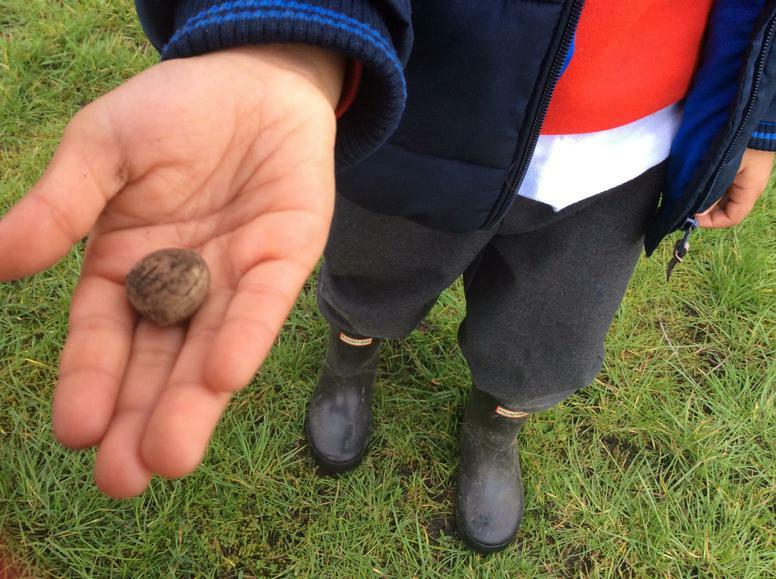 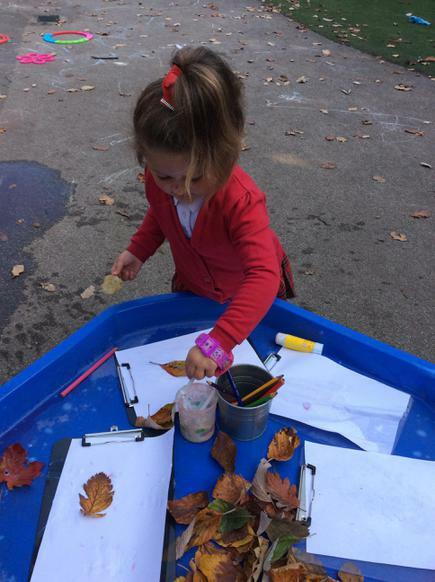 we then wrote Scampers a letter telling him how many acorns we have each found. 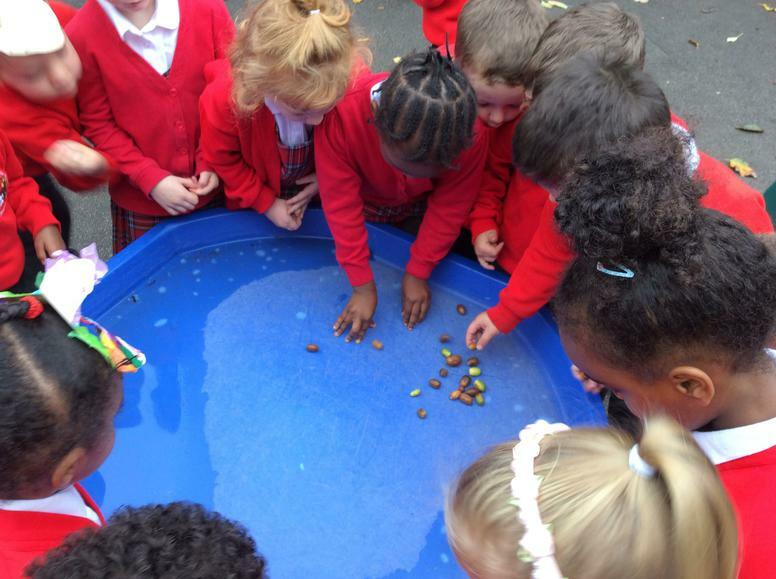 We then matched the correct amount of acorns to the numbers and ordered them. 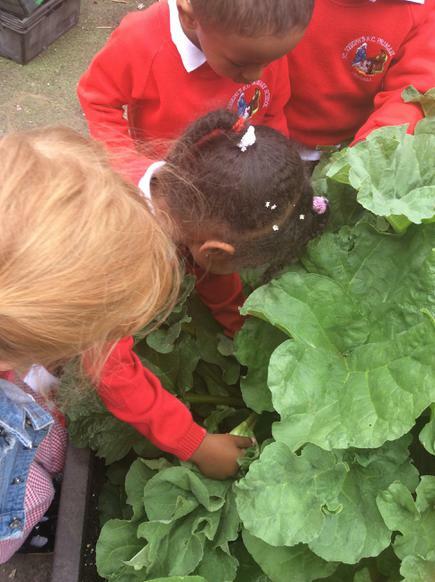 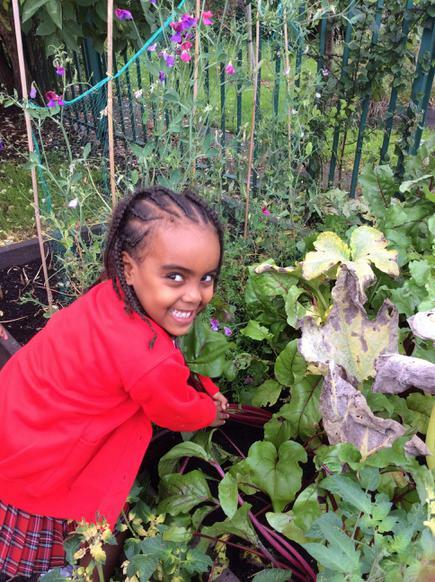 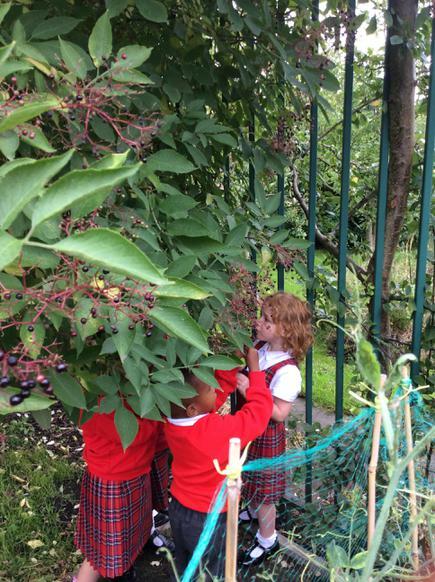 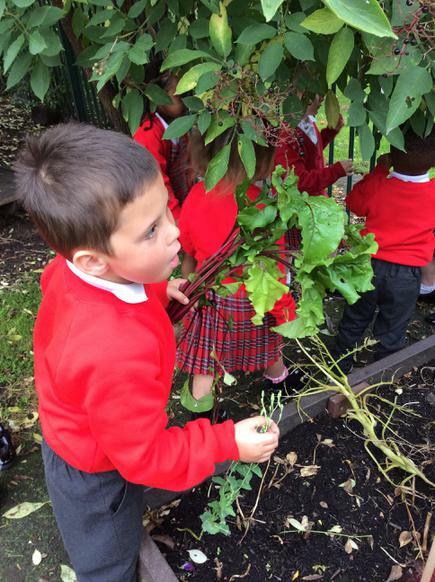 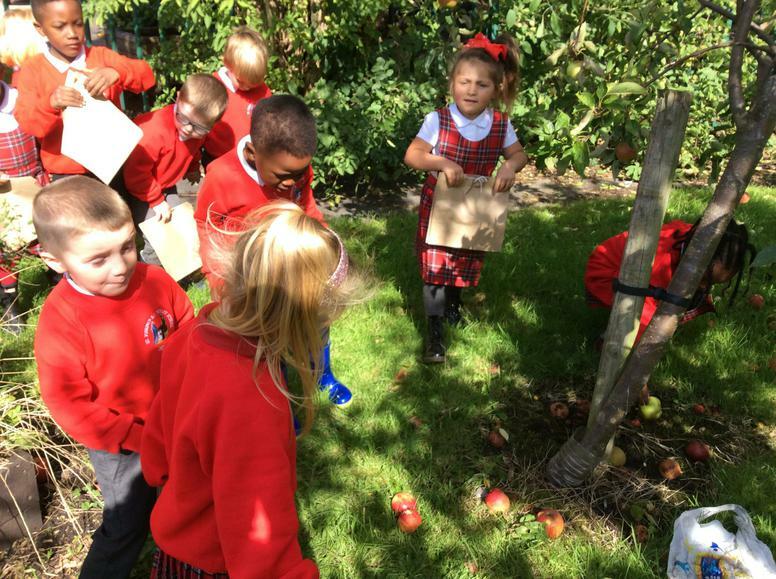 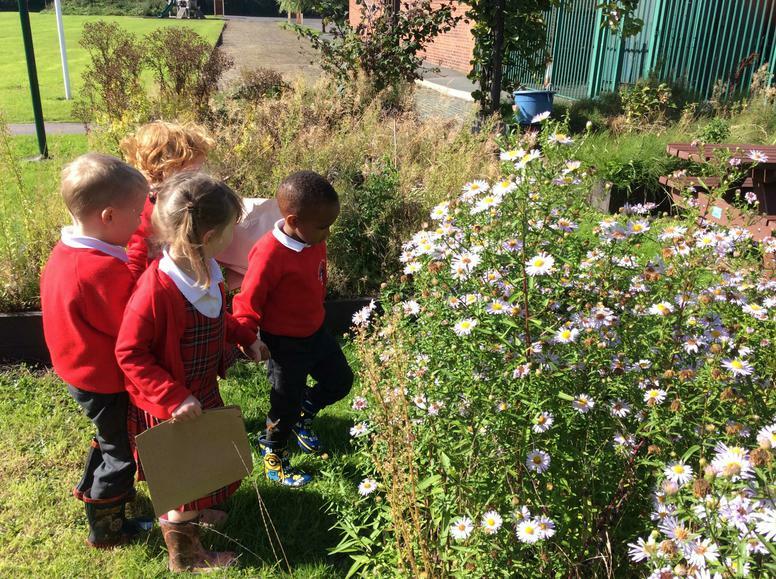 We decided to go on an early Autumn walk so we could look at all the things that have grown over the Summer and to help us compare the gardens over the next few weeks. 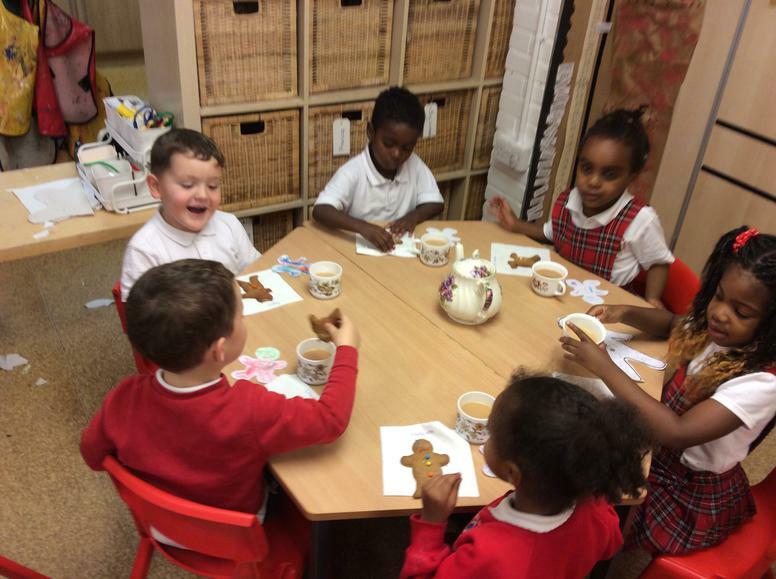 "look a butterfly" "Wow, so many apples"
"I hope they aren't poisoned "
"I found a snail" "I love the purple flowers"
For our MacMillan Coffee Morning we decided to make some gingerbread men. 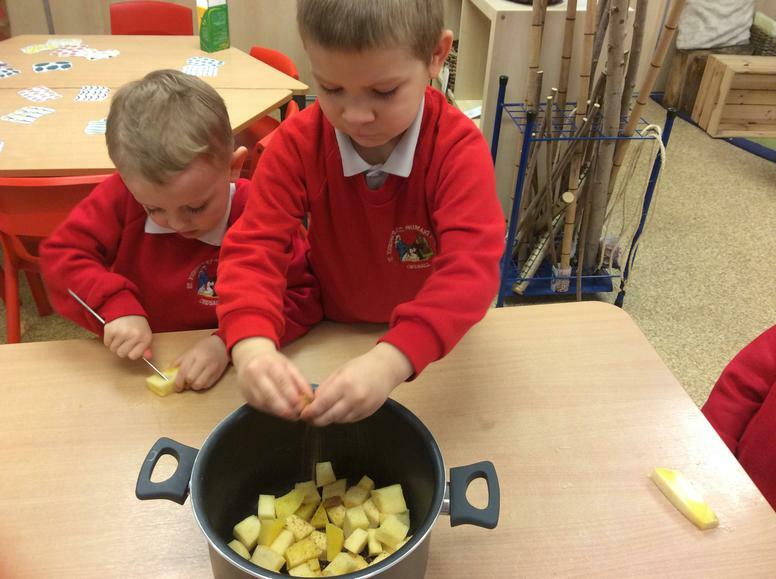 We began by looking up the recipe in a recipe book, we then made a list of all the ingredients we needed. 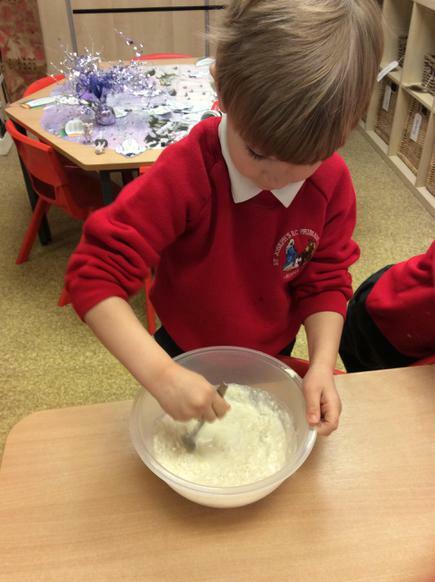 The next morning we weighed and measured all the ingredients then mixed them in the bowl. 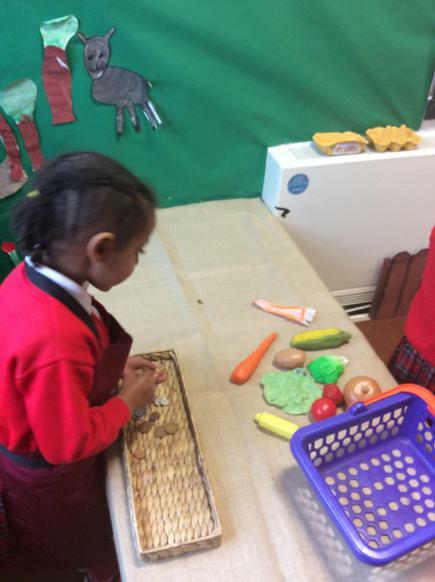 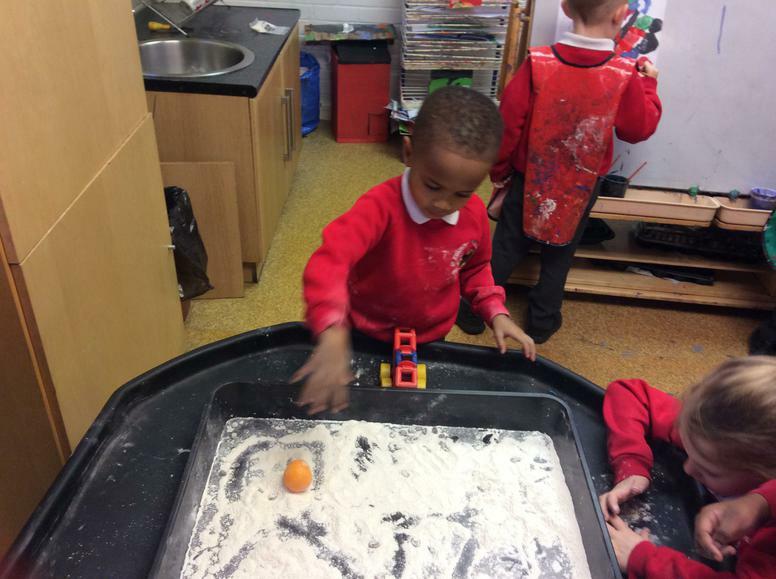 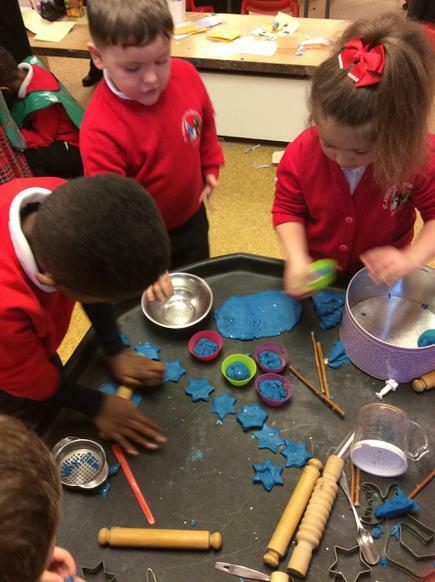 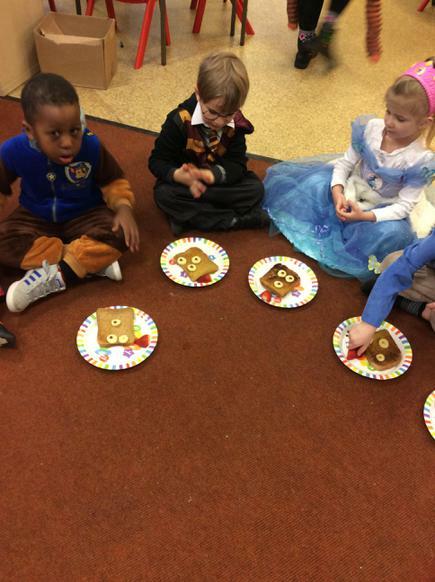 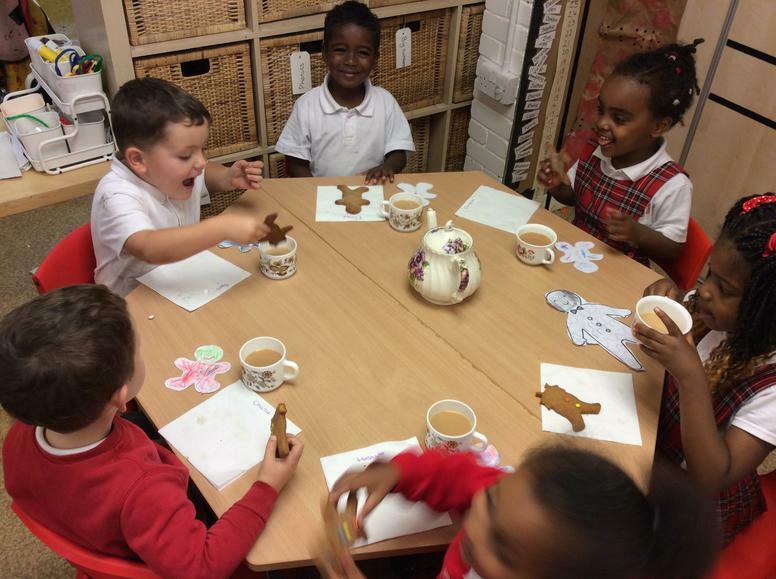 We then rolled out the dough and cut out our gingerbread men. 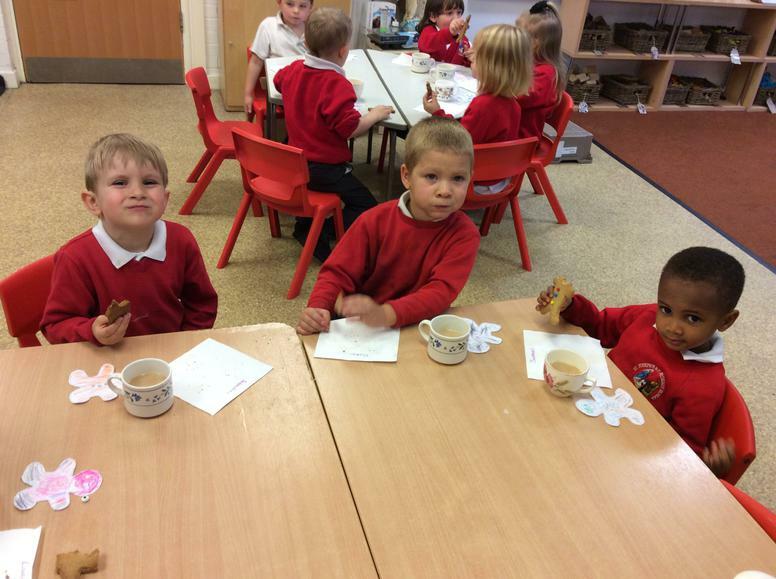 After they were baked in the oven and they had cooled we decorated them ready for Thursday. 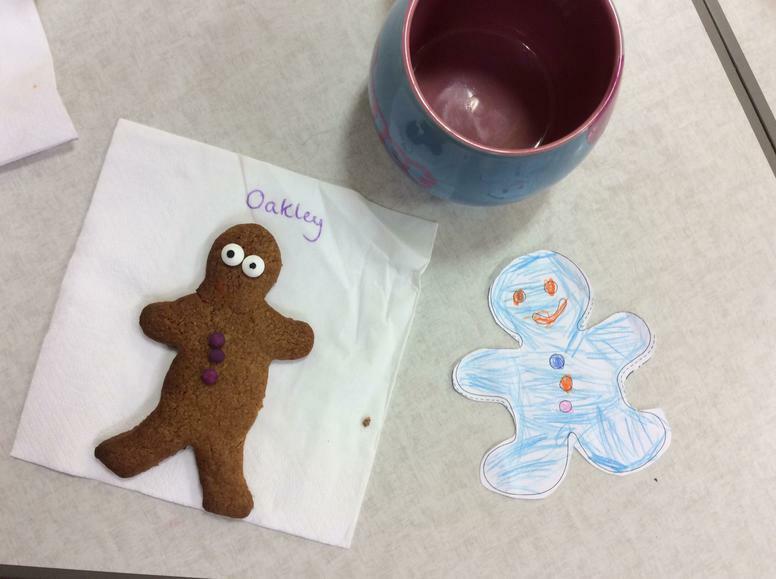 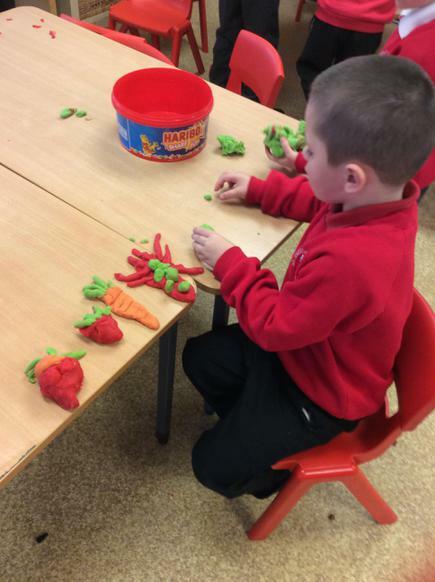 After our MacMillan Coffee Morning we had so much fun making our gingerbread men we decided to continue playing with some. 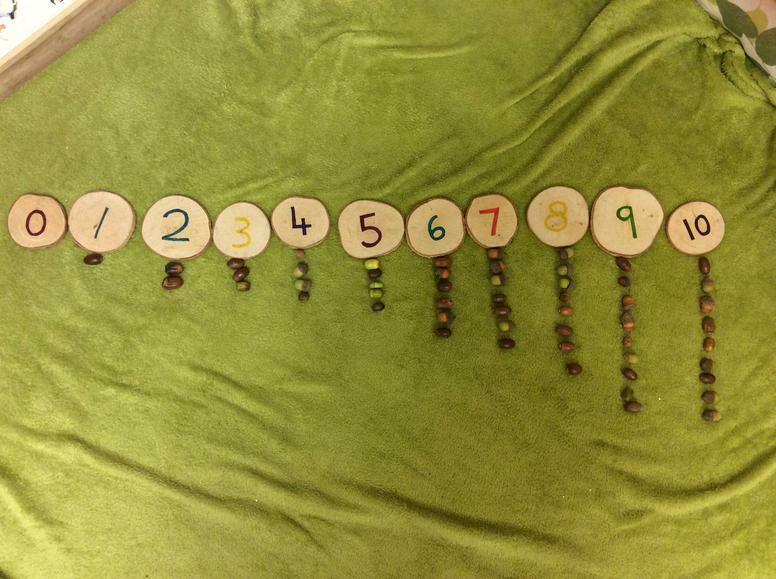 We began by cutting some out and putting different amounts of buttons on them. 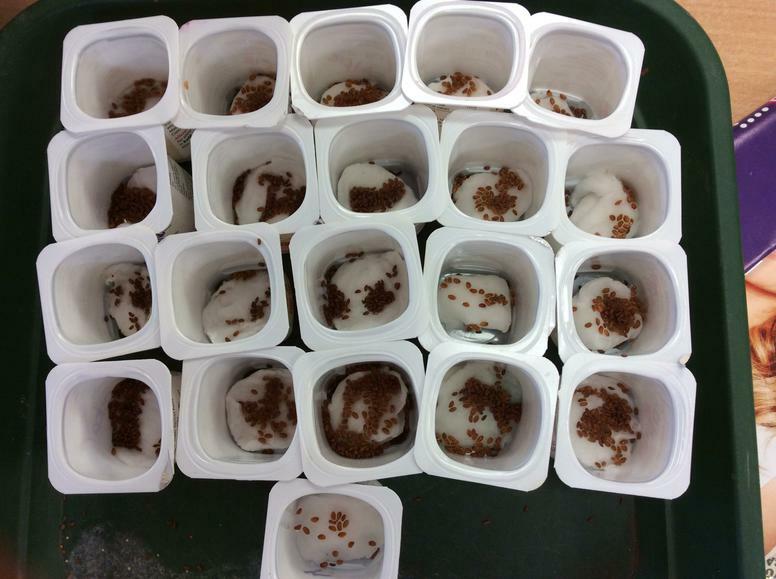 We then ordered them 1-10.